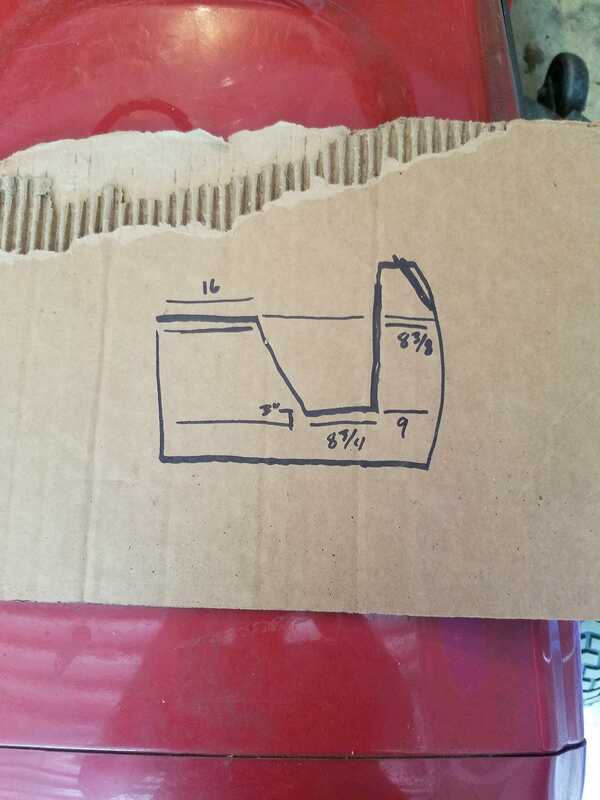 Is it offset from one side to the other, like a wedge? if so that side of the axle may be bent or its a spacer to edge the calliper over enough to fit. I didn't consider that. And no, it isn't offset, just a metal ring. The calipers on both sides seemed pretty tight regardless of the ring. 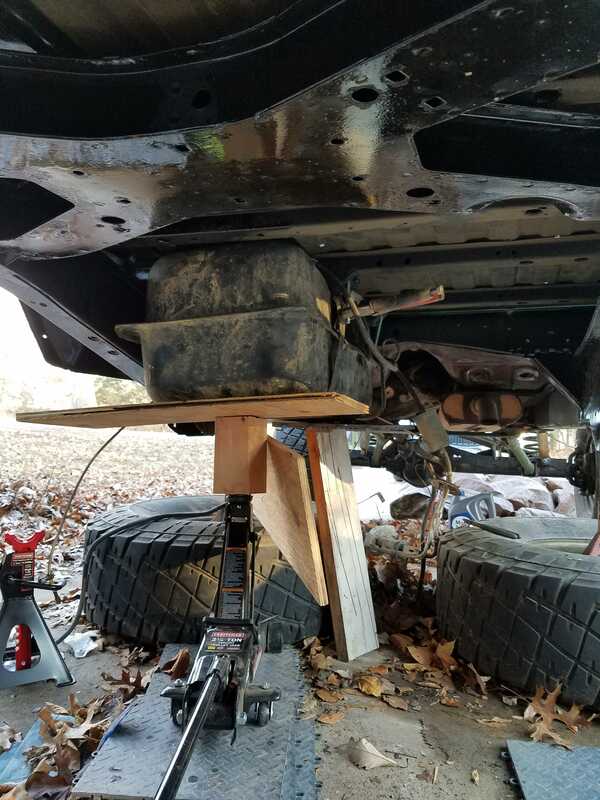 And the setup was built around the brakes so I would find it kind of odd if it didn't fit right(not to mention, it's only about 1/16th of an inch thick, if that). Today, after a lot of struggling, I managed to get my ring gear out with the locker. 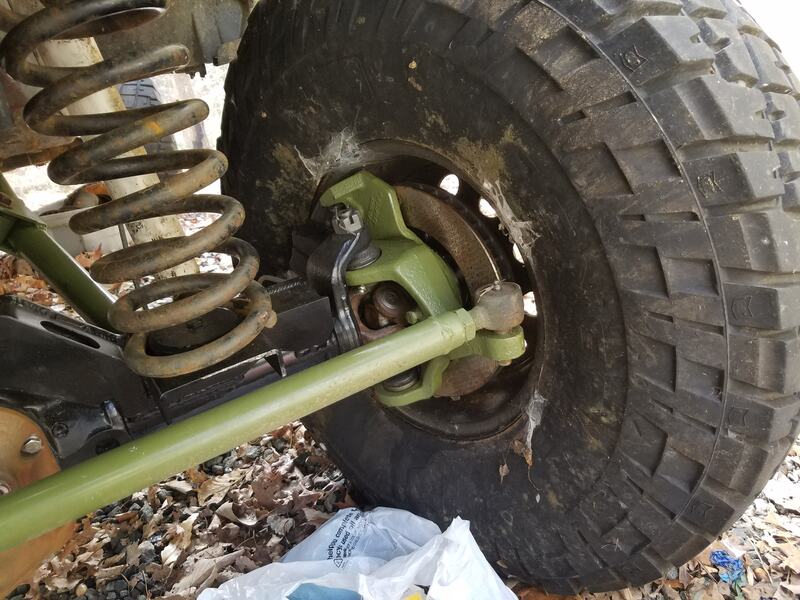 The bearings look good(not sure if I need to pack the bearings when I put it back in), but one of the inner axle seals was letting some debris by, but not a lot. 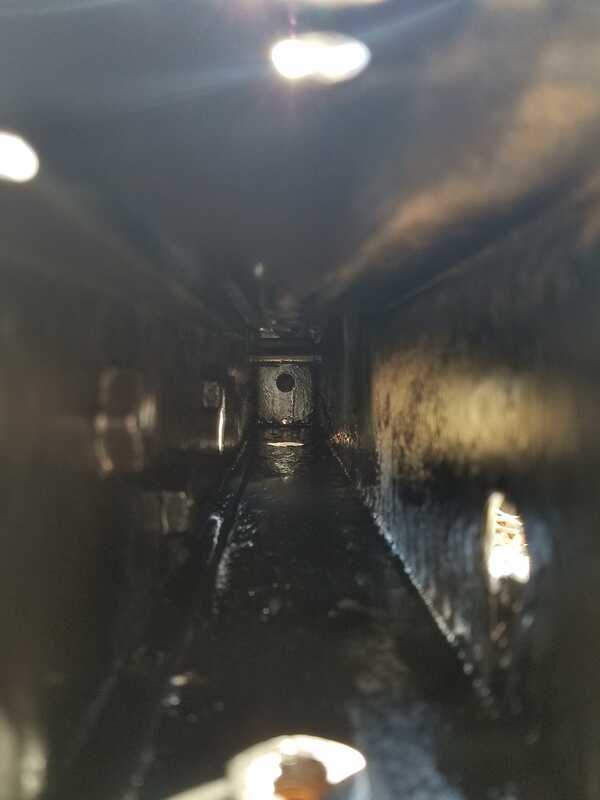 Overall, it seems pretty clean, and I think that the debris was caused by the vent tube being clogged up. In the end, I'm going to replace that seal. Now I've started to cut the old brackets off with an angle grinder. I was on edge at first, but after a while started to cut the brackets closer and just became generally more comfortable. Took a while to get through the makeshift truss and by the end of the day, I burned out one of my cut off wheels. 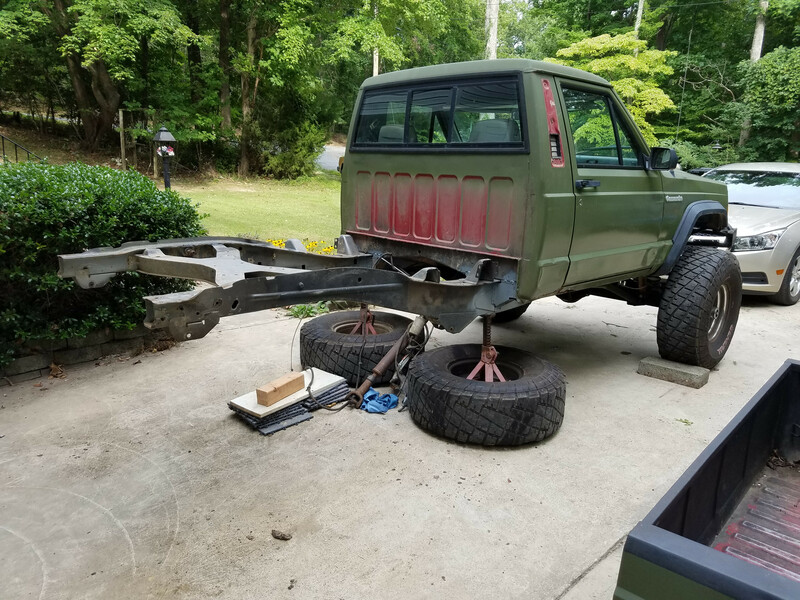 Tomorrow, I'll knock the other bracket off and start trimming them off and finishing the axle up. Then, it's on to welding and trying to get the ever expanding list of parts together. In the past couple of days, I have since burned up a few more cut off discs trying to take off all the brackets. 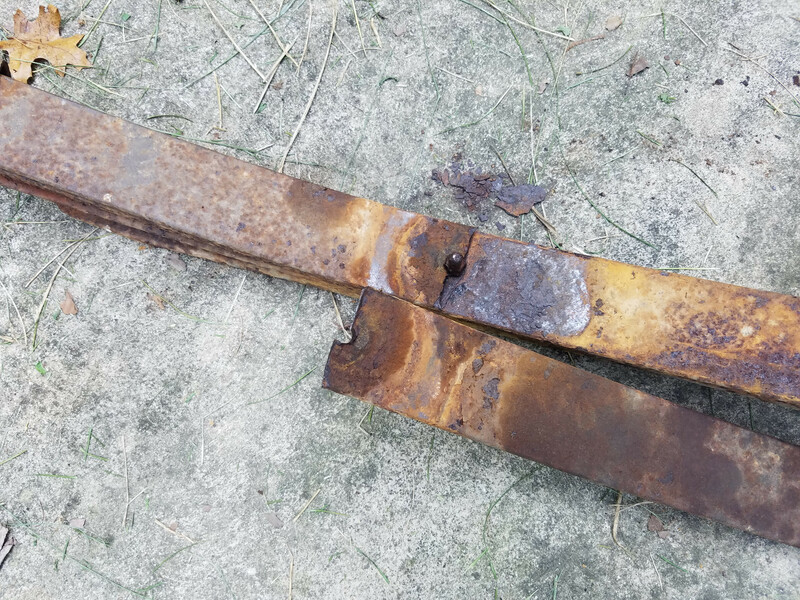 I found, as I had suspected, that the 3/8ths steel cross beam that was welded as a truss was not done properly. 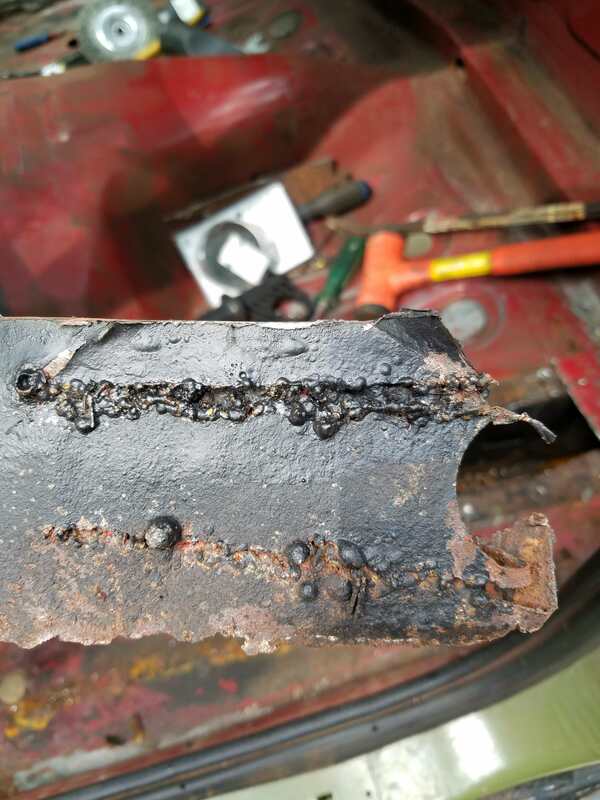 The center of it had not been welded making it slightly easier to remove. 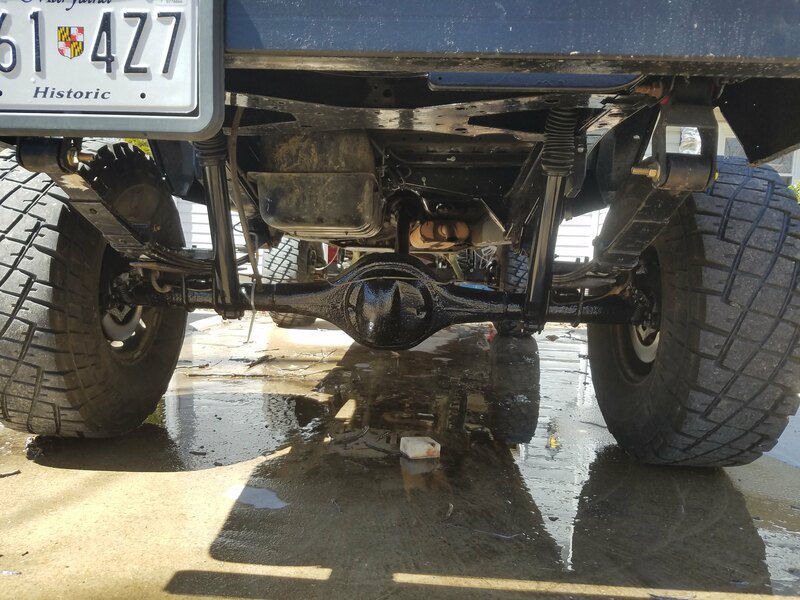 The only problem is that the short axle side was butted up against the diff housing. It's a slow process, but it will be done. Today, I managed to finish one side of the axle after cutting, grinding, and smooth sanding. 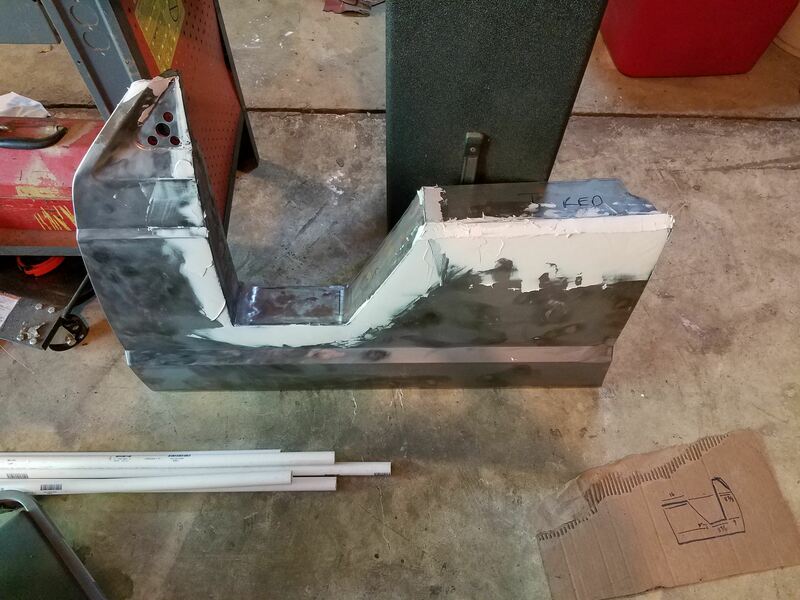 I gave it a primer coat to prevent the rusting and tomorrow I will finish the other. 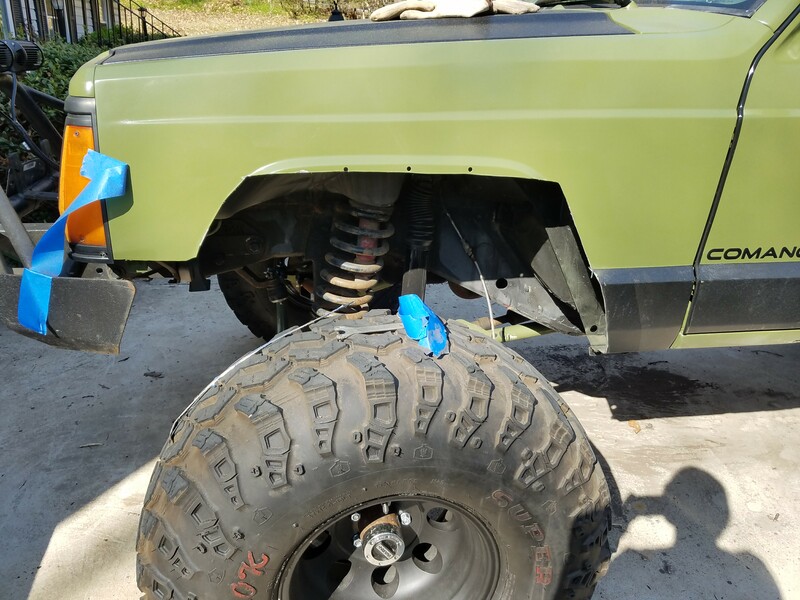 I'll finish up the knuckles and diff housing by hand at some point. And now, pictures. That was the remains of the dust shield, toss them. It's been a long while since I've posted on here, but that doesn't mean I have stopped working on it. 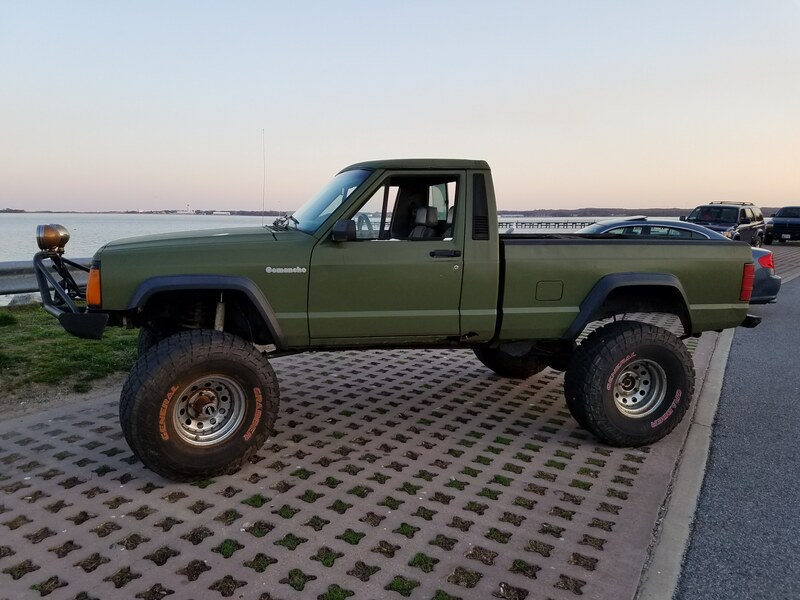 In the end, I decided not to sell the truck, since I started a new job with a higher pay grade, and went for the full repair on it. It's been very slow going and most of it is just gathering parts necessary to work on it. I'll try to give a brief overview of what all has happened. 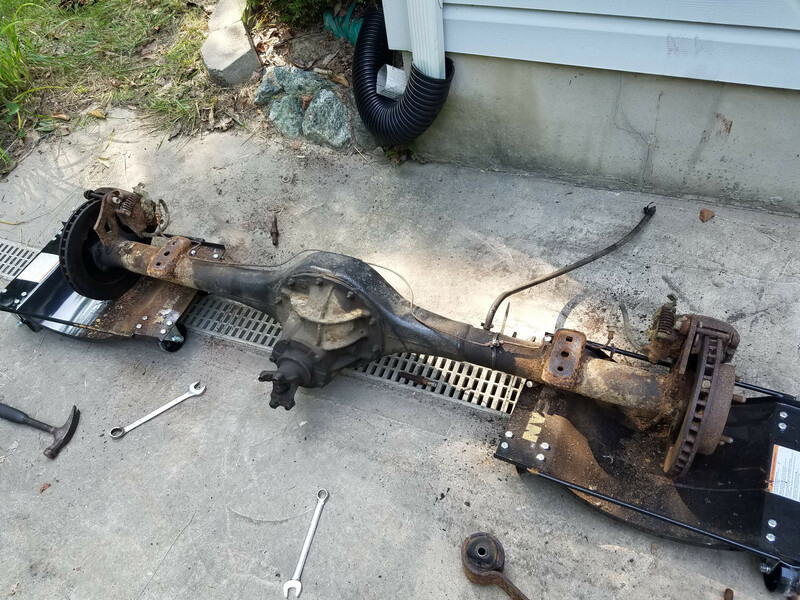 I pulled the front axle and ground all the brackets off. 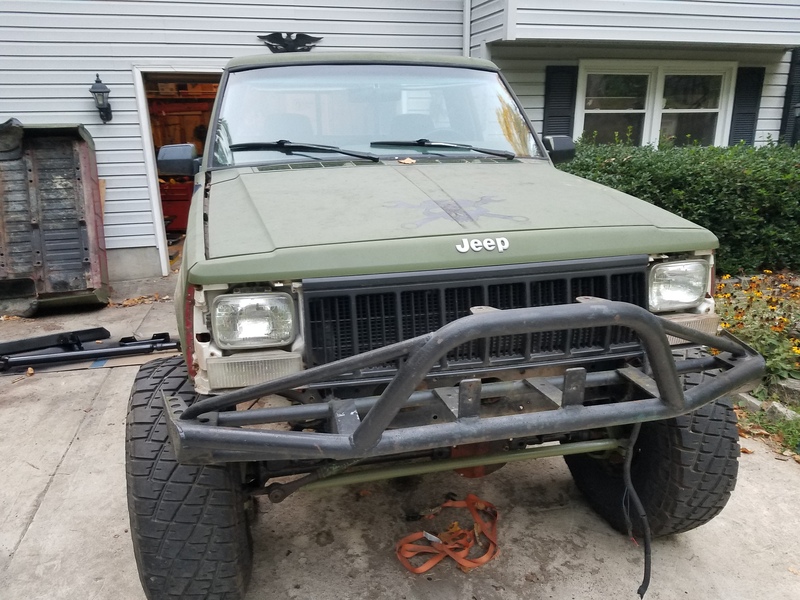 Had to order another truss for the axle(because the company sent the incorrect one) and there was a local Jeeper who welded it up for me. 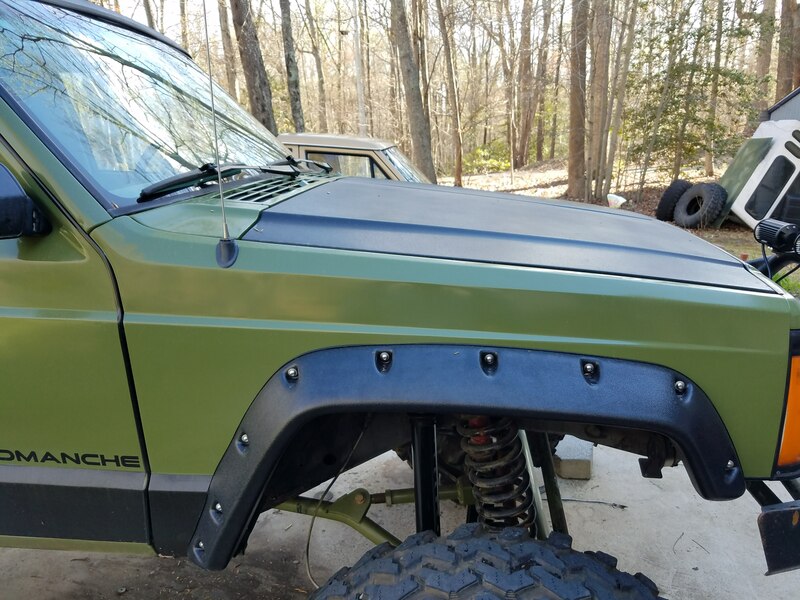 All the front end parts went to paint and I chose gloss black for the axle housing and the army green for the suspension components and the knuckles. It was hell to find parts for the thing that fit since so many companies claimed it would work for the older D44 but later revoked that claim. 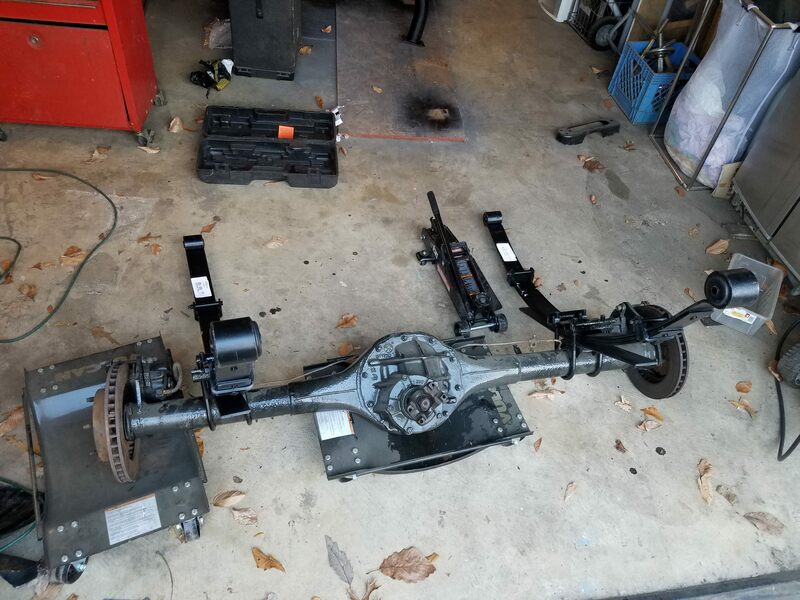 Eventually, I found the lot of the parts, but every time I went to work on the axle, something else would be messed up and I had to order more parts. In the end, I ended up having to replace almost all of the components. 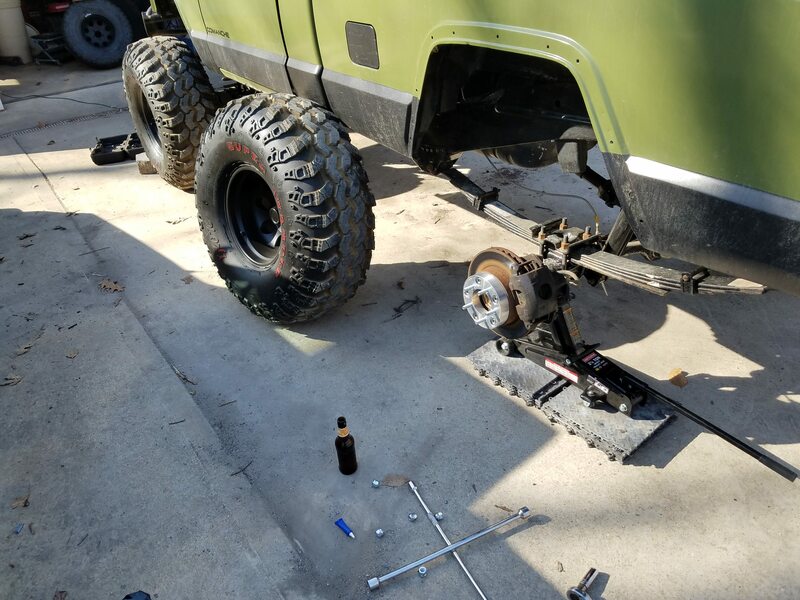 I started to piece it back together by reinstalling the gears and torquing down the diff bearing caps. It took a while to find a set of bearing cap bolts that actually worked, so now it has studs on it. I have a new Riddler Diff cover for the whole deal that I've loosely installed until I can get the vent hole figured out. I installed new brake calipers since the old ones were very worn out. 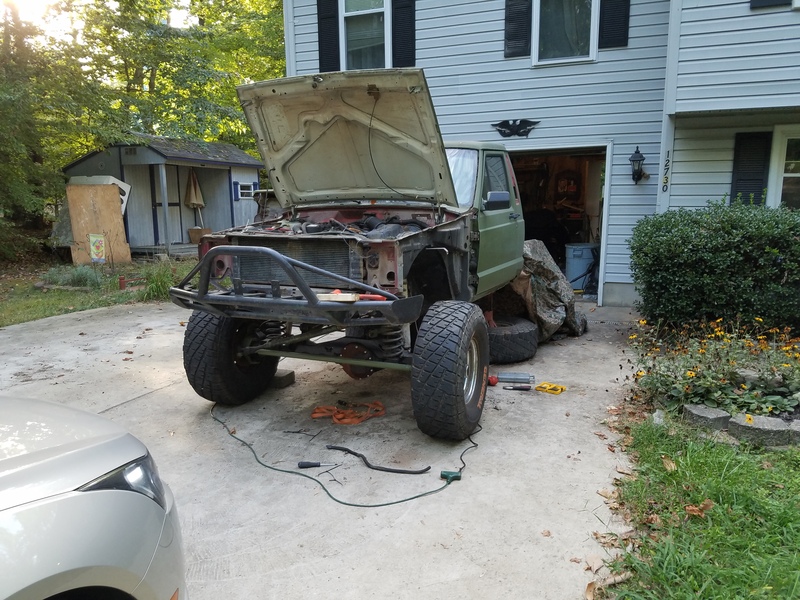 What I have left to do for it is to relocate the breather vent, get a ball joint press, and reinstall all the suspension components. 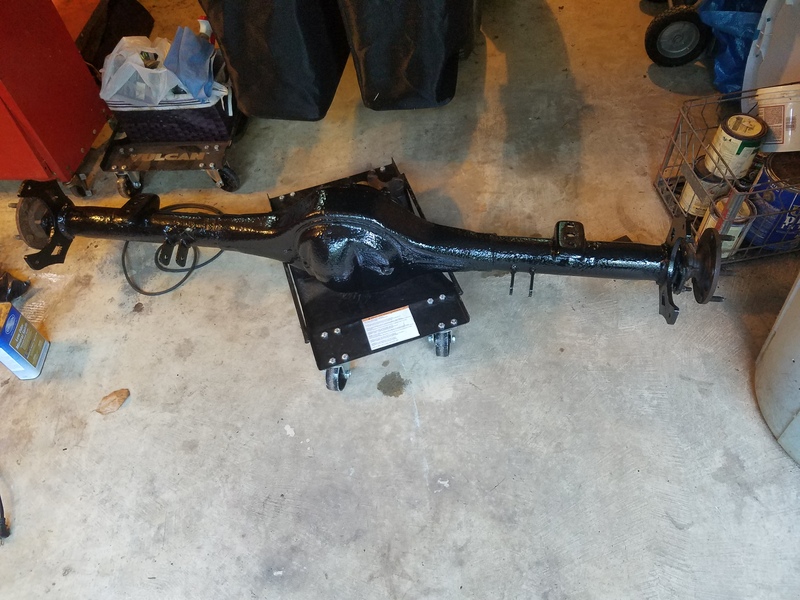 Once it is mock mounted I can get measurements for a panhard bar and she should be ready for the next stage. 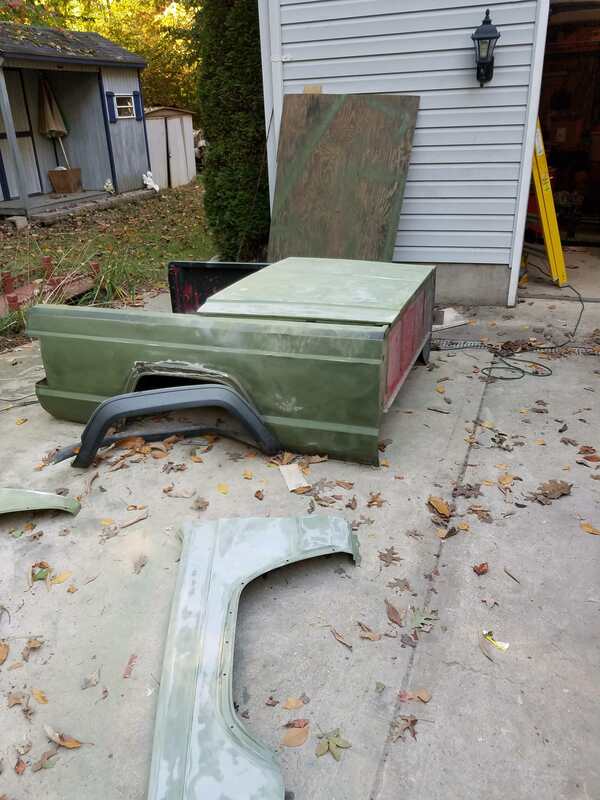 Now if anyone remembers when I wanted to sell it, you may recall that it had a lot of body rot to it. 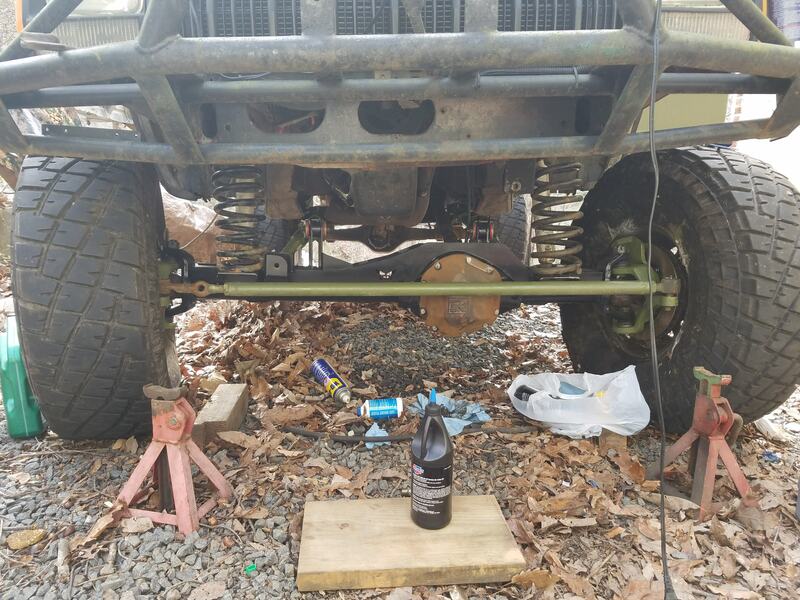 So this axle rebuild is only a stepping stone to the next part. 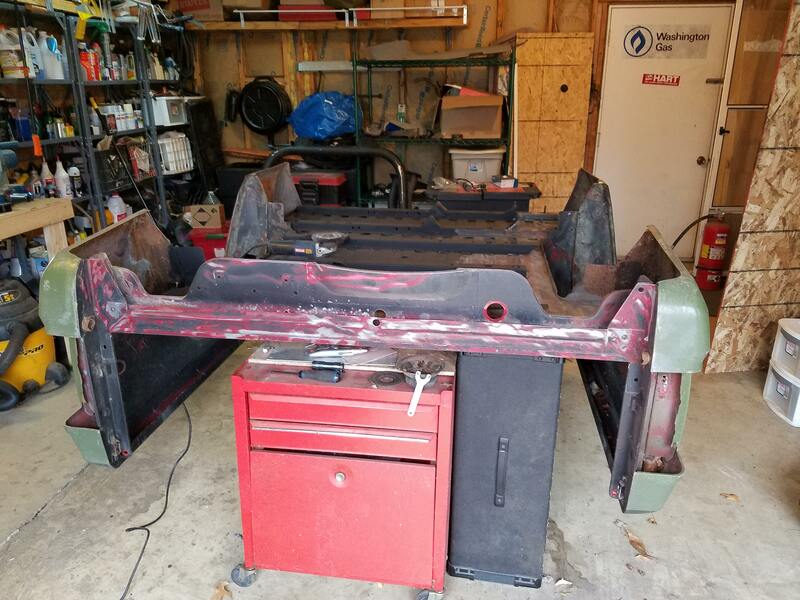 I ended up getting a frame rail set from the middle of the cab back and currently have that in waiting to replace my rusted out rear rails(in addition to some doors that I will later turn into trail doors). 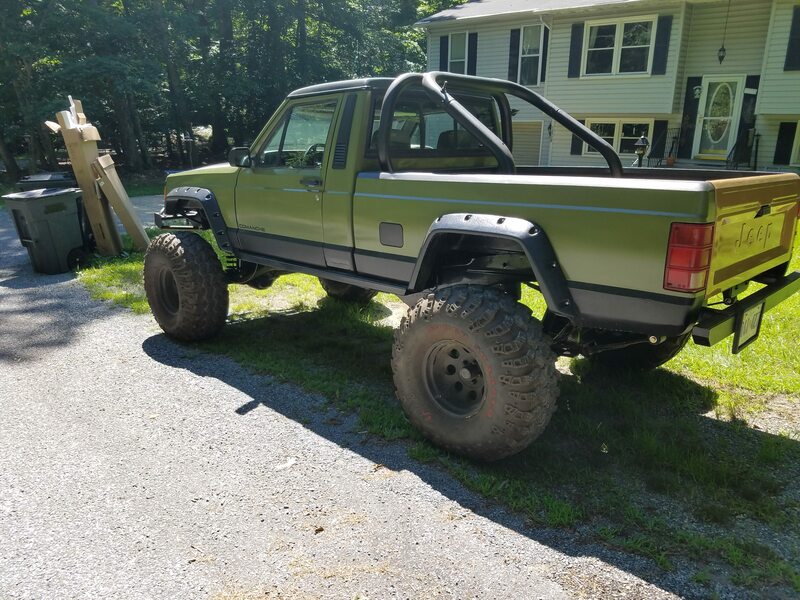 But the best part of the whole deal here is that, despite how unusual and costly a Comanche is, I managed to find someone in my area selling one. 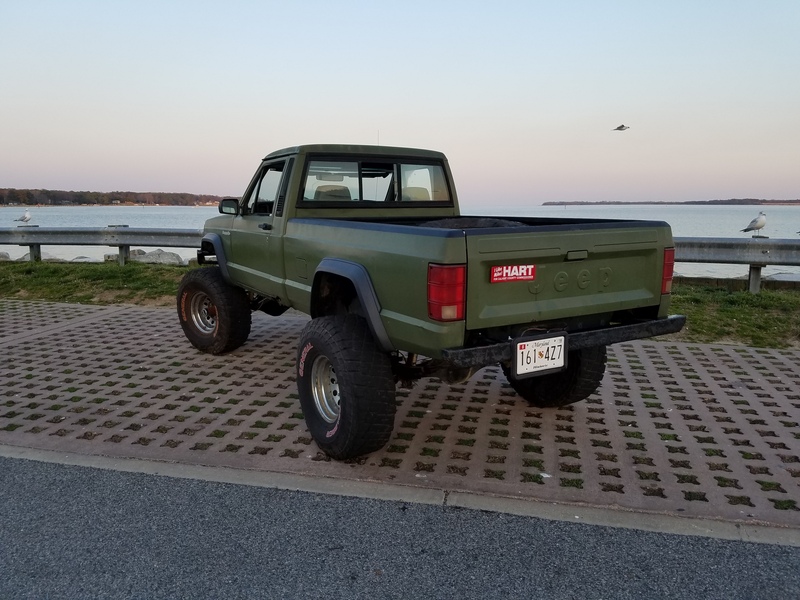 The truck itself is all original, since I bought it from the original owner. 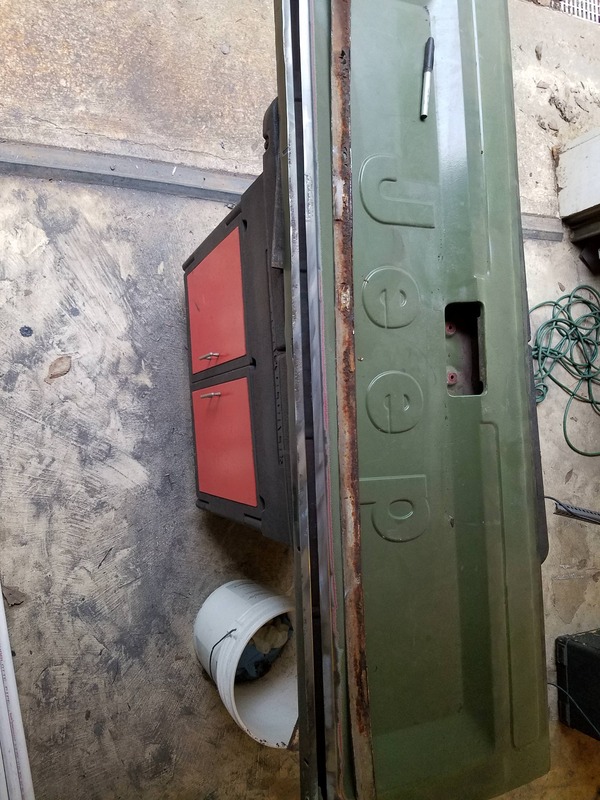 It comes with literally every receipt from repairs and it is in fantastic condition (garage kept it's whole life). So the plan once I get the old up and moving is to transfer all the parts over to the newer better condition one and systematically restoring parts as I go. I hope to get underway with that before the end of the year. 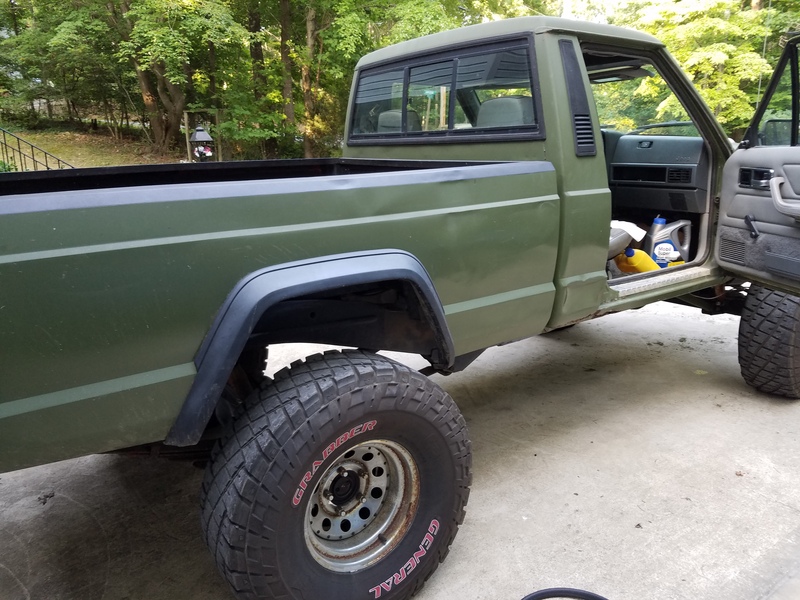 Been a while since I've updated, but a lot has happened with the truck. Now when I last left off, the axle was planned but not finished. 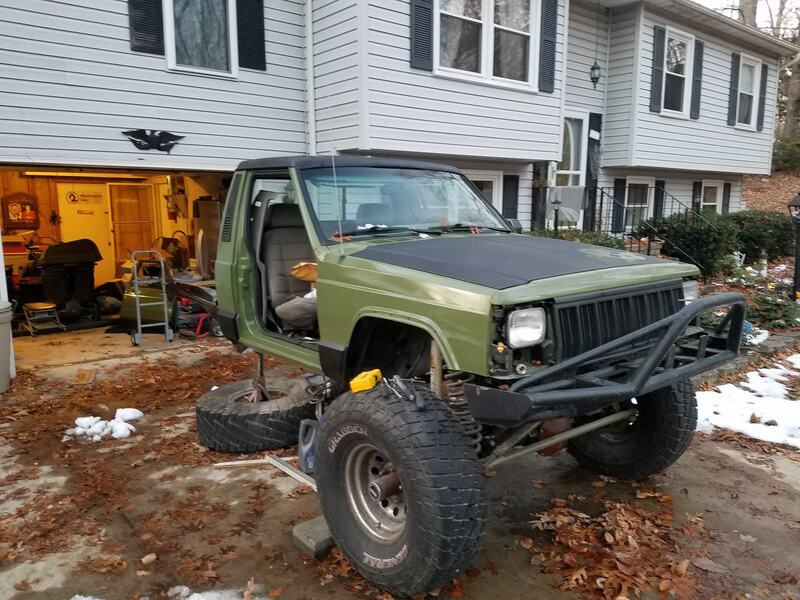 Maybe a month later, I finished the rebuild on it and got it all bolted up. 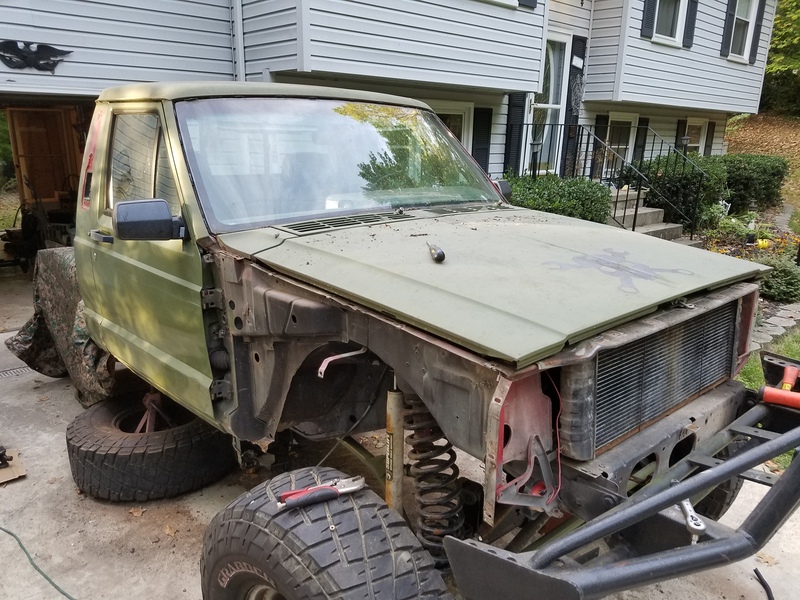 I ended up having to replace every SINGLE part up front. That in and of itself, was a nightmare. 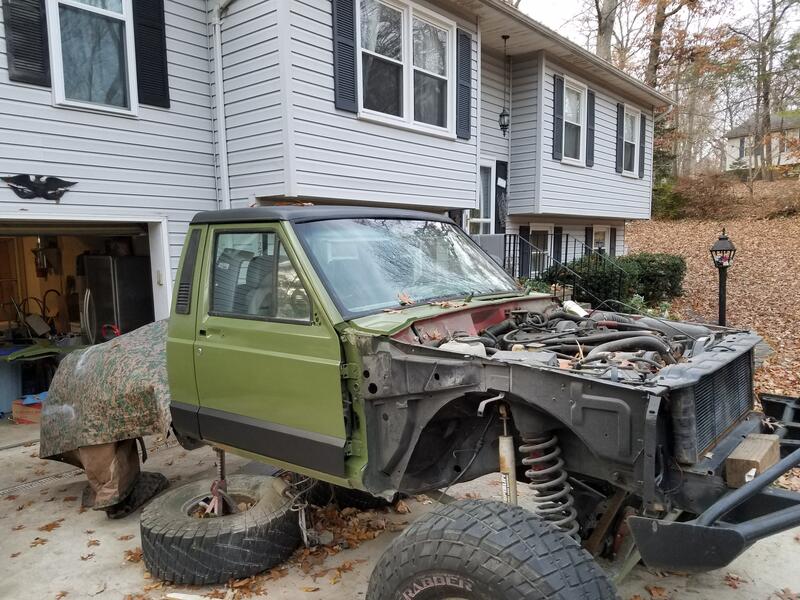 The plus side is that it meant all fresh parts. 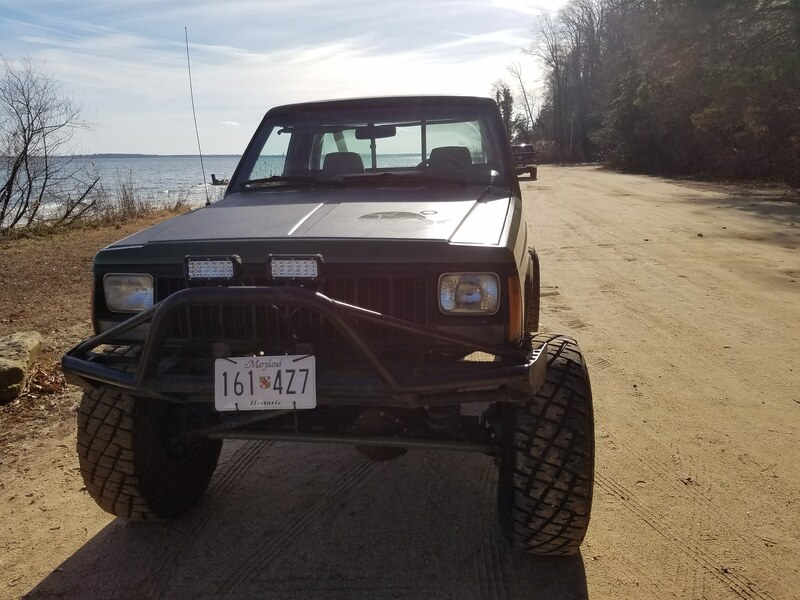 It took a while to get it together but eventually I got it back on the road(I'llbeit for a very short amount of time before it went for major surgery). So now the biggest issue was the frame. The passengers side leaf had collapsed into the frame by an inch and was quickly becoming worse. 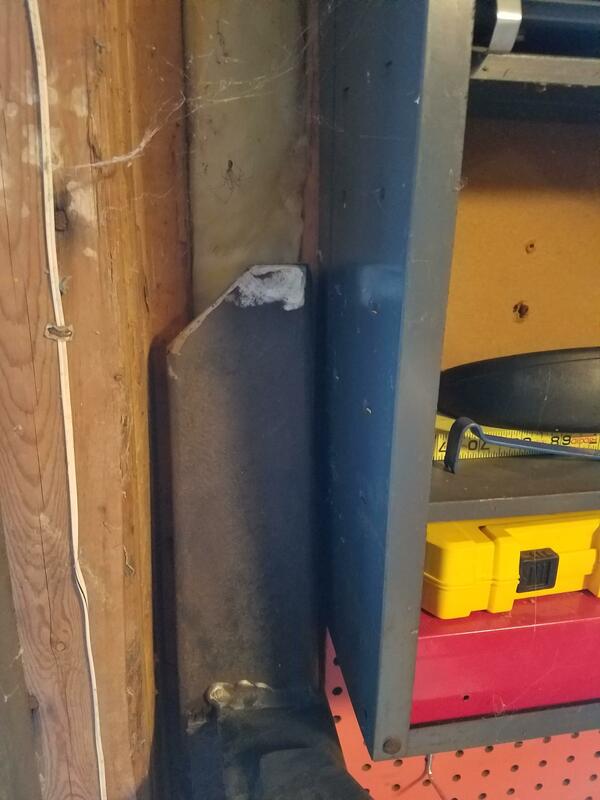 To the point where the whole hanger was separated from the frame. I tried for many weeks to find someone who could do the frame splice, but no company was willing to do it. I rummaged through various contacts and nothing panned out. 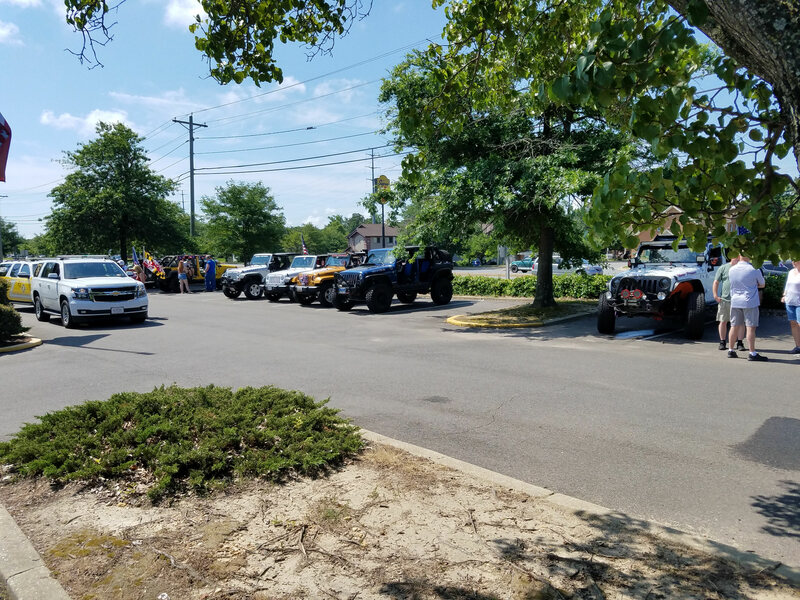 Eventually, however, a local group here called SOMD Jeepers got me in contact with some guys who were very proficient in welding and had done frame splicing work in the past. 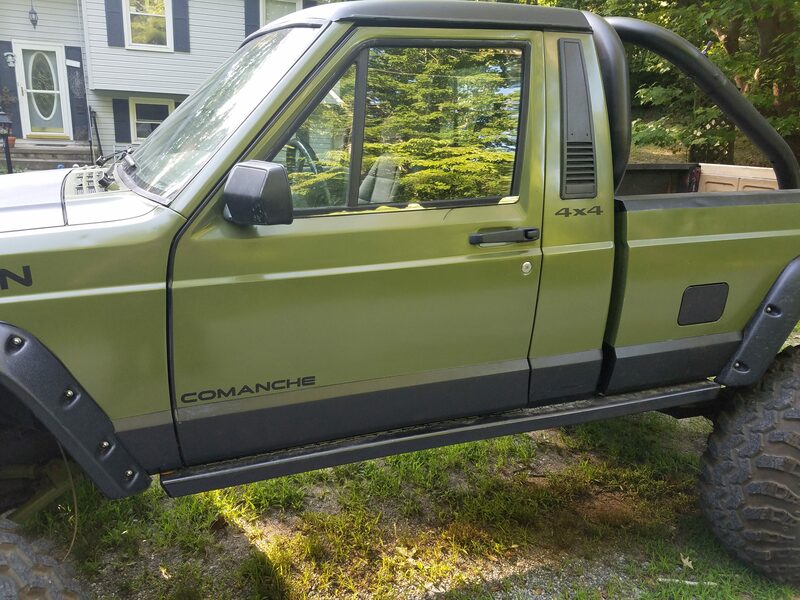 I contacted them and after about a month, I had my truck back with a new lease on life. 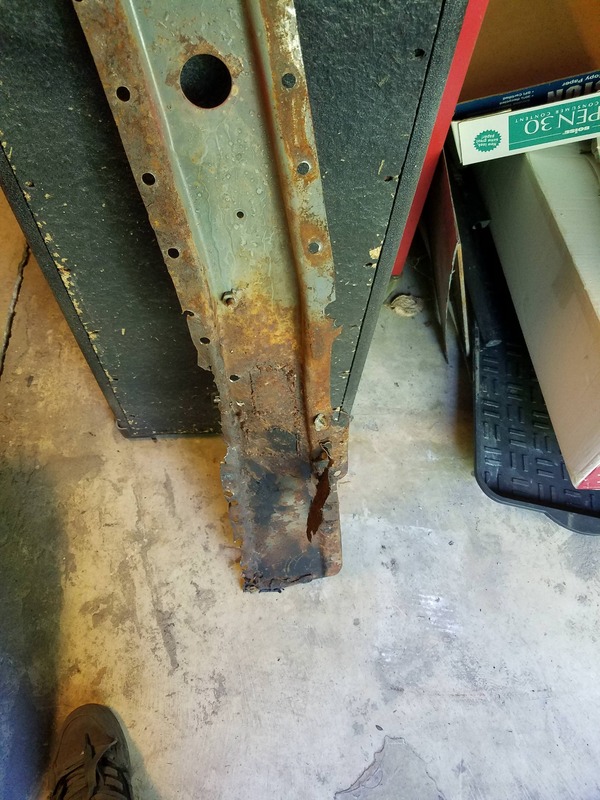 After that ordeal, and getting a peak into the newer, less rusted frame rail, I could see the tell tale signs of rust starting in the new ones. It isn't much at all, but enough that I jumped into the next stage of my plan. 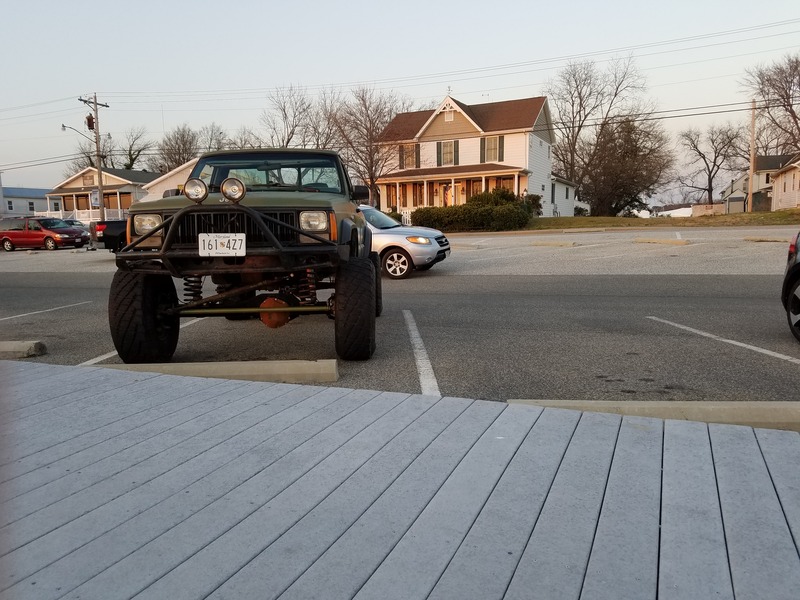 So after a few weeks of driving it, I parked it and stripped the whole back off of it to grind out the frame rails and properly coat them to prevent future rust issues. 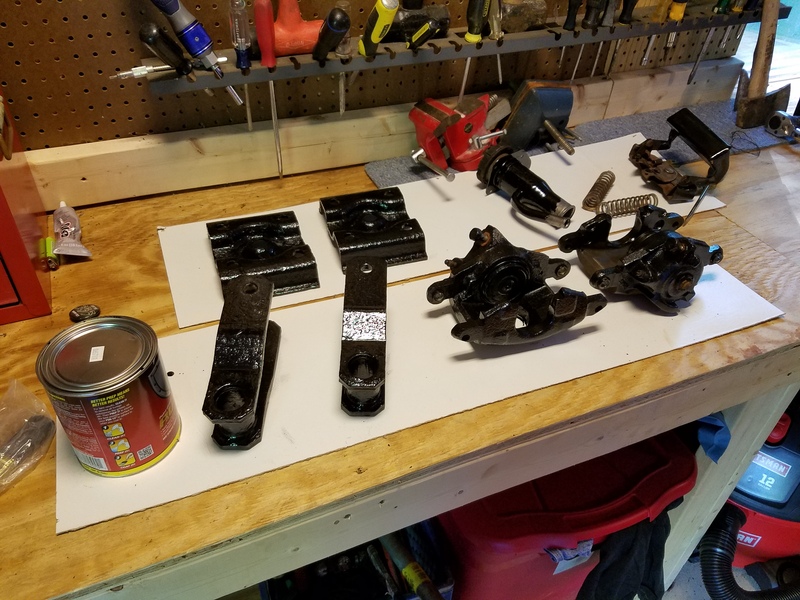 In addition to this, since the equipment was already removed, I am also grinding the suspension components, brakes, and axle out and hitting them with a few coats of POR 15. 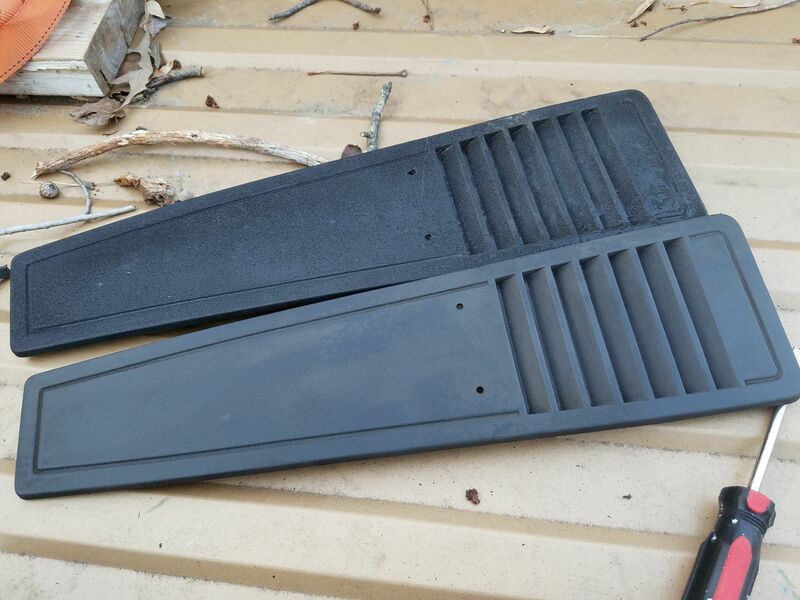 The passenger side leaf spring, when it was detached, was found to be broken in half at the top piece. The u bolts holding it on were beyond removable, so I cut them off with an angle grinder(cheap replacement). 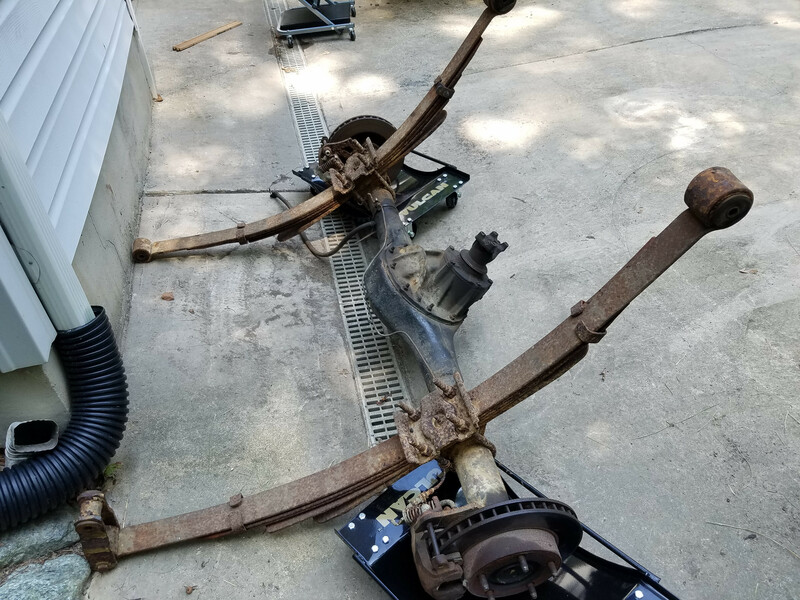 I disconnected all parts to the axle and have since ground it down to base and coated it with POR 15. 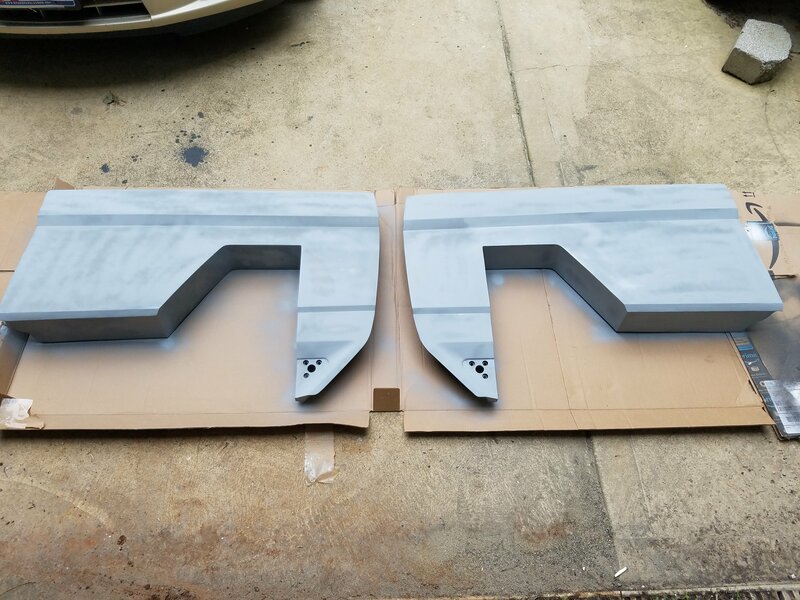 I also sanded the calipers, rotors(centers), shackles, tailgate latch handle, and spring plates down to be painted. 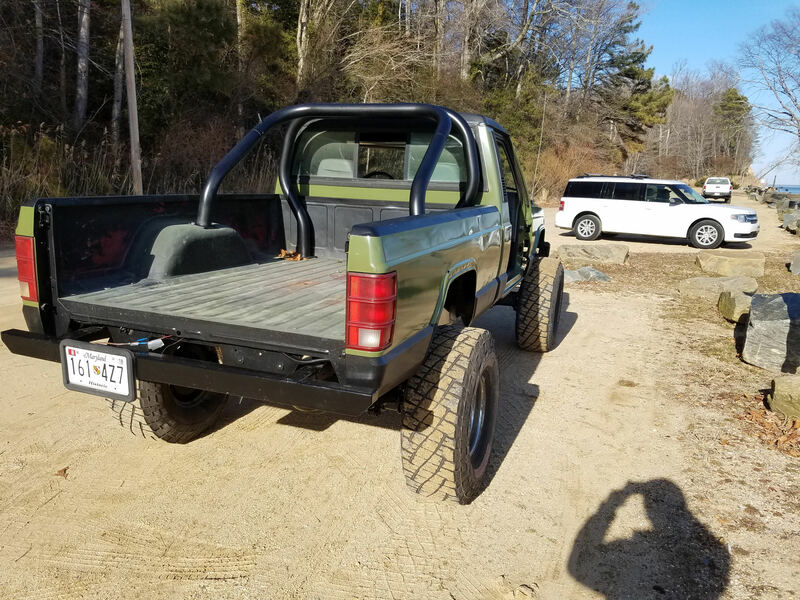 My goal in addition to getting the rear up to standard is to repaint the truck while I have the bed off as well. 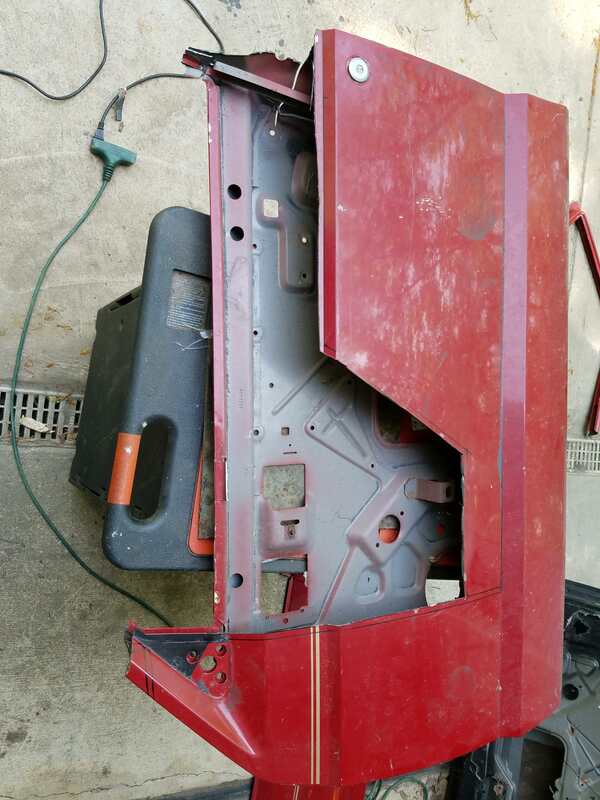 The paint has been really fading and cracking for a while, so while I have access to the rear cab panel, I'm going to sand and repaint. 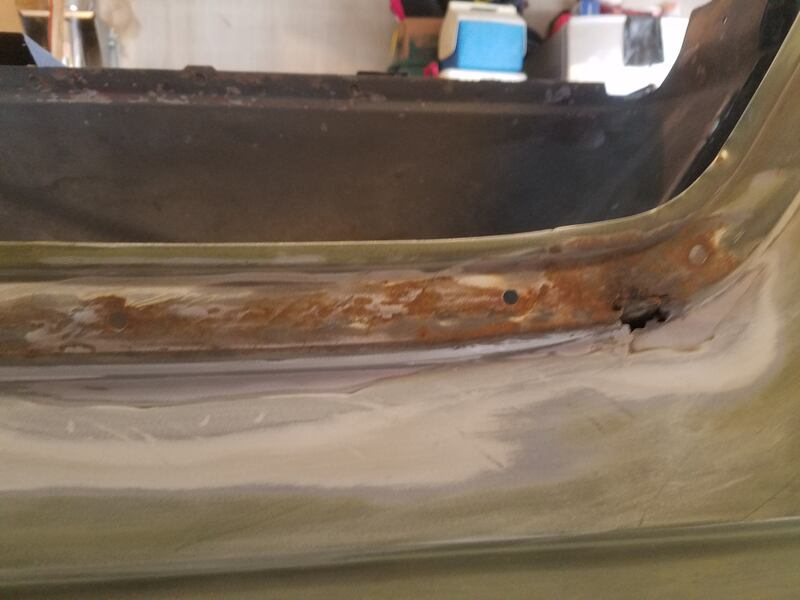 I have to figure out how to sand out the interior/fender section of the bed that has started to rust, but hopefully, I'll come up with something for it. 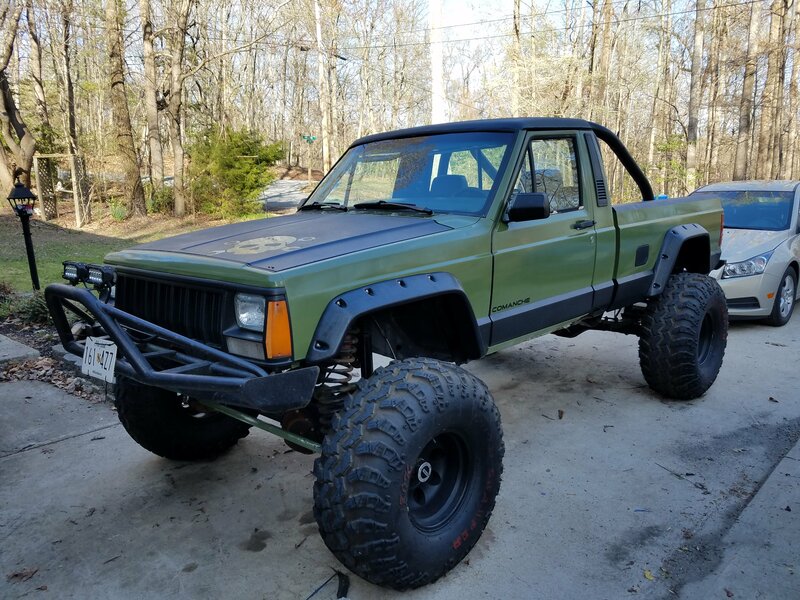 I will also be bedlining it and my other gold Comanche. 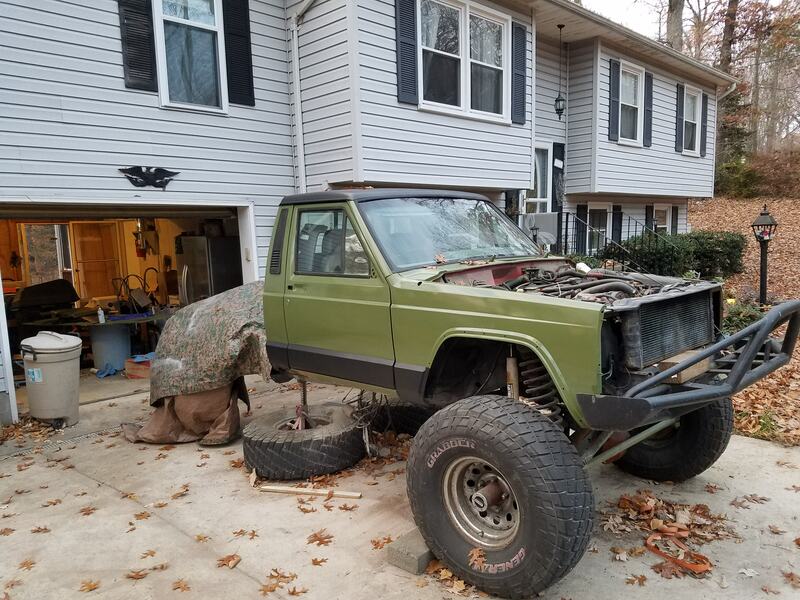 All in all, it will be finished pretty soon and then it's on to getting the clutch replaced. I would post more pictures, but they are all too big since I can only upload 1.9mb. 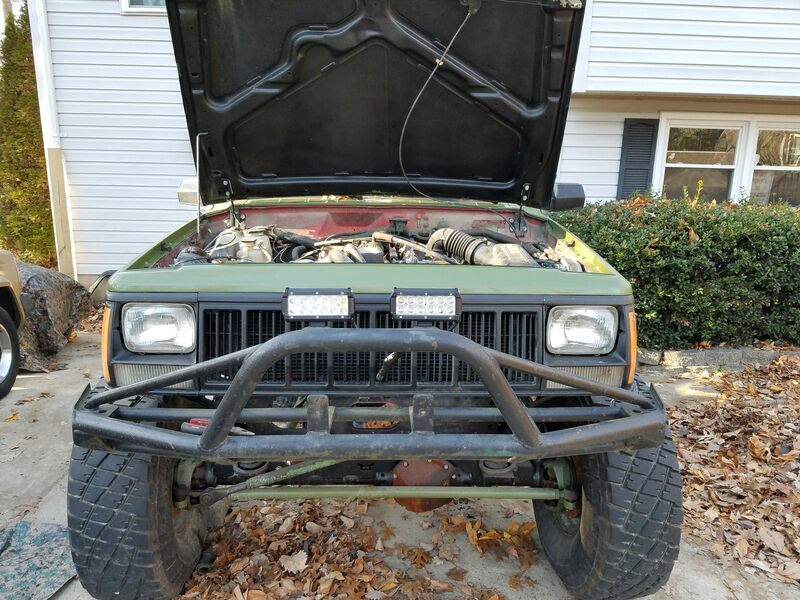 I uploaded a pic of when it first got back on the road before its surgery. I'll try to post more pics later once I figure out how to dumb them down a bit. As promised, here are the pics with some captions for detail. A pic of the repair that was done for the frame splice. 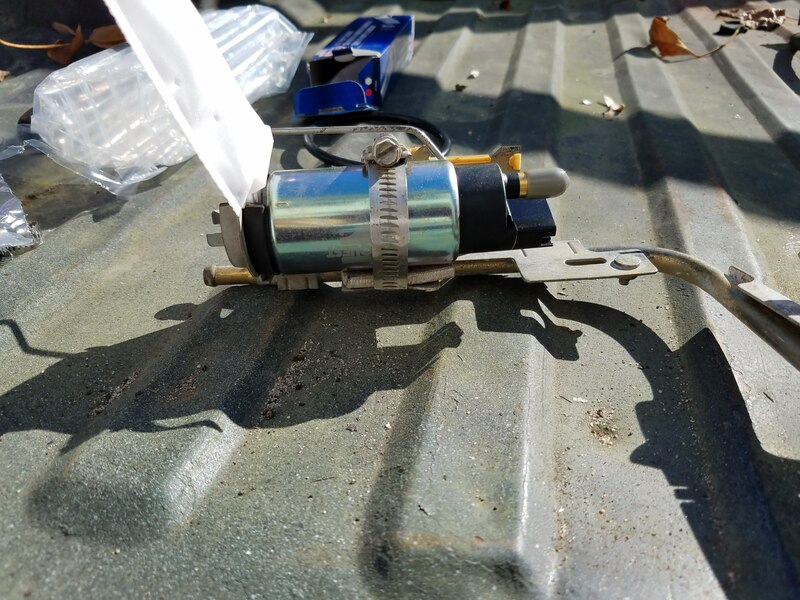 It has another fish plate on the inside as well. 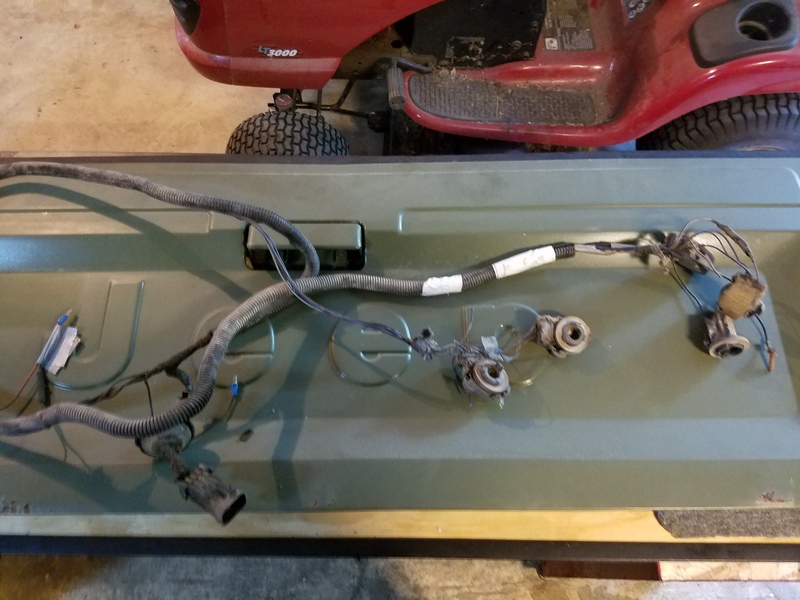 My nightmare of a wiring harness. 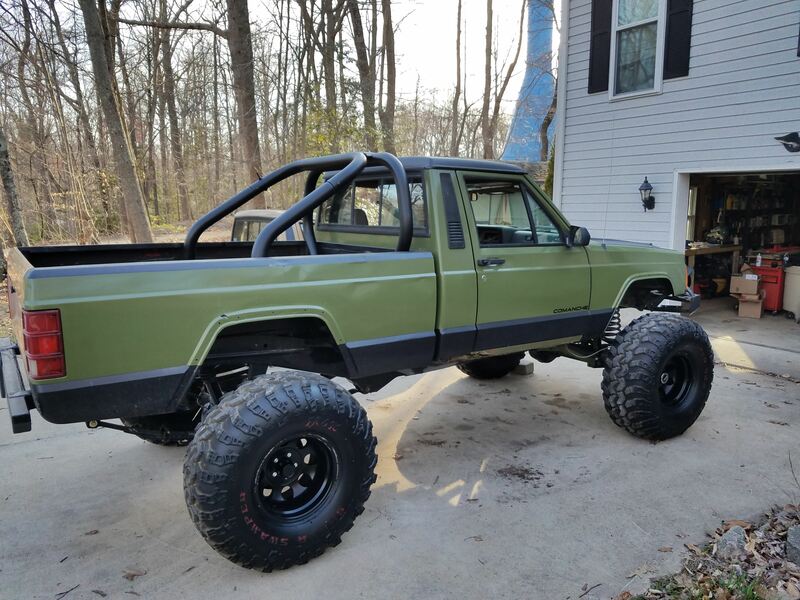 Need to build one or find a new one. Bonus picture of my workbench project. 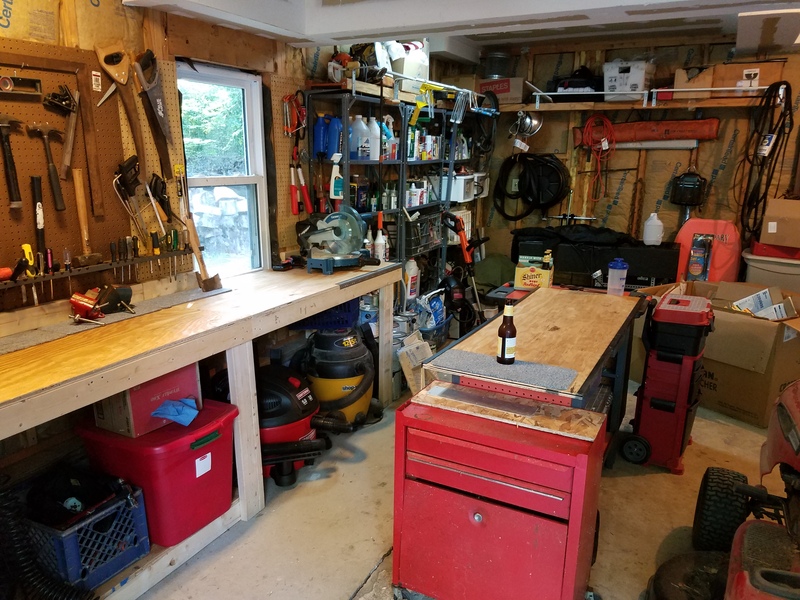 Before I started any more work on the truck, I needed work space, and this is the first house I've been in with a garage, so I made the most of it. After the bed was removed. 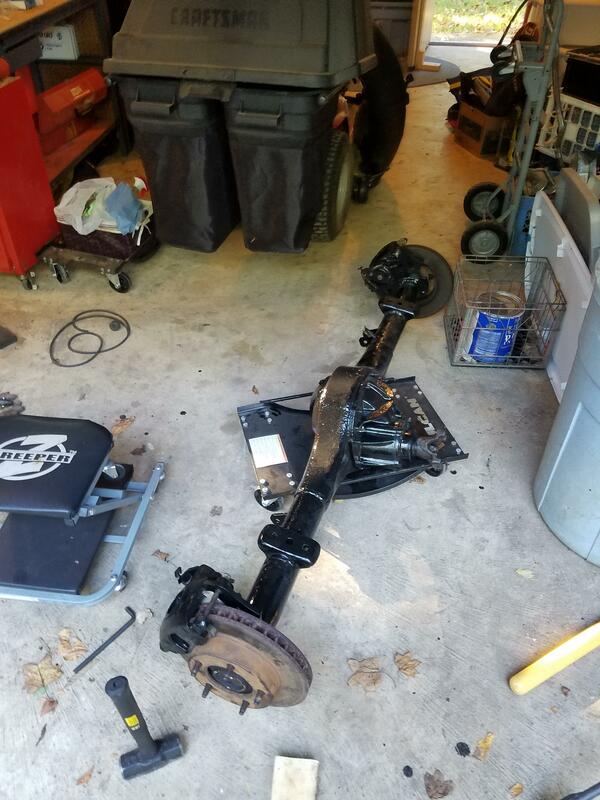 The axle after being broken away from the suspension components. The bed itself, which will require its own heavy work days. 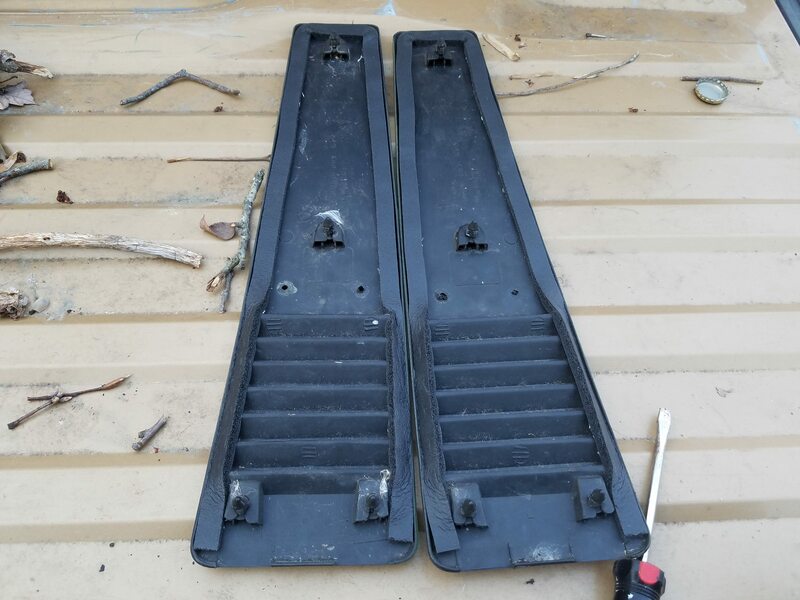 Broken leaf spring that I'm having trouble identifying. It doesn't look like any Comanche spring out there. 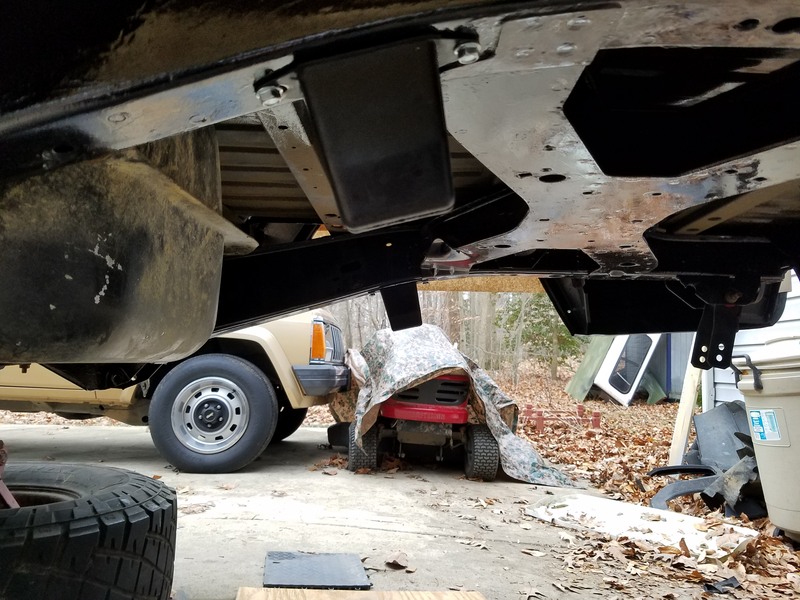 A few new updates as I've been working on the truck. 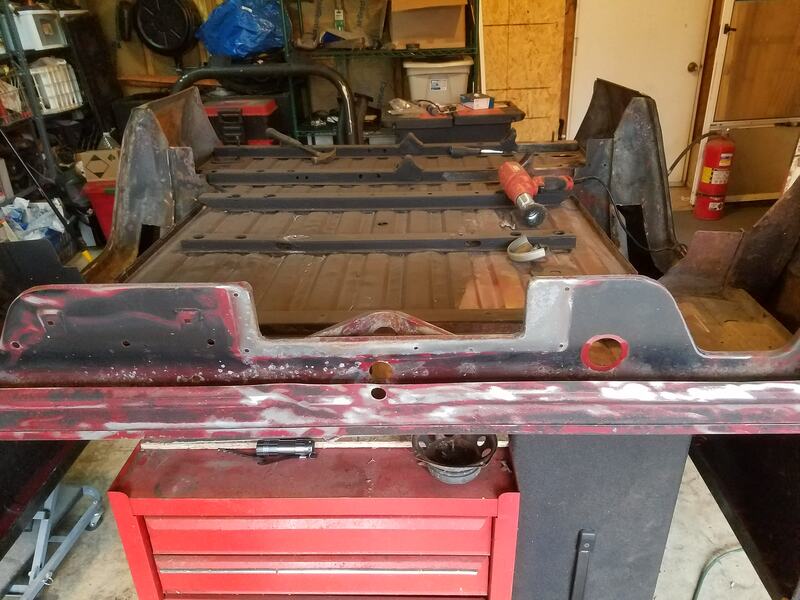 The frame rails are primarily done. I need to finish the coating a bit more on the interior, but after that, they should be good to go for many years to come. 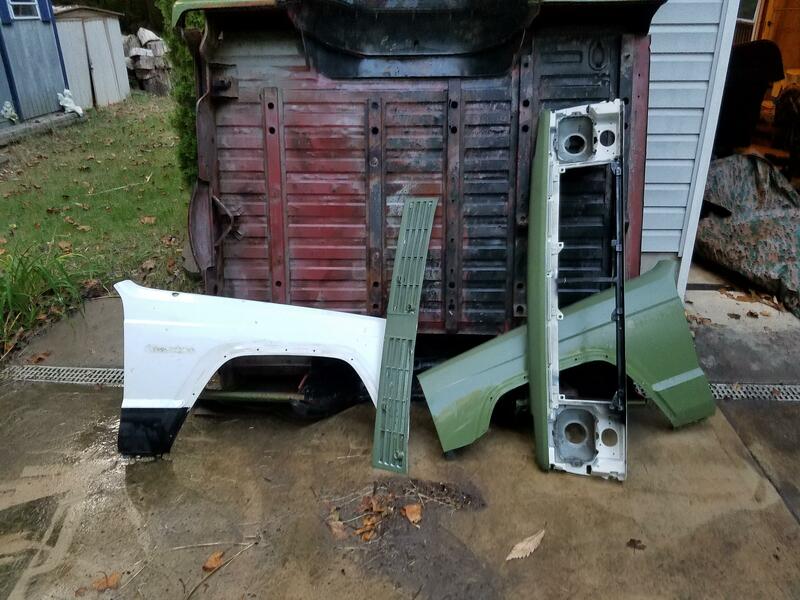 Another part of this whole process was to dismantle the body pieces and repaint everything since the old green was cracking and failing. 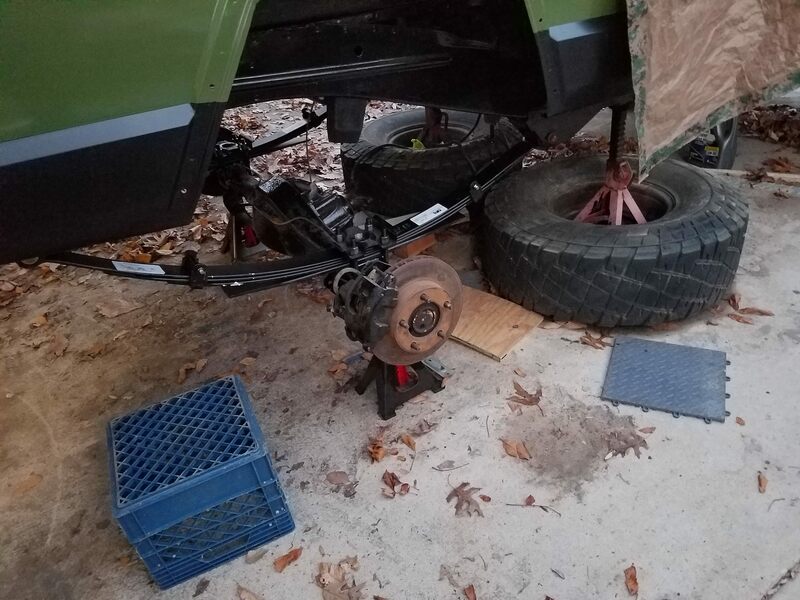 I managed to get the brakes and rotors back onto the painted axle and the e brake parts reassembled(with a lot of effort). 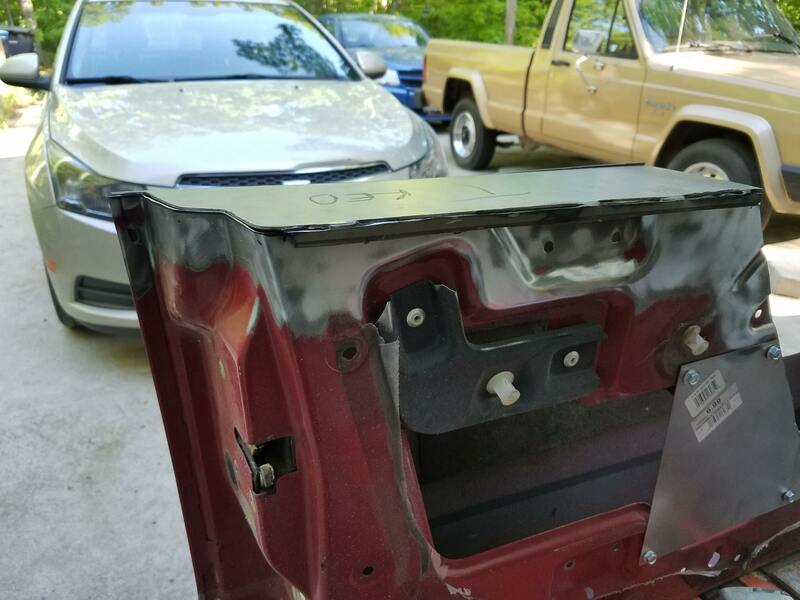 So to pass the time, I jumped to sanding the old paint coats off and getting it all cleaned up. A look at the horror that is the bottom of the bed. I've lost 4 of the 8 mounting points on it, so this'll be a bit of work. A pic of the "tool" I created to clean the inside of the framerail. 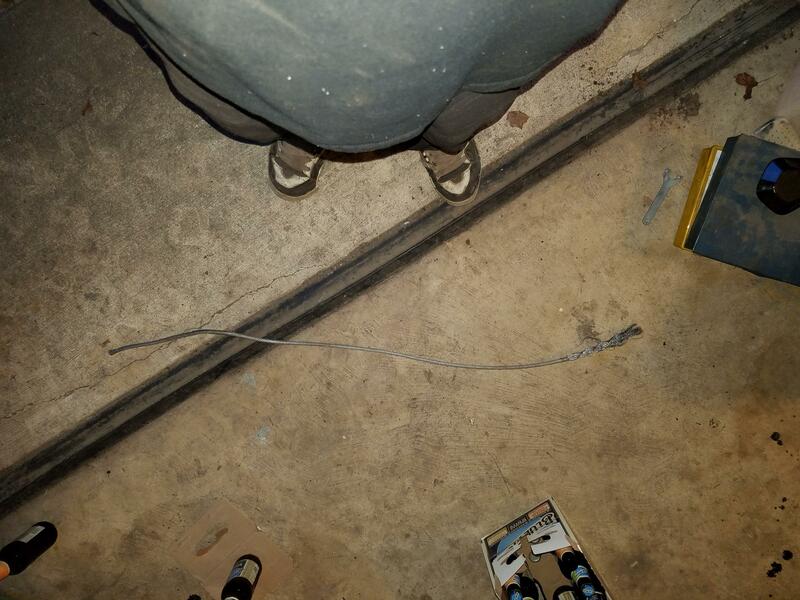 I took a braided wire cable with a plastic wrap and stripped the plastic about 4 inches back on one end. Then frayed the strands a bit and, voila, attach it to a drill, thread it into the frame and let her rip. 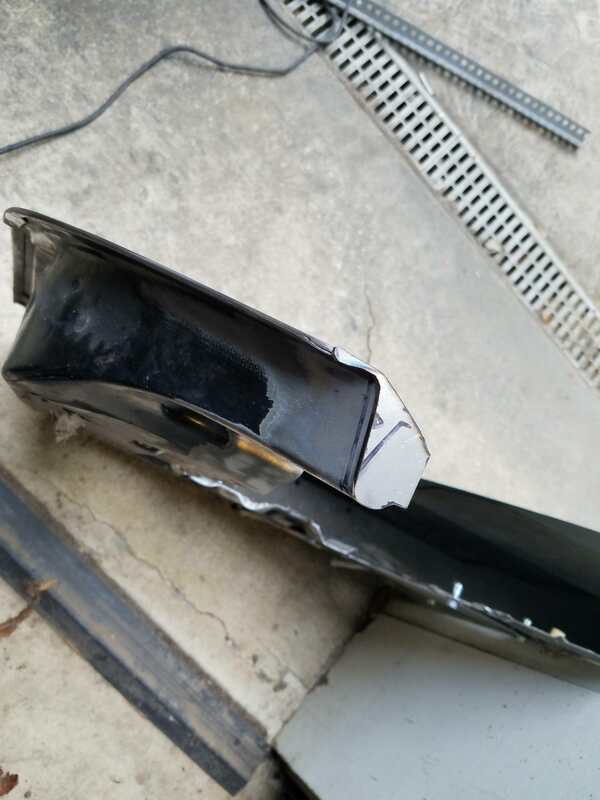 A pic of the rocker damage... It's the same on the other side too. 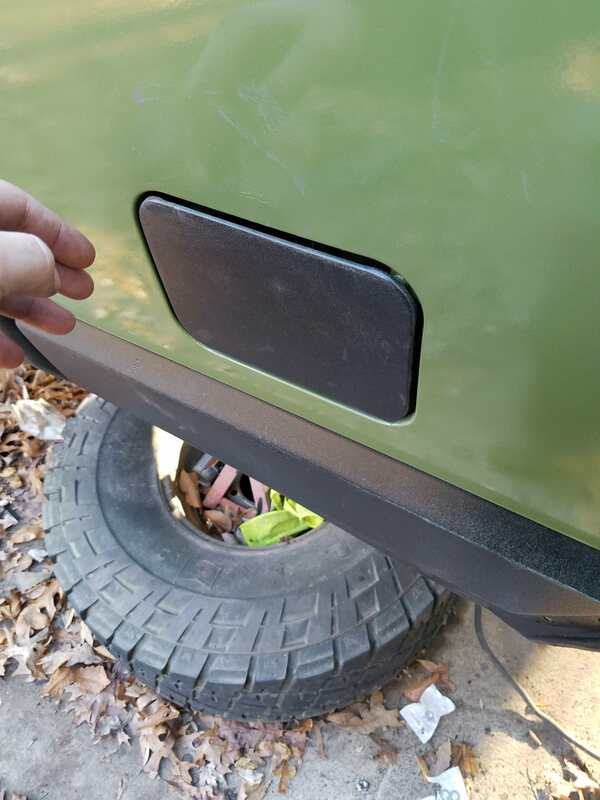 The tailgate had some bulges under the paint at spots so I sanded it all down to take a look. 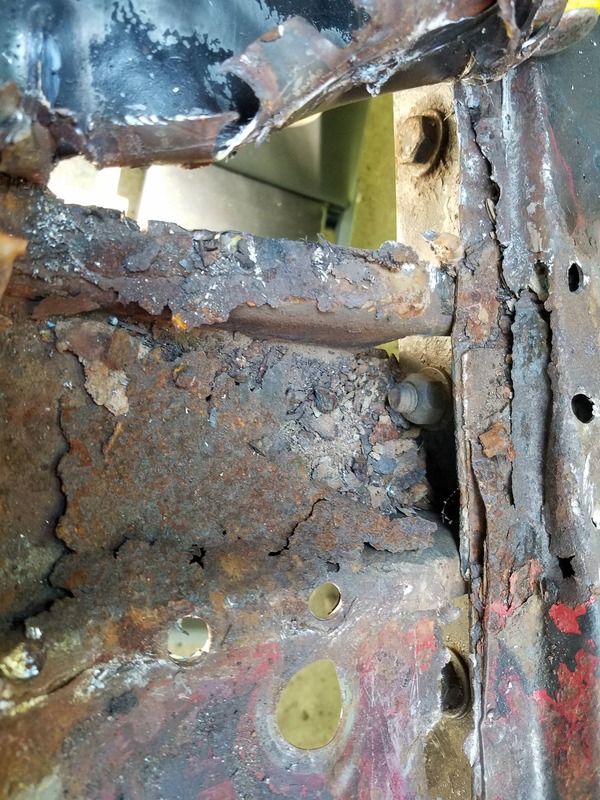 Someone did repair work to it before, but didn't properly prep the metal afterwards and it rusted through again. 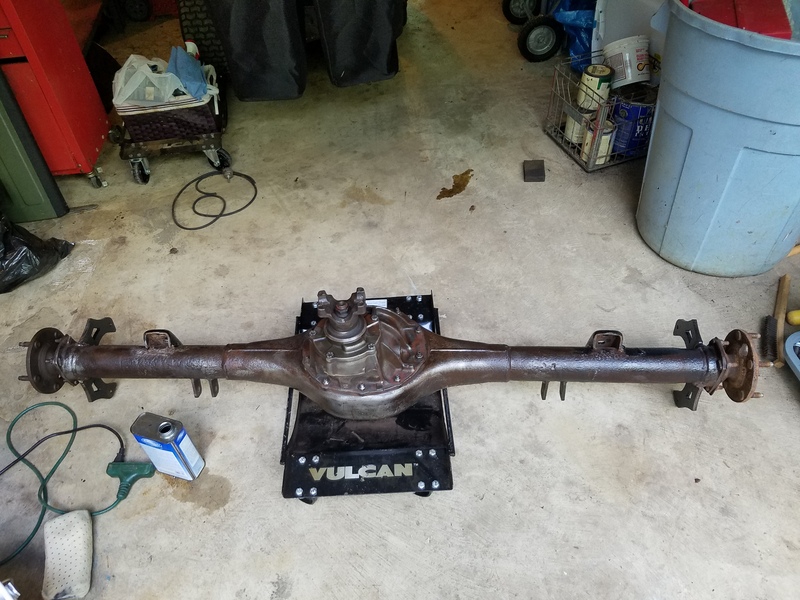 I also removed my driveshaft since it was immediately available to wire wheel and repaint. 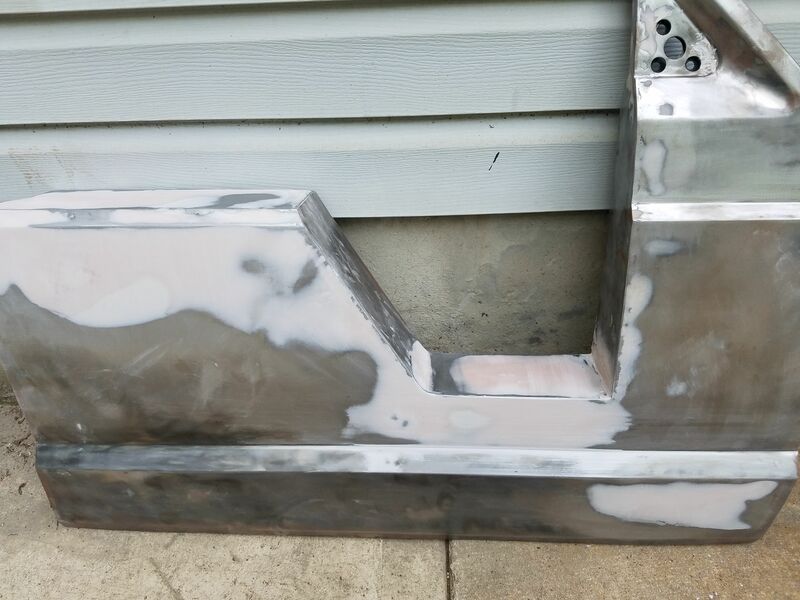 A different angle of the rail paint. It isn't exactly pretty, but it will protect like no tomorrow. 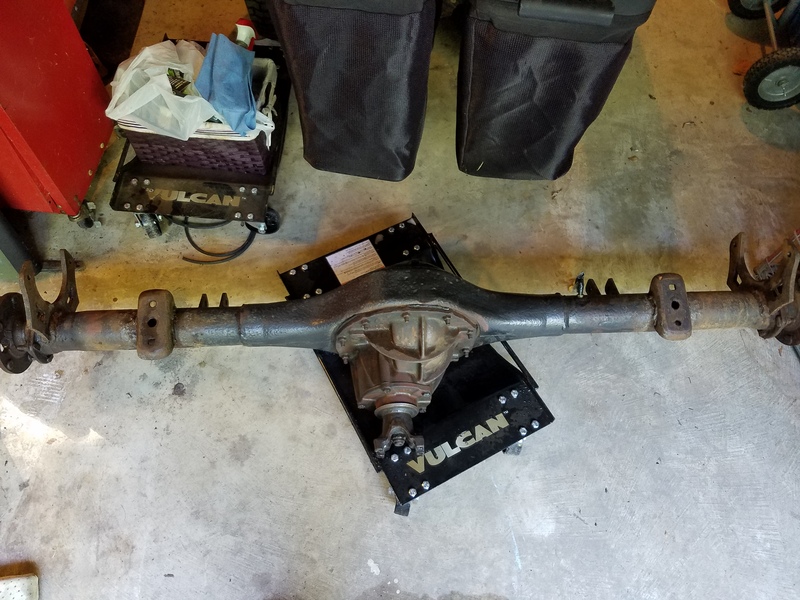 The axle with the brakes reattached. It to a while to get the rotors seated correctly. 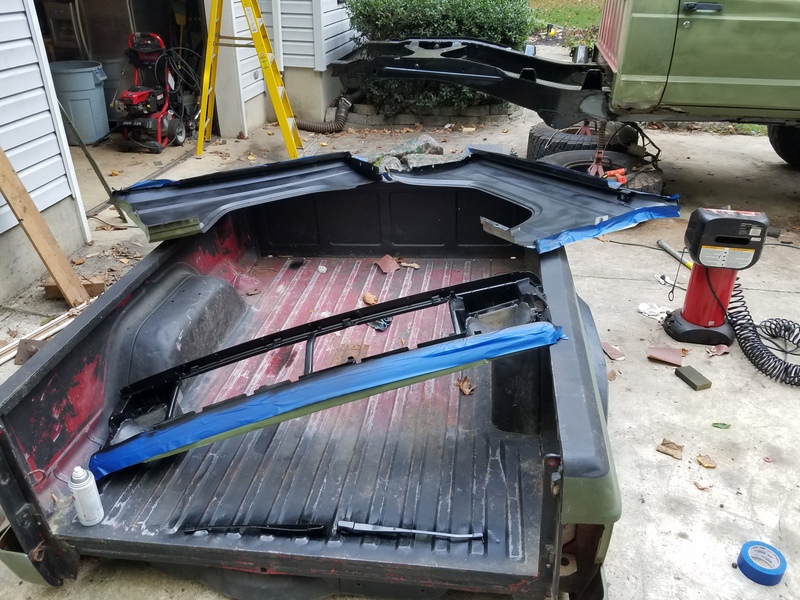 Started taking apart the front end to repaint. I don't want to do a superficial job on it so I'm removing panels and painting everything. 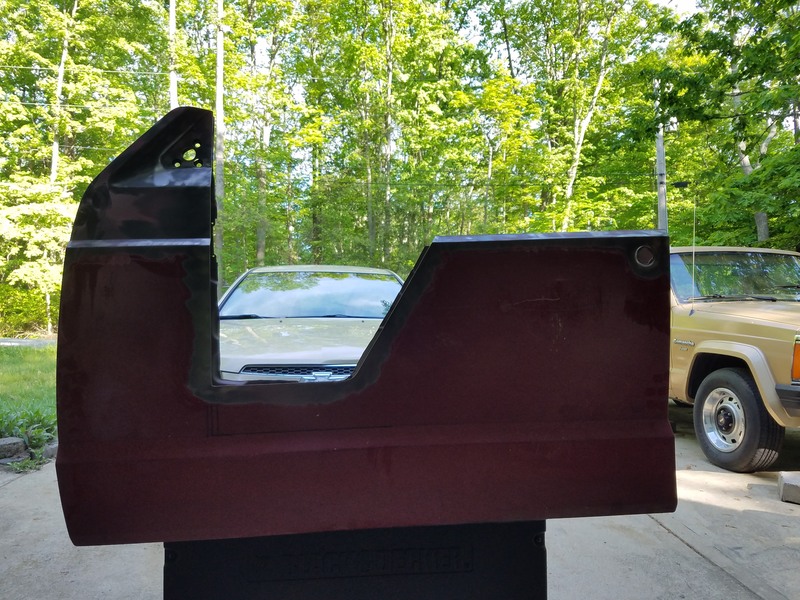 The entire body sanded and I painted the fender wells and hood support beam black. 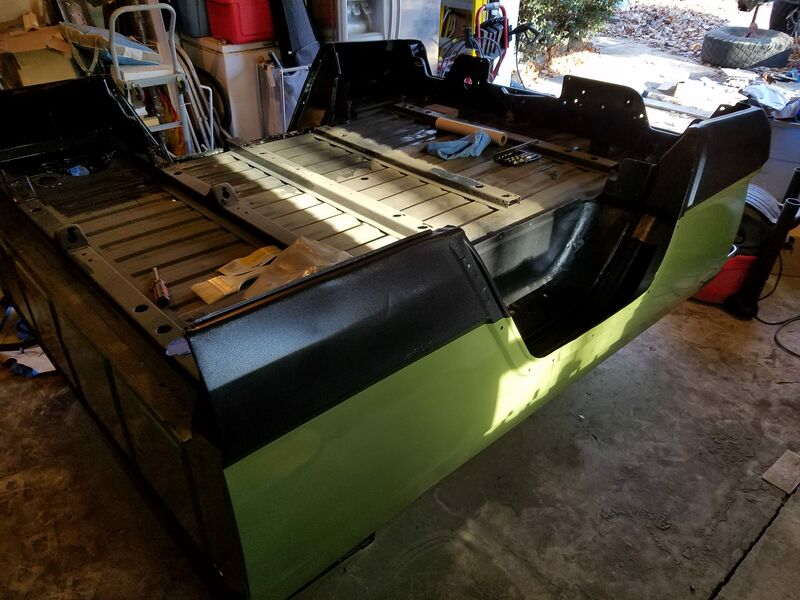 Now I'm just waiting for good sunny days to actually paint it and put it back together! More work than most would consider it's worth, haha. But I've come to peace with the fact that it won't ever be worth what I invest. In the time I was gone, I ground everything down smooth. 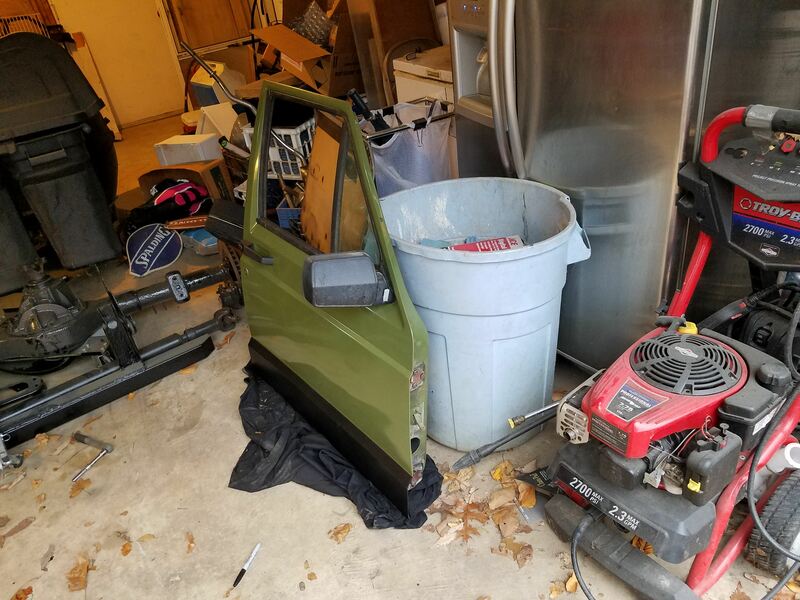 I originally taped off the doors and windows and all that, but the more I looked into it, the worse I felt about slacking off with the work. So I ended up stripping EVERYTHING. 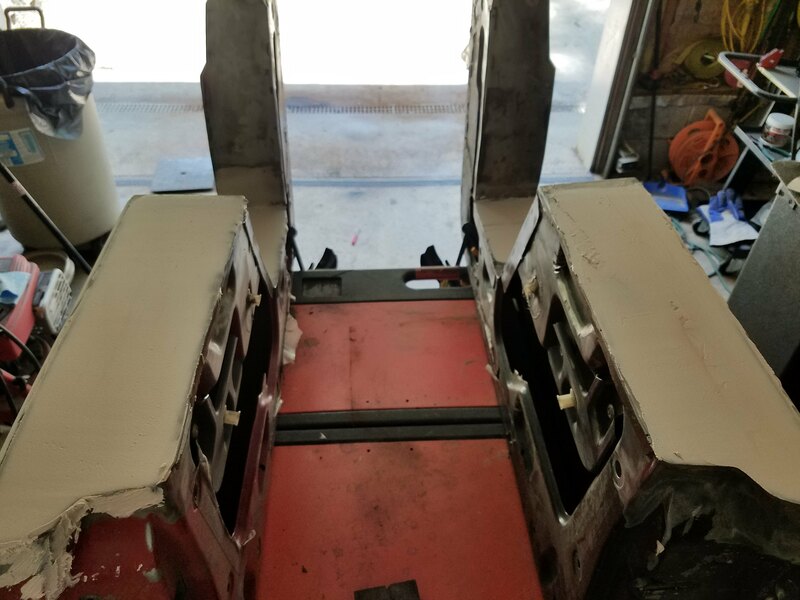 I took the doors completely apart, all the window trim, the quarter window, the handles, and even removed the doors from the chassis. 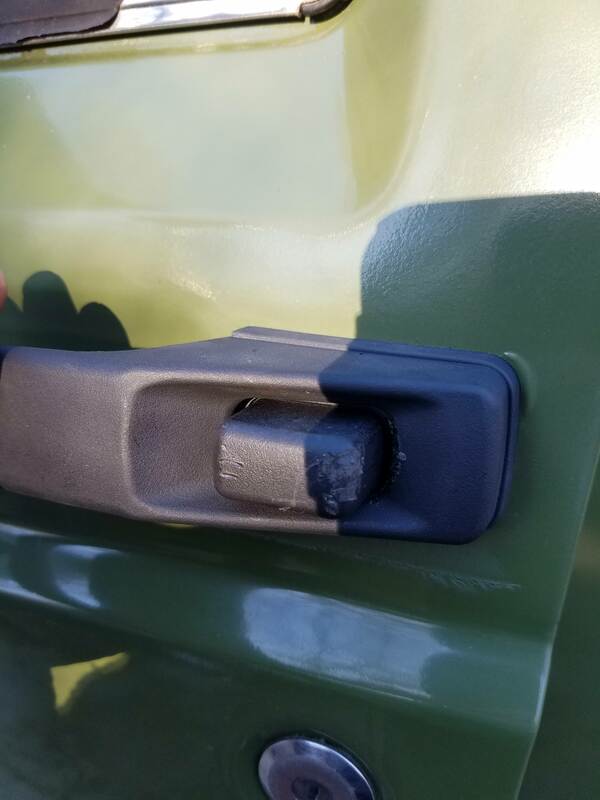 While I had them off, I did the removeable doors mod, so I can freely take them on and off(which will be great when I finish my trail doors). 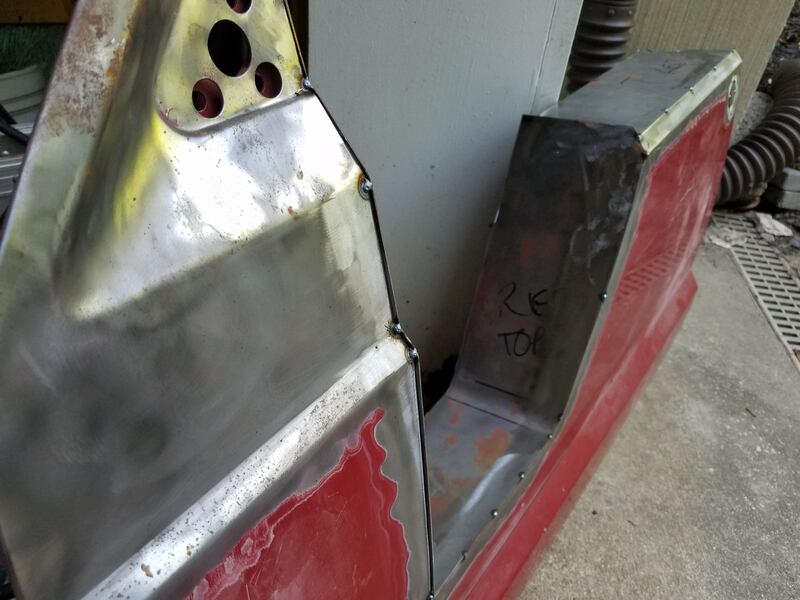 I eventually removed the hood to have better access to the cowl panel and remove the seal on there for paint. After everything was removed, I began the sanding and priming(and then sanding and priming, and then etc.). 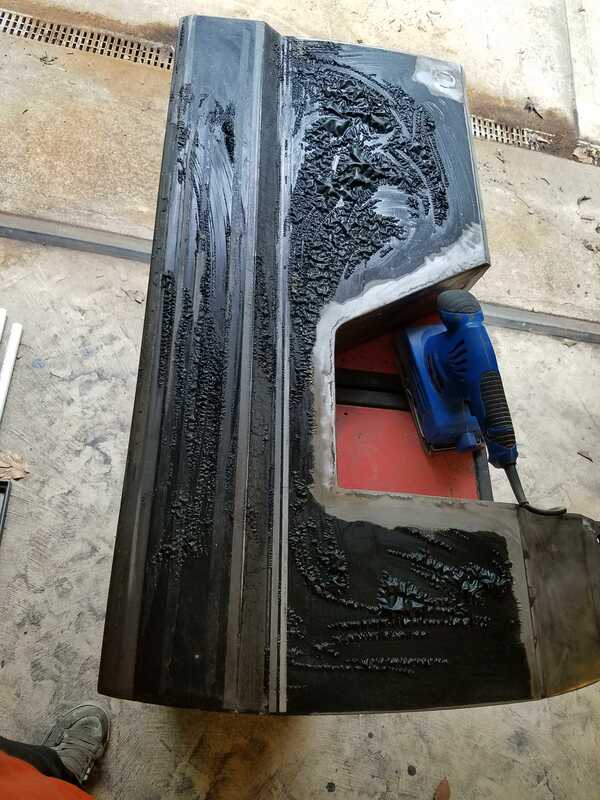 It turned into a huge process getting a smooth finish after a few attempts. Then, the weather got cold.... Which really restricted my days to paint. I finally got a chance with some warm days and I took it. I painted everything in one swipe with about 4 coats and let it dry a bit. 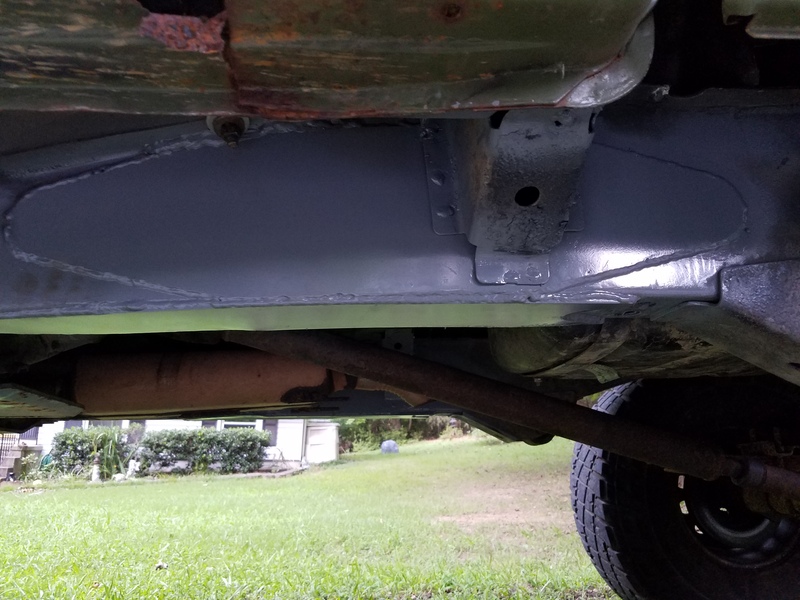 Sadly, overnight, there was a large fog that rolled through, introducing a bunch of condensation to my nice new, not fully cured paint. 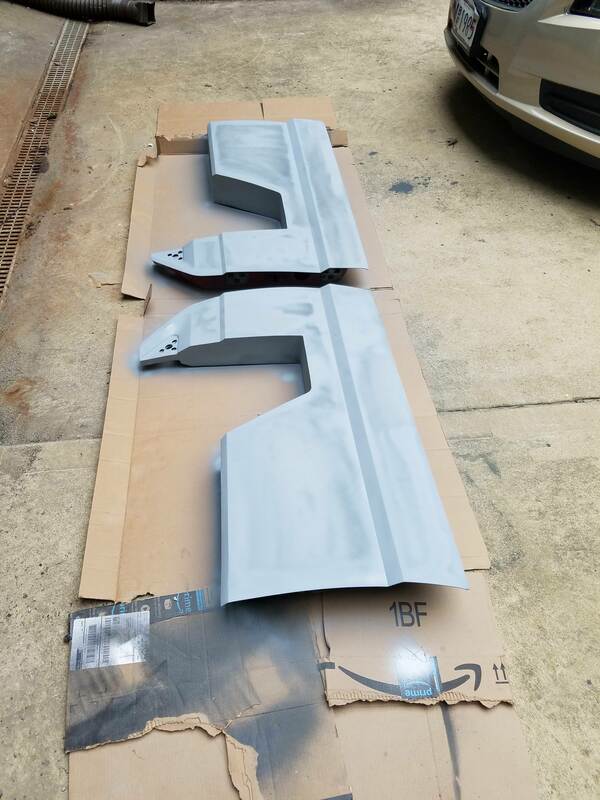 The long and the short of it is, it ruined the entire paint job, costing me a bunch of time and money in the process. The icing on the cake was that after that, it was nothing but cold days for 2 weeks. I worked sparingly, sanding when I could and just trying to prepare for the day when I could paint. And just last week, those days came. I did a repaint on it and, for the most part, it got a decent coat. The unfortunate thing was that the unseasonably warm weather brought about the bug apocalypse and I could not for the life of me get a coat without 2 dozen bugs finding their way into it and killing it. I think I managed to go through three separate painting cycles before I pulled off a relatively clean coat. The roof was always littered with bugs so rather than the regular green, I took a bit of a more aggressive approach to the painting, which you can see in the pics below. 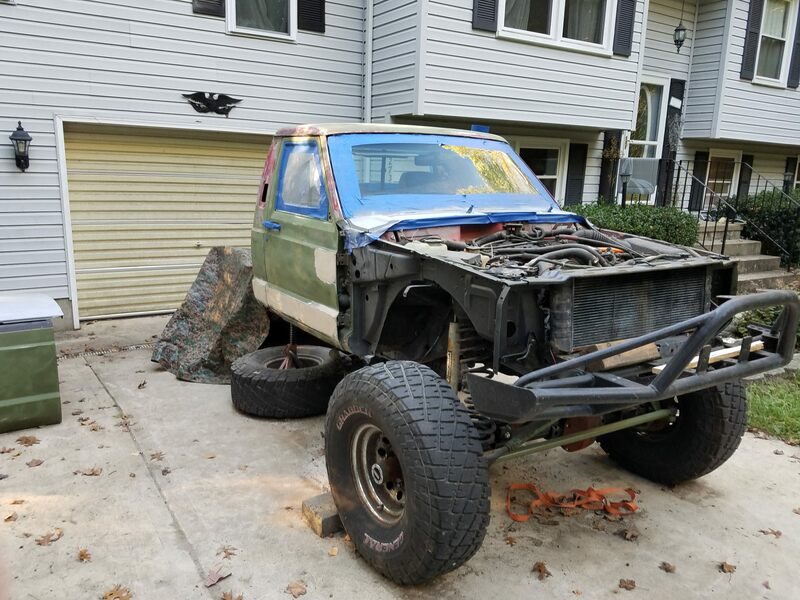 I still need to put the lot of it back together, but that's the easy part. 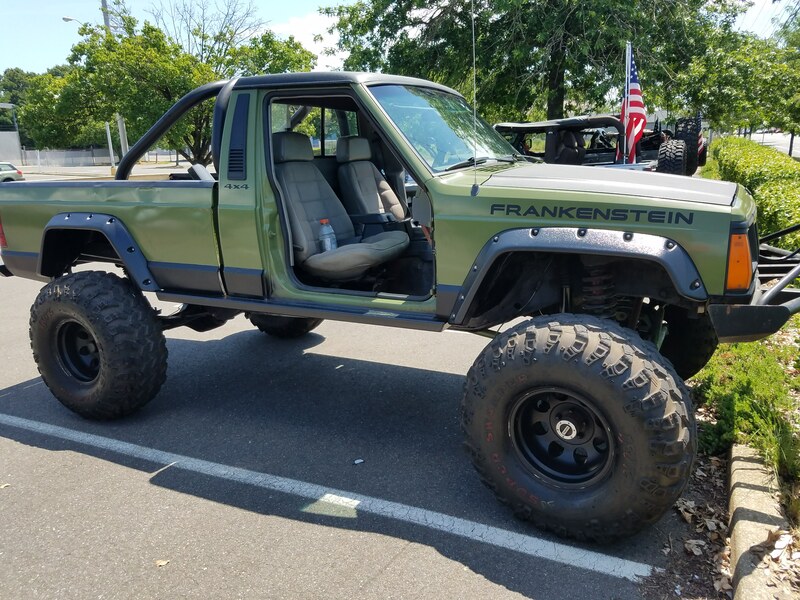 Here it is before I finally decided to remove everything on the doors for a cleaner coat. 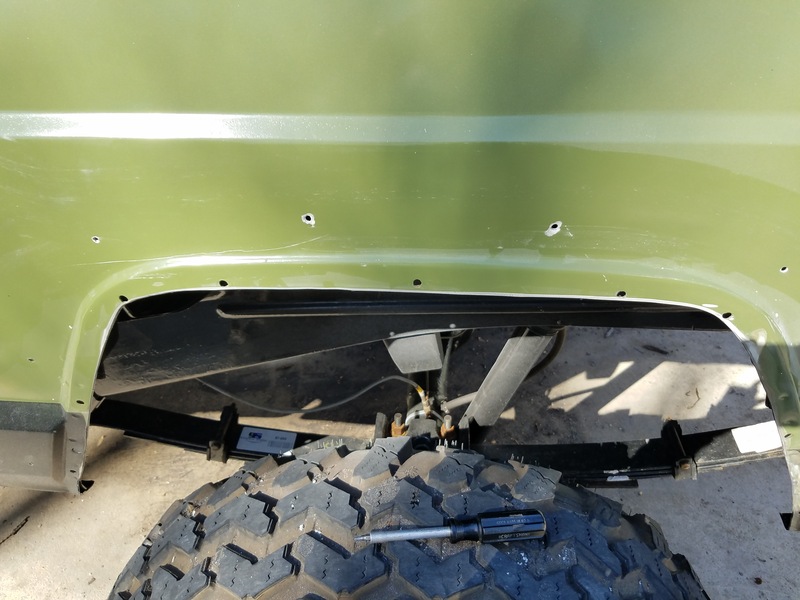 I was in the process of doing some light body work to repair some trail rash I had received before. 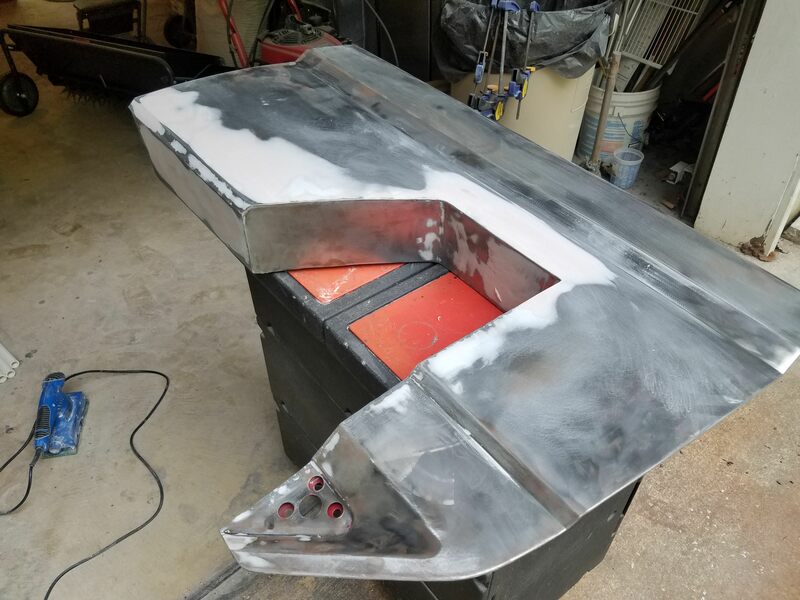 The fenders and hood all set out and sanded smooth. (Due to the frustration of the multiple coats I had to do, I don't have any in between shots of the failed paint jobs and the resanding on those). Also visible is my rotting bedsides. 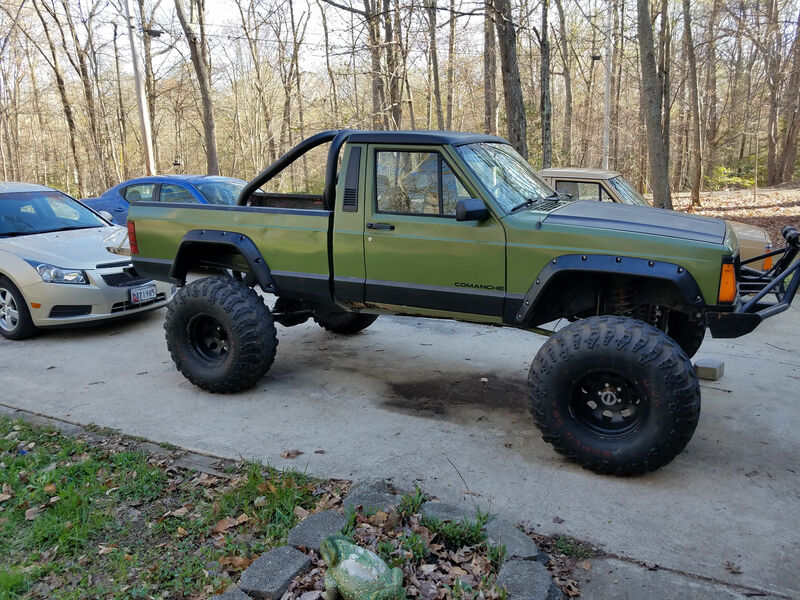 Here's where it jumps straight to the successful paint jobs. 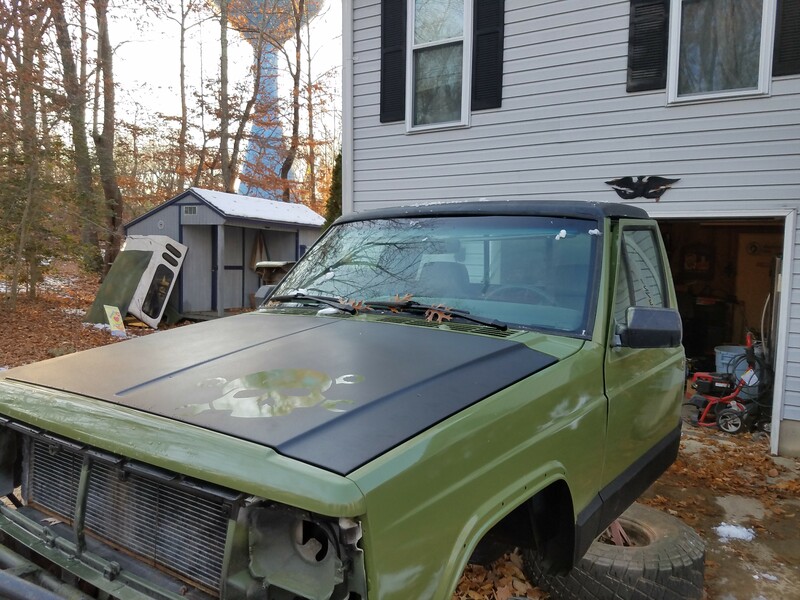 I went with a bedliner black coat for the lower quarter and the roof. The doors are all reassembled too now. 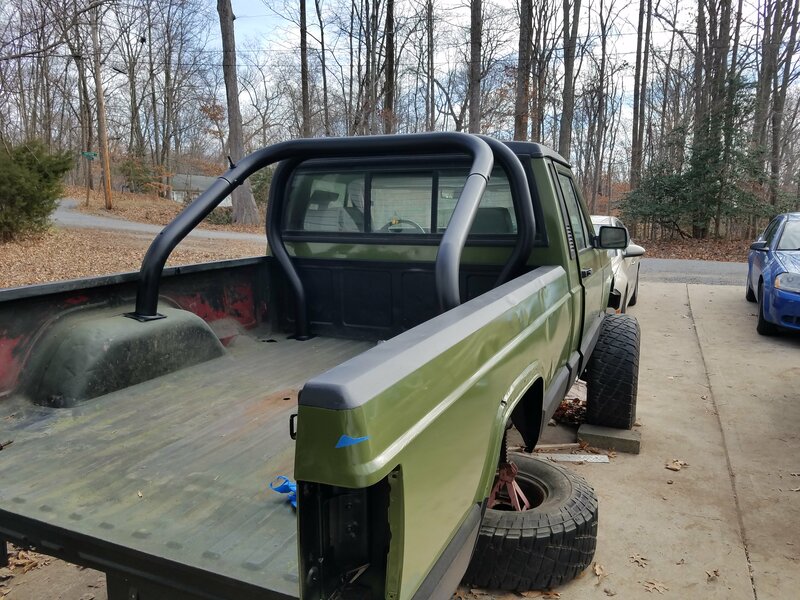 Now, all I need to do is get my leaf springs and toss everything back together(and paint the bed a bit more, but that's not crucial since it's on its last legs). I'll be steadily reassembling this week so I'll add more update pics when I complete more. 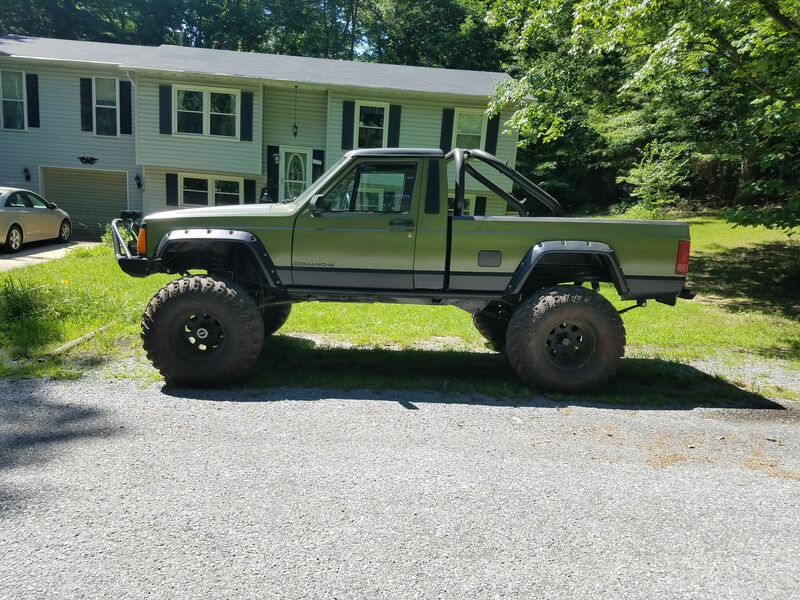 In addition, I found some pics of the truck when I first got it back from the rail repair so I'm tossing them up too as a bonus. 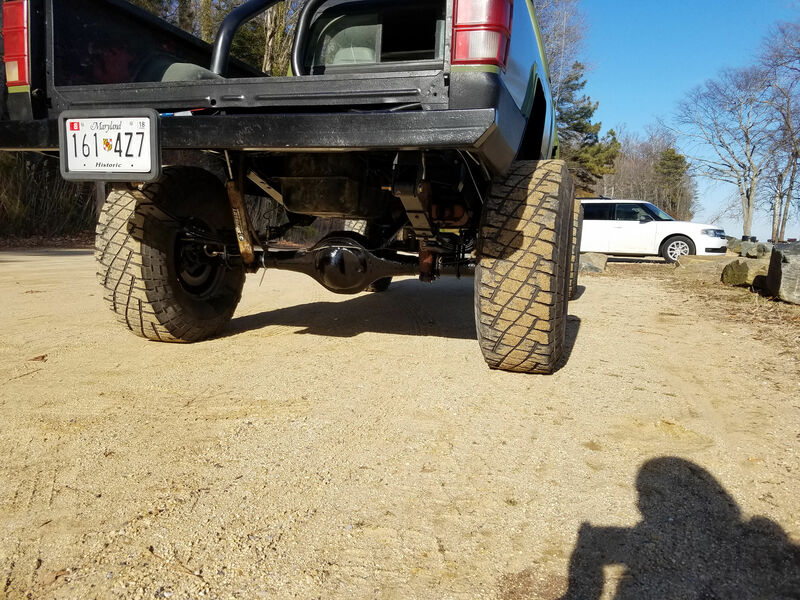 I also realized I never posted a pic of the front axle under the truck, so I'm throwing it on here too. It was getting dark so it's hard to see too much. 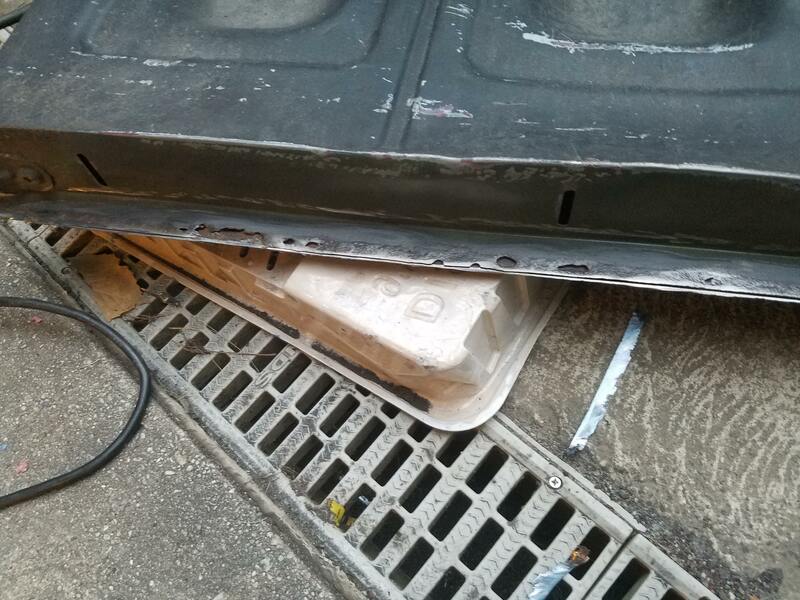 Some of the tailgate damage. 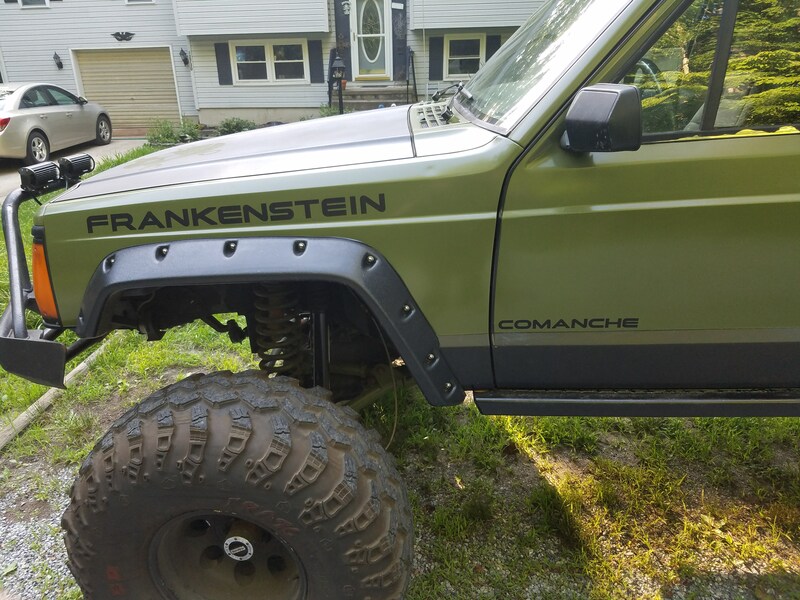 The knuckles and all mounted up. And that's all the old poser shots I have until she's ready to go again. Been working on it some more over the course of the week or so. 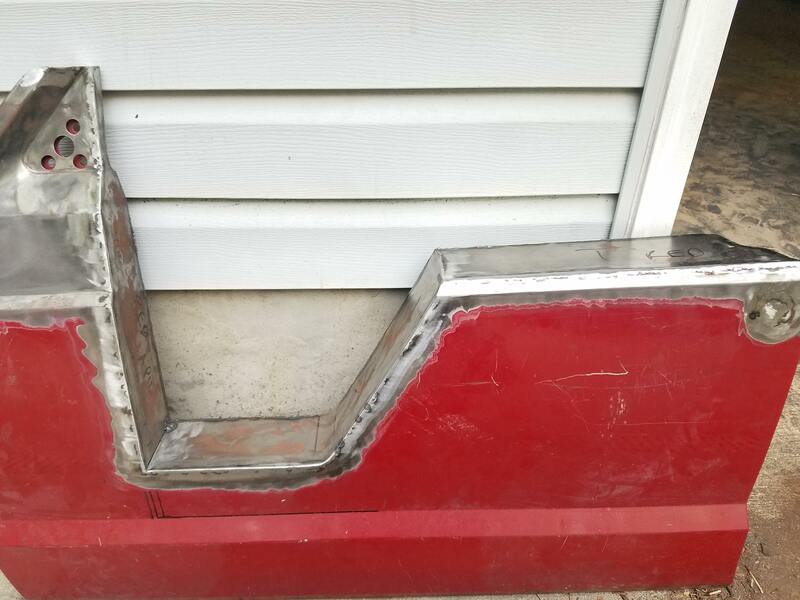 I began working on the bed, which started with me cutting a chunk out of the wheel wells where it was rusted through. I'm probably not going to patch it up, and if I do, it'll be a screwed in temp piece. The bed itself isn't far from death, so this is just to hold it out a bit longer while I work out the logistics for a tube bed. 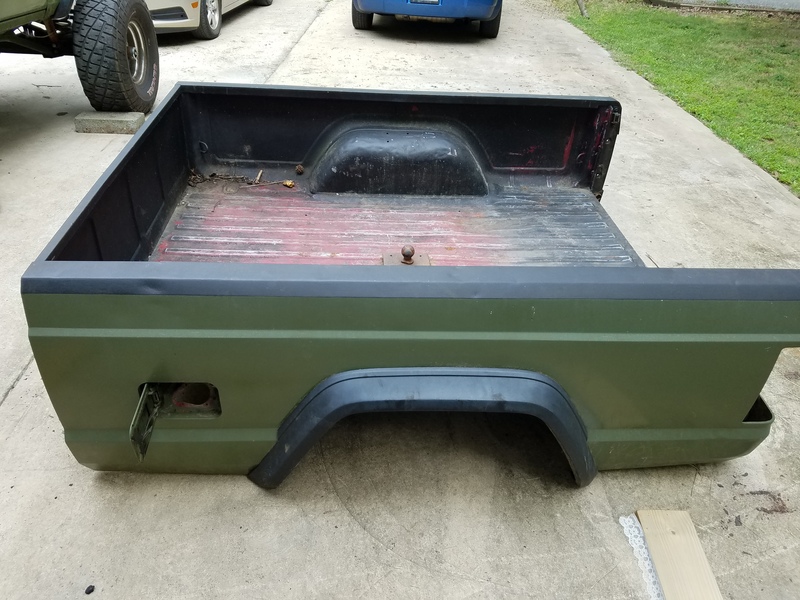 The gas tank strap holder on the bed is too badly rusted for me to continue to use it, so I'm just going to bolt the tank down in the bed. Been planning on going fuel cell anyway. I'll need to grab some longer lines and some waterproofing, but overall, should be pretty easy. . 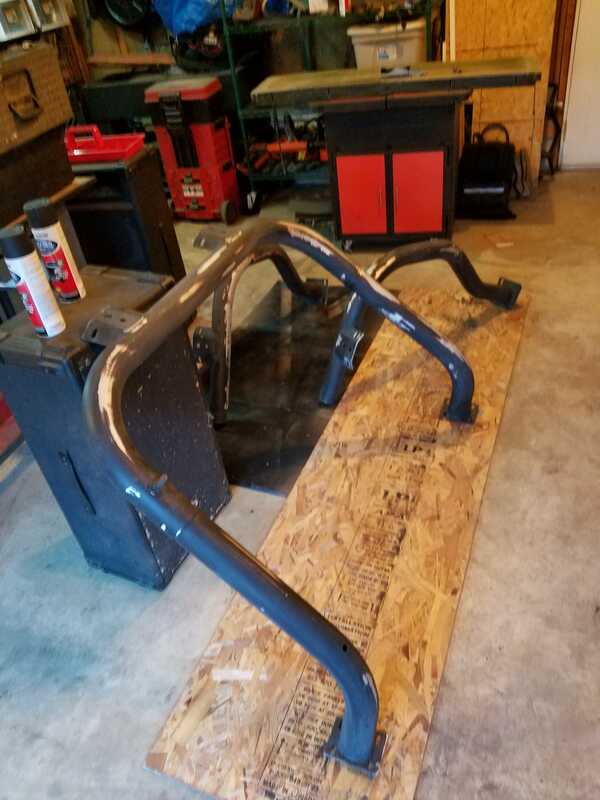 The frame rails are finally done. 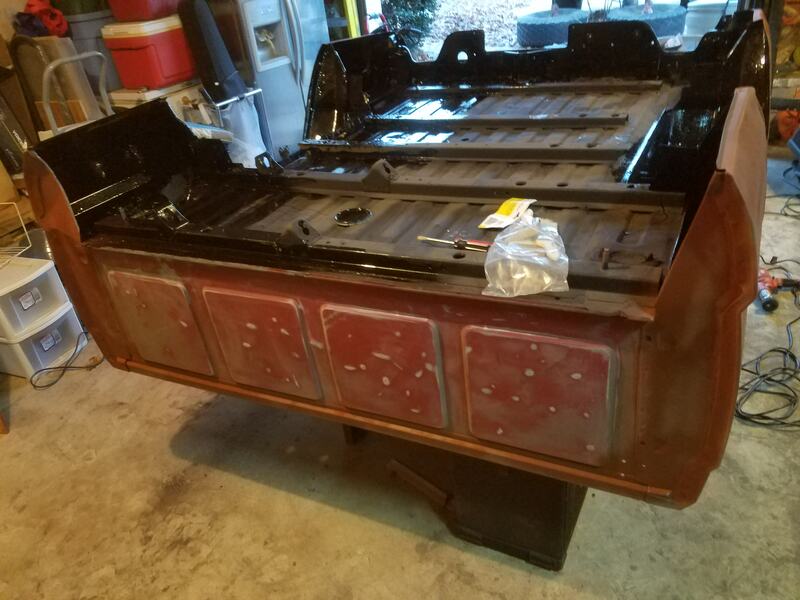 I finished up the interior of the rails with some Eastwood interior frame coating, giving it a solid 3 or 4 coats across the entire frame. 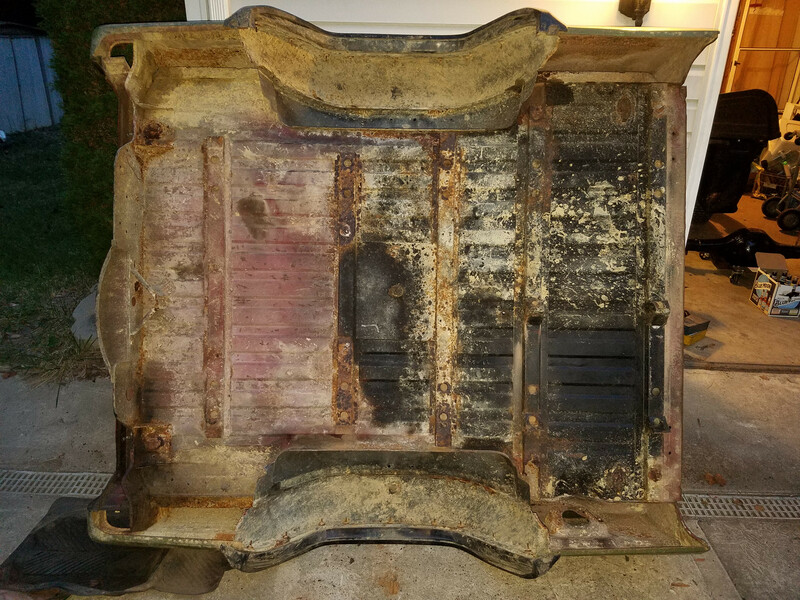 Hopefully, that will address the rust issues on it, or at least keep it at bay for a while until it can be pulled in for a true resto. 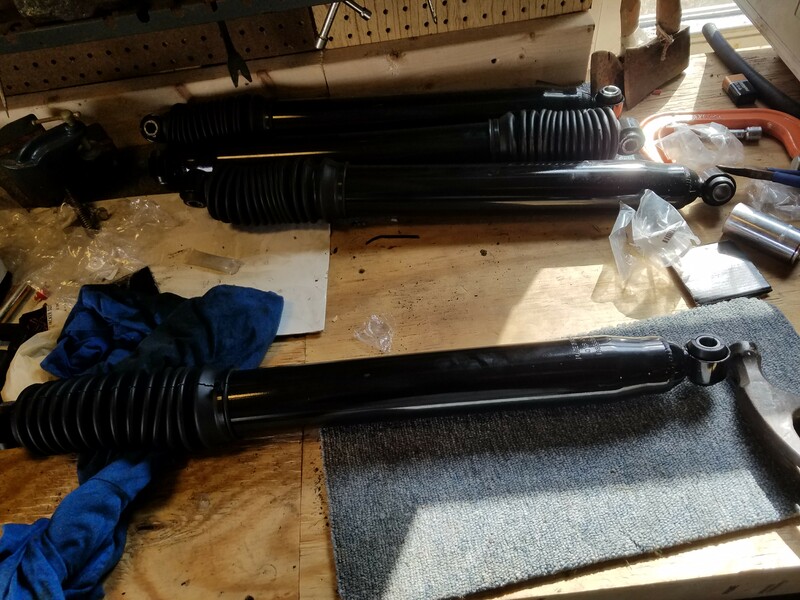 Some of my parts started to arrive with the exception of my leaf springs, which should be here tomorrow. 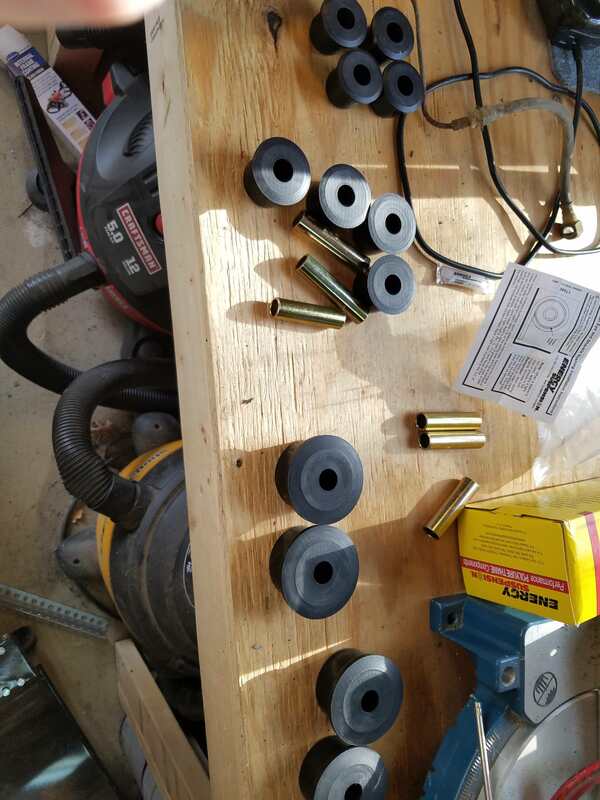 The bushing kit I purchased had 1 1/2" bushings for the upper shackles, but my shackles are aftermarket units with a 1 1/4" opening, so I'll need to buy more of those. 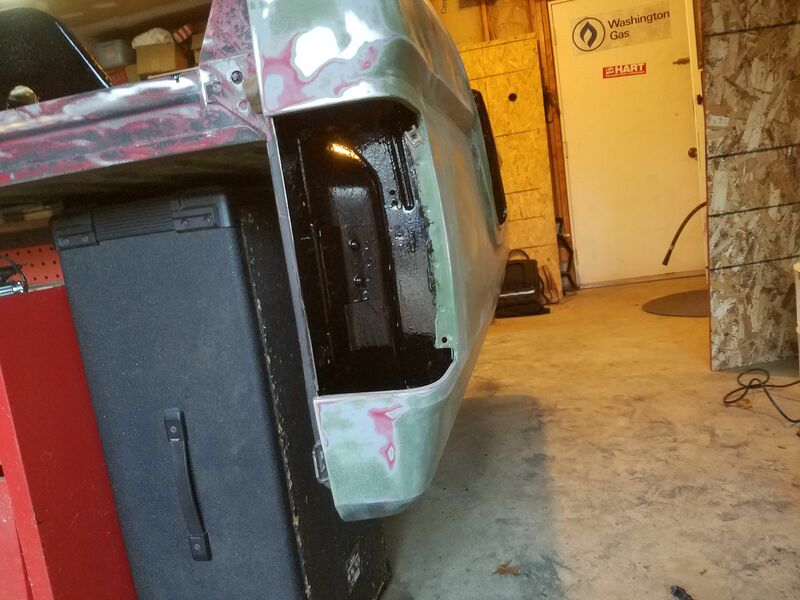 I finished painting the fog light sockets and got the front end all squared away as well. 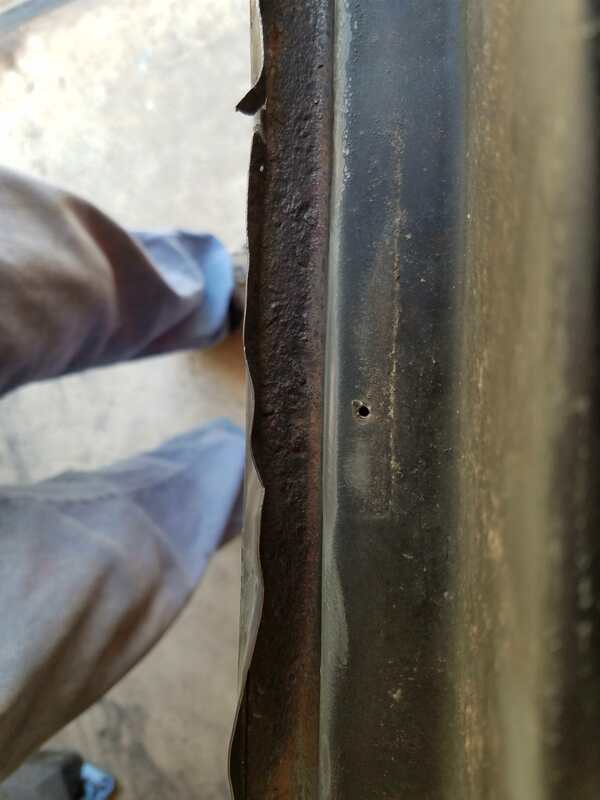 The hole I cut in the wheel wells. It at least allows me better access to the underside there. The bed so far. Not a perfect job, as I said, it's not meant to be. Didn't do the bottom yet because its a bit hard to get the grinder into right now. The frame coating with the wand it came with. Had to hackup a clothes hanger and tape it to it to give it some rigidity. This was about the best and only pic I could get of the coating after it's in. Great coverage on it. 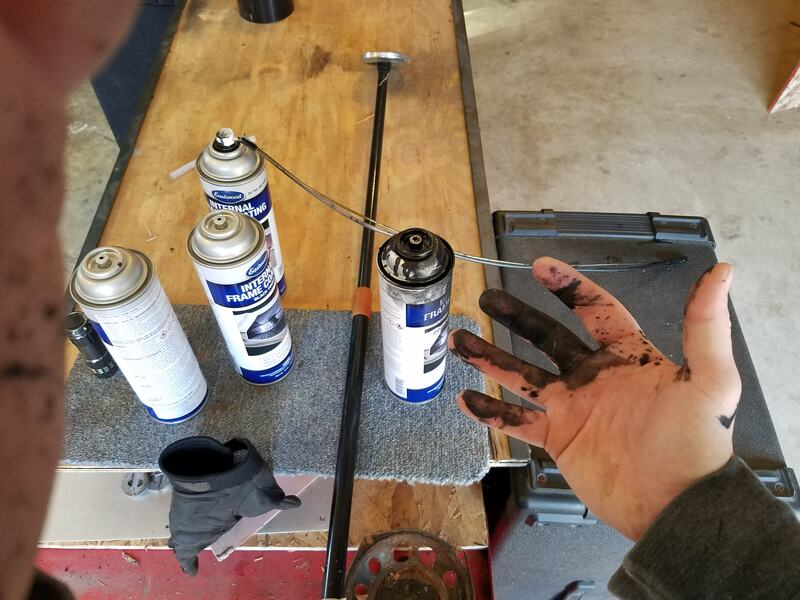 Had one can pop the spray valve off on me. Got all over my face and jacket too. Oh well. A pic of here mostly patched up. Something else I noticed while grinding. This is my interior floor boards. 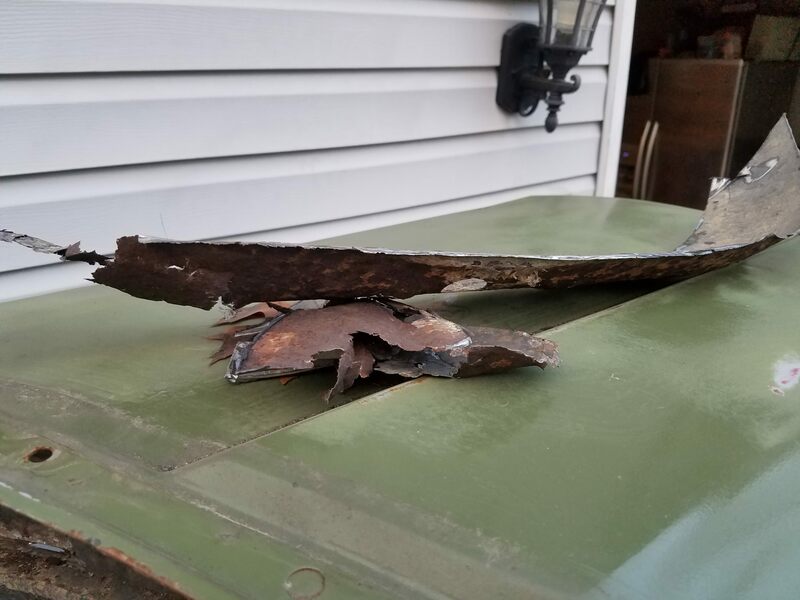 Still pretty solid but the edges are rusted through. Not a critical repair though. 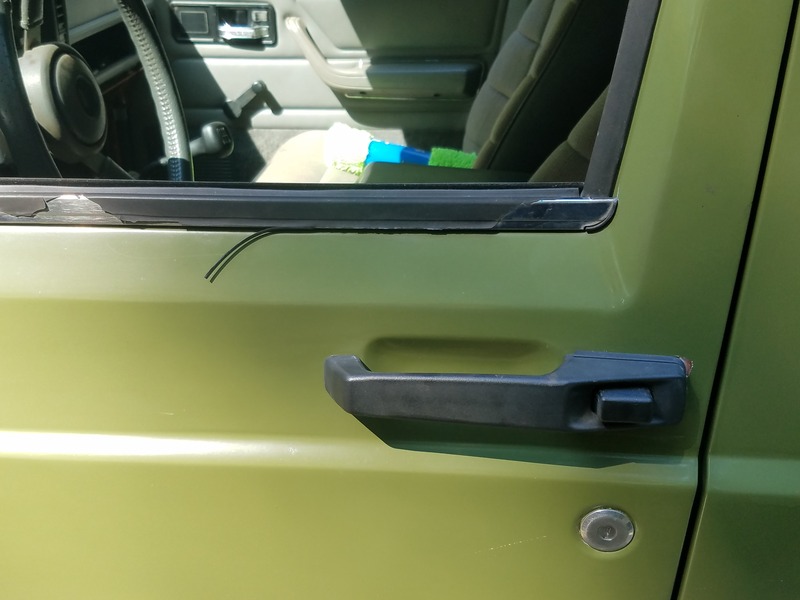 I also added some of the black plastic edge guard to my doors so when I remove them, I don't bang up the paint. 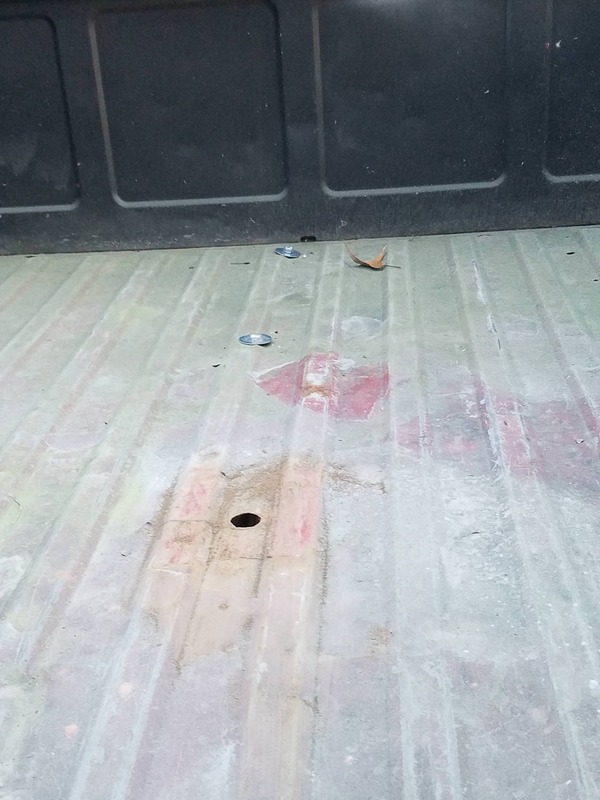 I had some extra, so I also added a few beads around the truck to sharp cut edges. Unfortunately, I don't have any pictures of that though. How did you paint it? 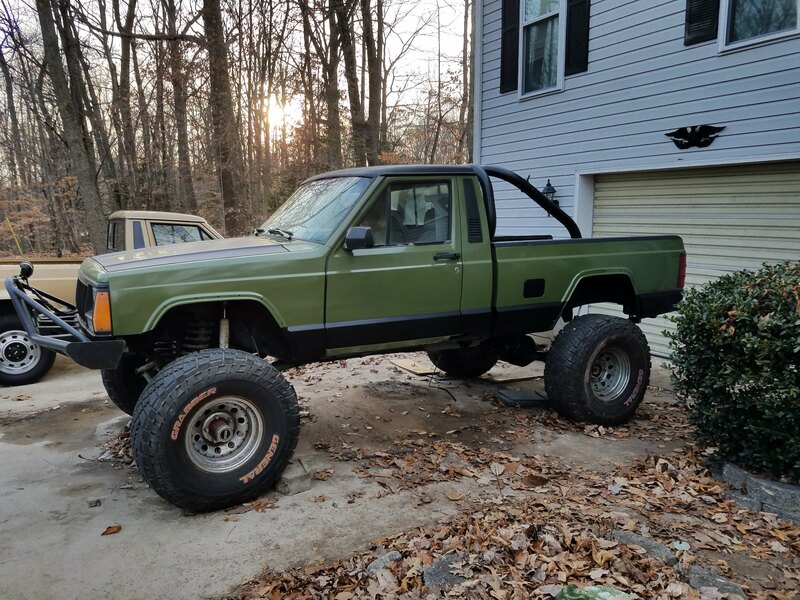 With rattle cans? Because if so it looks amazing. Also for the por15 how do you apply it? Just brush or roll it on? 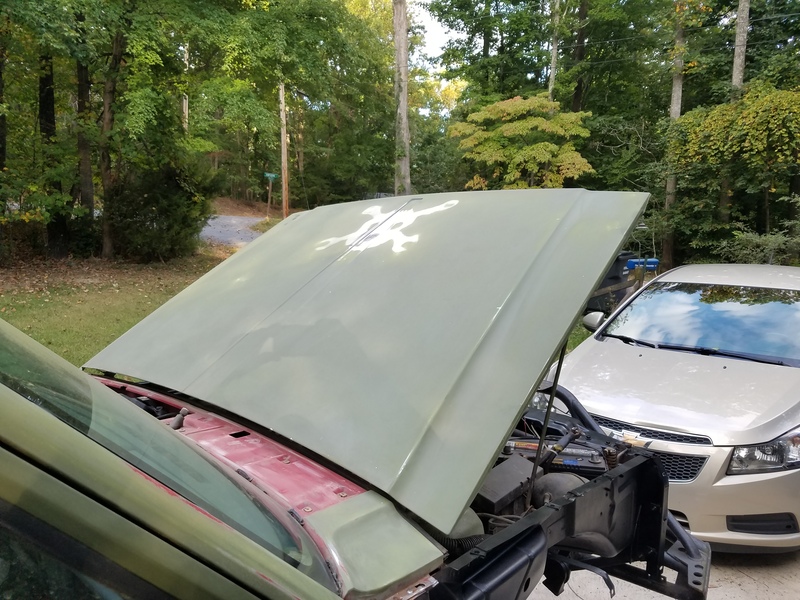 It's painted with basic rattle cans, but it's far from a perfect coat. Because I was outside, I had some considerable trouble getting good coats. It has imperfections(sags, wrinkles, and the occasional bug landing) all over that I'll have to sort out in the spring, but in the overall, it did turn out quite nice. 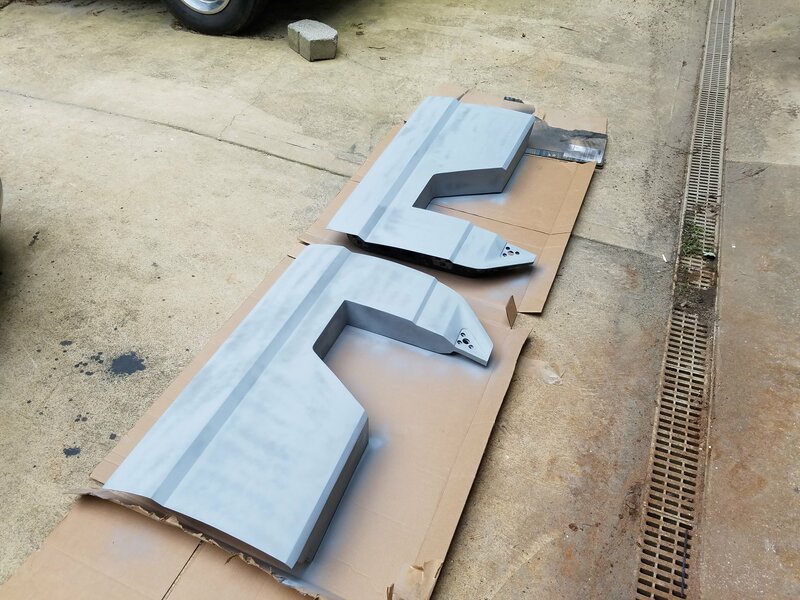 For the POR, I ground the frame down to metal and just used a standard paint brush to get the coats. 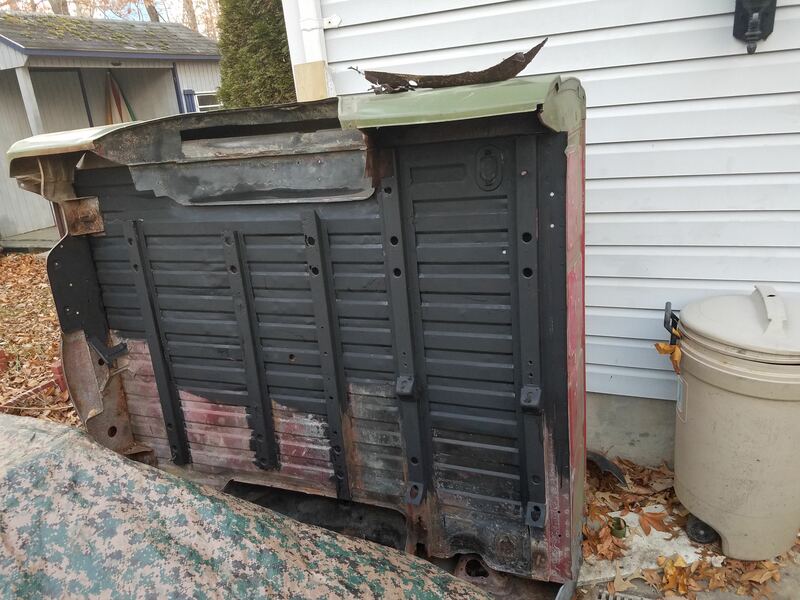 Up close, it isn't that pretty, but I'll be damned if that thing ever rusts again. I wanted to paint my mj with rattle cans but I wasn't sure on the turnout. 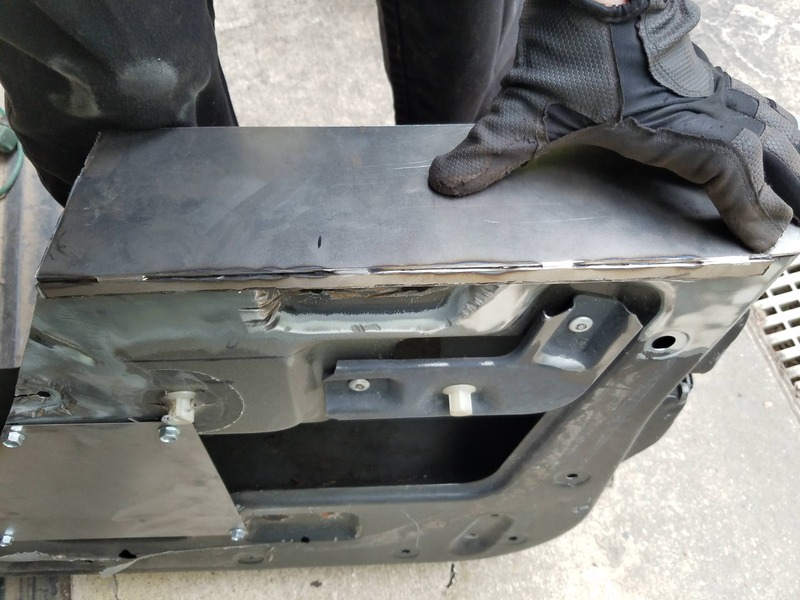 Did yu piant the inside of the frame rails too Because how would you do that? Yeah, I did. I purchased a special product from Eastwood. I think there's a pic of it in one of the updates up there. 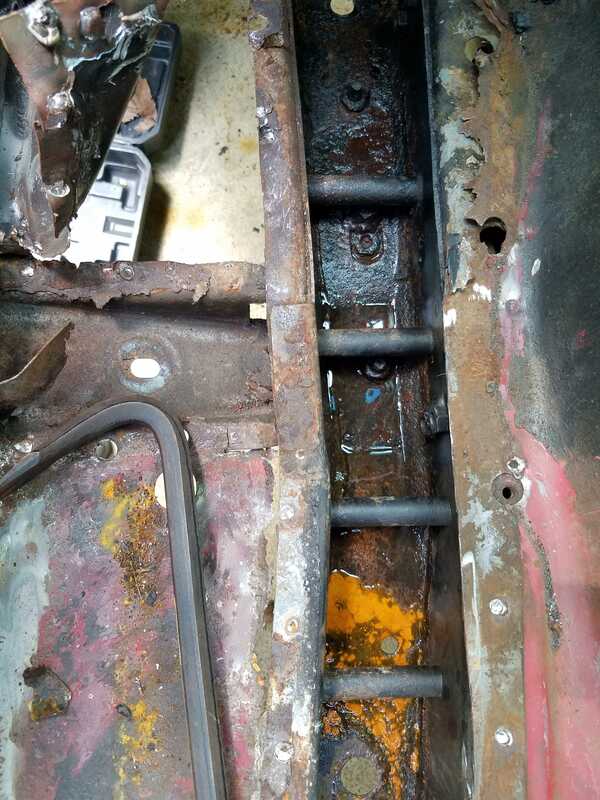 Basically is a heavy duty rust reformer that seeps in to every nook and cranny. 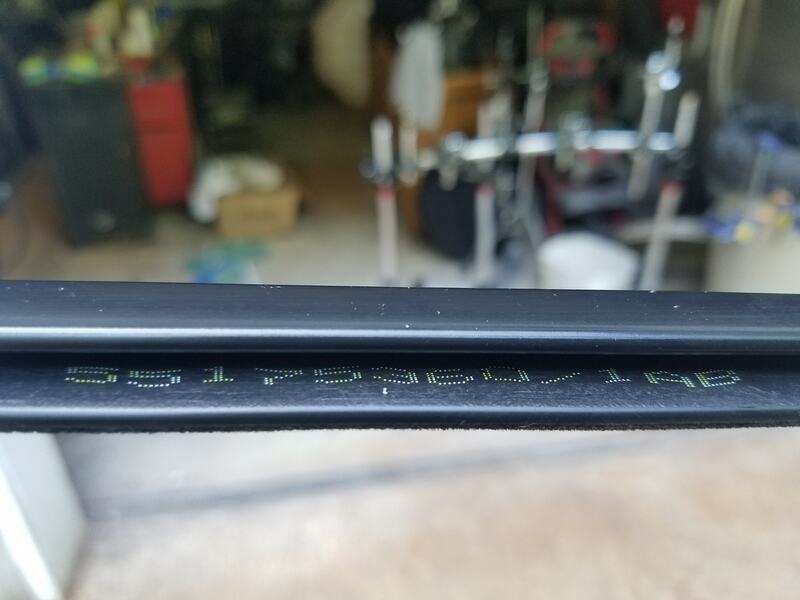 It comes with a length of hose with a special nozzle on the end that you can insert into the rail and slowly pull it out, painting the inside as you go. I had to jerry rig it with a bit of hanger so I could get a more rigid structure, but it worked well. 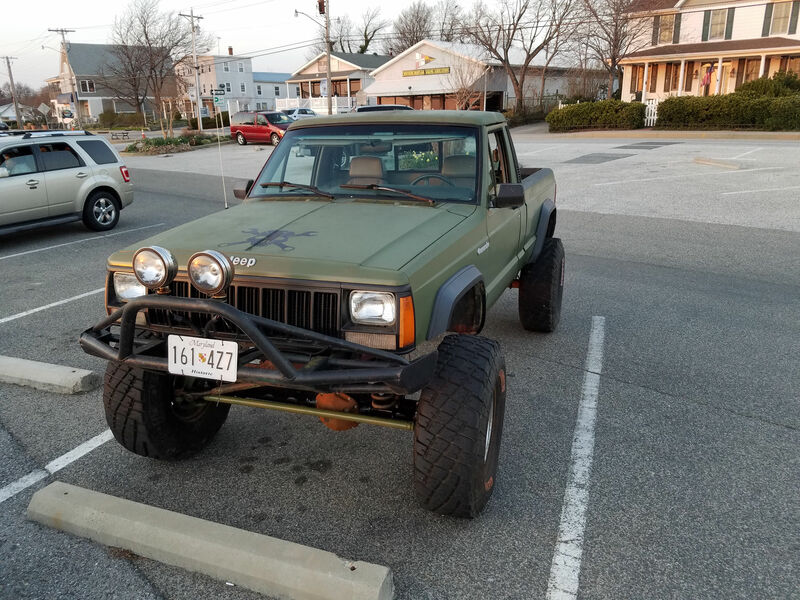 As for rattle can jobs, they can be fantastic looking if you do it right. It's all in the amount of time you dedicate to it. Prep work is key. I had a lot of hours in sanding and priming till I got a silky smooth surface. And I'm probably going to pull more hours into it in spring to clear coat it. As promised, here is the big update for the MJOTM. It's a little late, but better at least I made it in time for January. I got some help to get the bed on after I finished the repair/repaint on it. 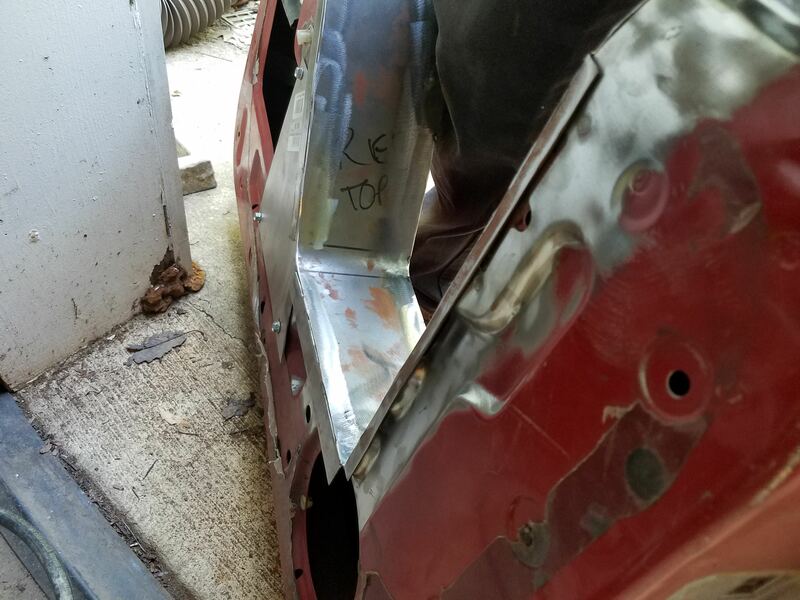 I ended up cutting a 2' by 1/2' holes in each wheel well to get the rust out and allow access to the inside. 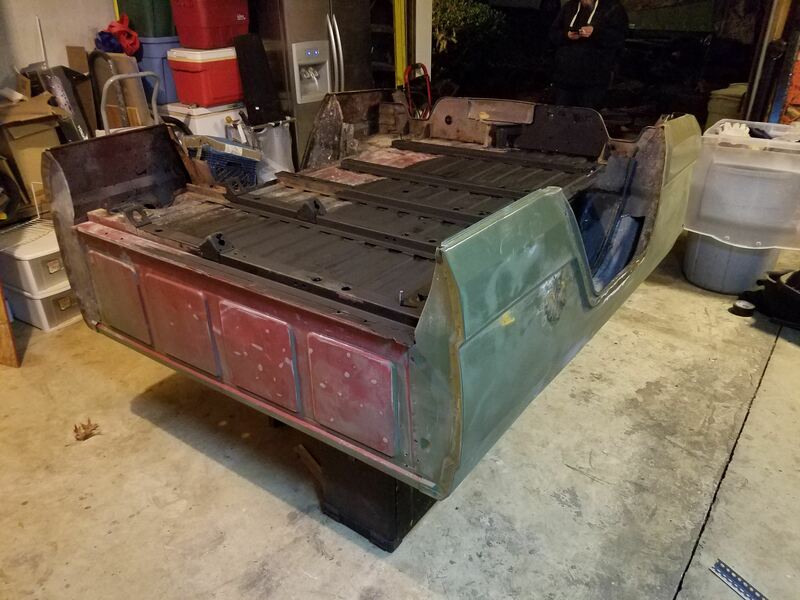 I painted everything up and used some reformer on the bed inside, to stop the rust if I could, but it isn't terribly important. The bed didn't have a whole lot of life left, and I didn't invest an extremely large amount of time and effort into perfection. 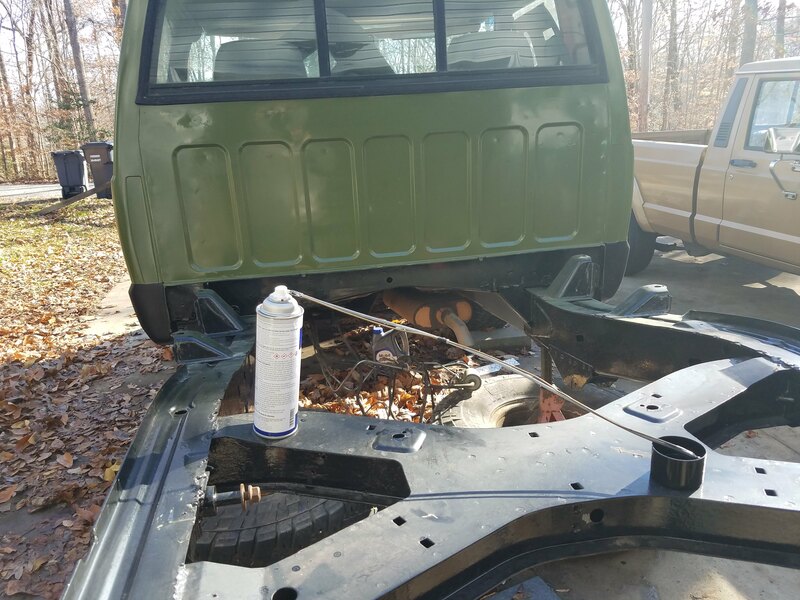 Putting the gas tank back on without help was kind of a nightmare, and I had to rig up a pretty shoddy system to get it in there. 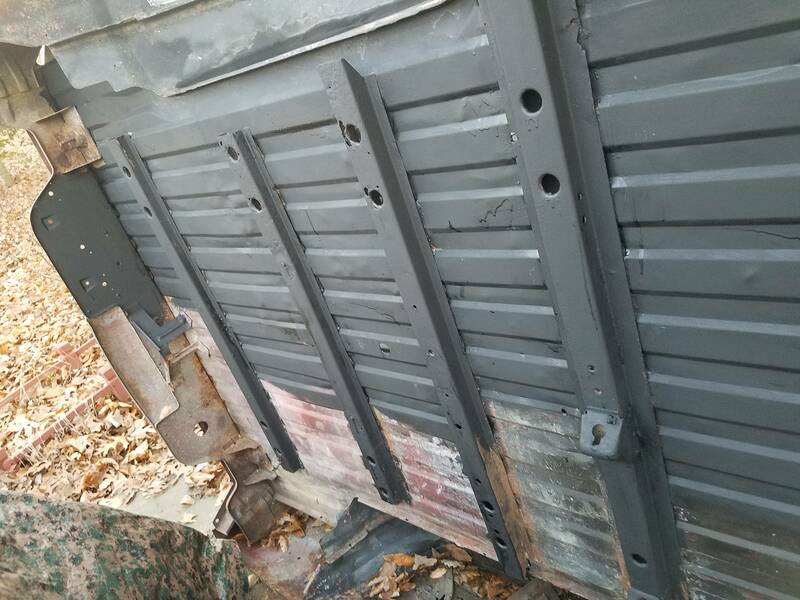 I ended up just drilling holes through the base of the bed itself for bolts to go through and used some wide thicker washers to distribute the weight of the tank since the jbolt holders on the bed were rusted out. This is only really a temporary solution until I upgrade to a fuel cell. 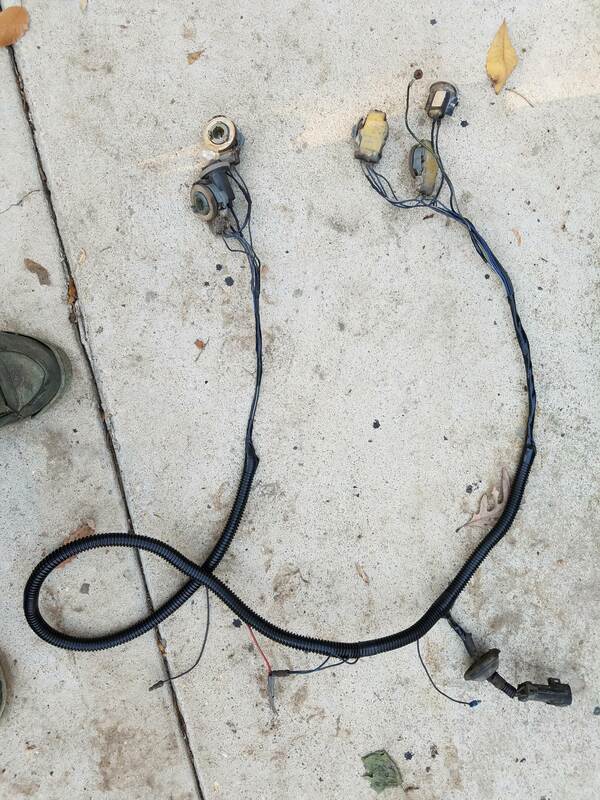 I kind of rebuilt the fuel pump assembly. 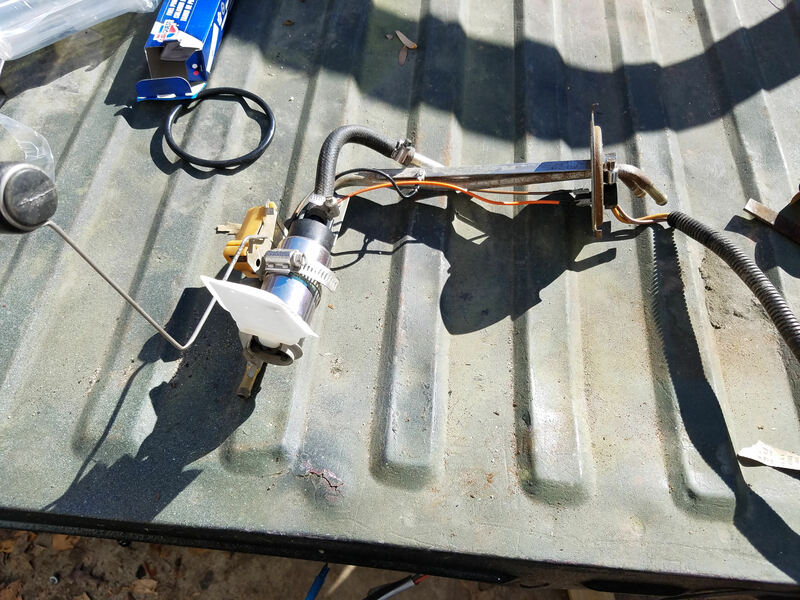 I replaced the pump itself and the strainer, refitted my wires, sanded the corrosion and rust off, but I didn't have any fuel proof paint, so I couldn't coat it back up again. 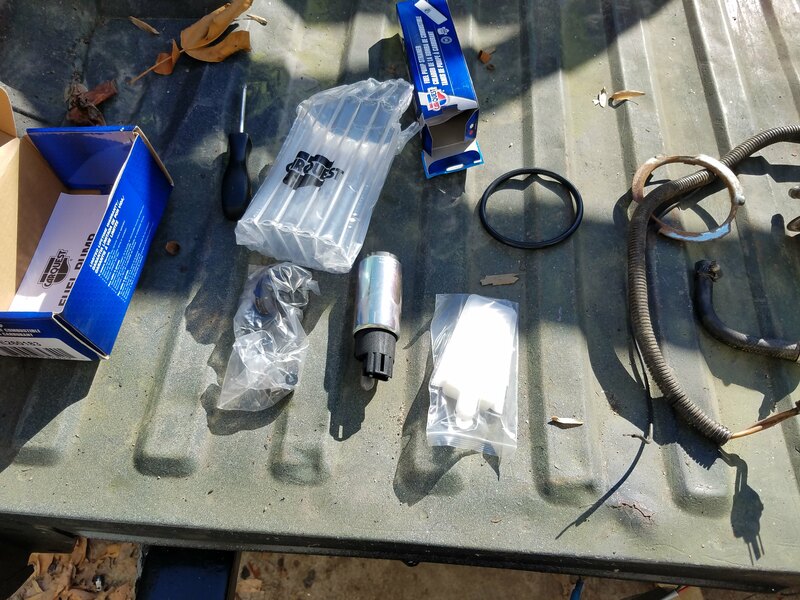 I also replaced the fuel filter, hose clamps, and some of the hoses that were looking bad. 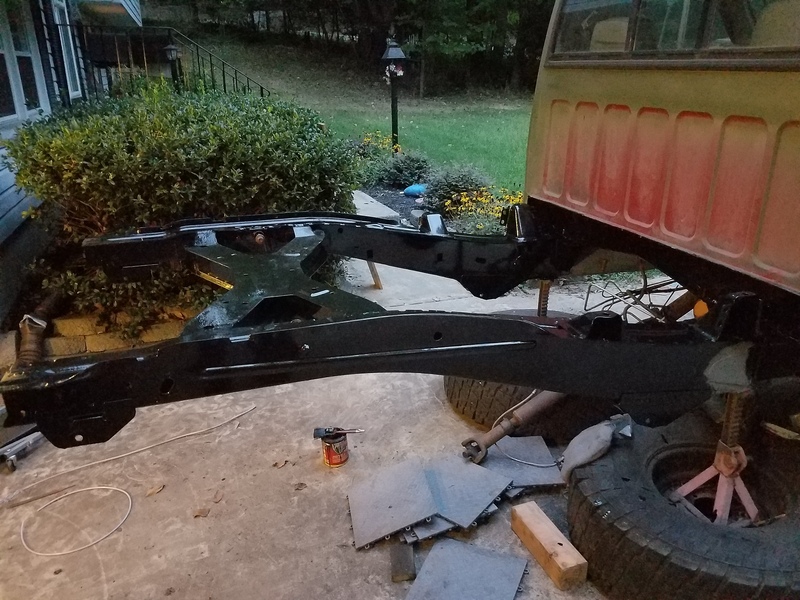 So I left off with my frame being done and waiting for the leaf springs. It took quite a while for me to get them and any time I called they told me they weren't sure when it would be in. I received them about midway through January, but even then, UPS decided, for reasons unknown, to separate them. They delivered one of them and marked the entire package as completed, and I had to do the phone thing for a while. In any case, it took another week to get the other leaf. After I got it, I bolted it up. 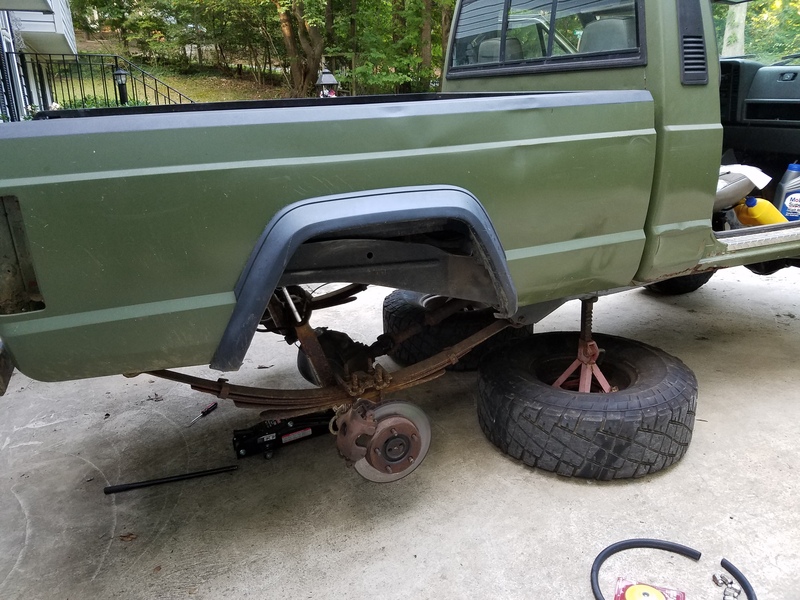 I purchased some u bolts from summit and had to get new drop shackles for it, despite that I already had a set. 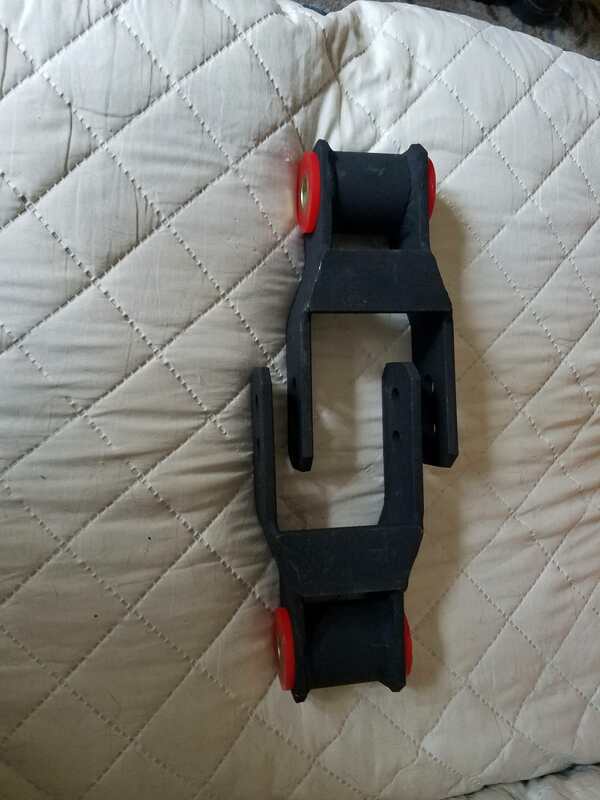 I couldn't find any new bushings for them(No company that sold them sold the bushings separate). 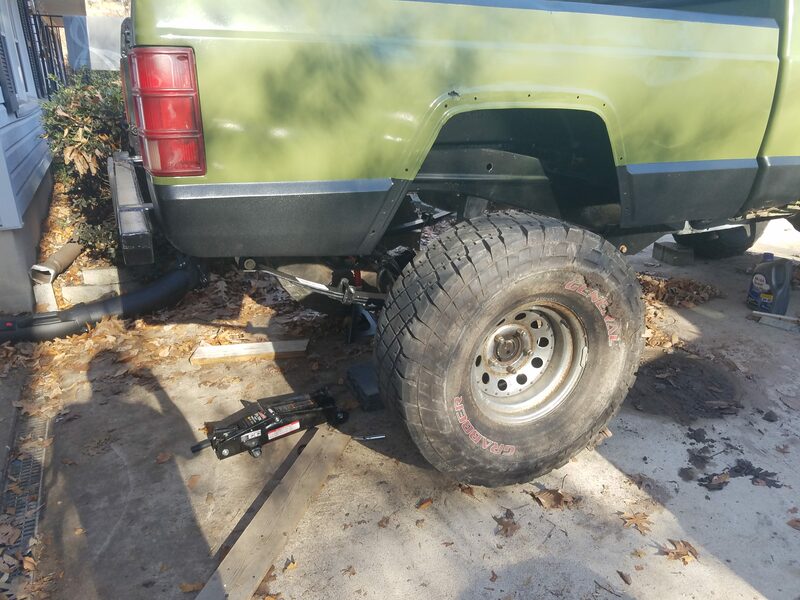 I bolted everything up and eventually put the tires on and dropped it off the jack stands. 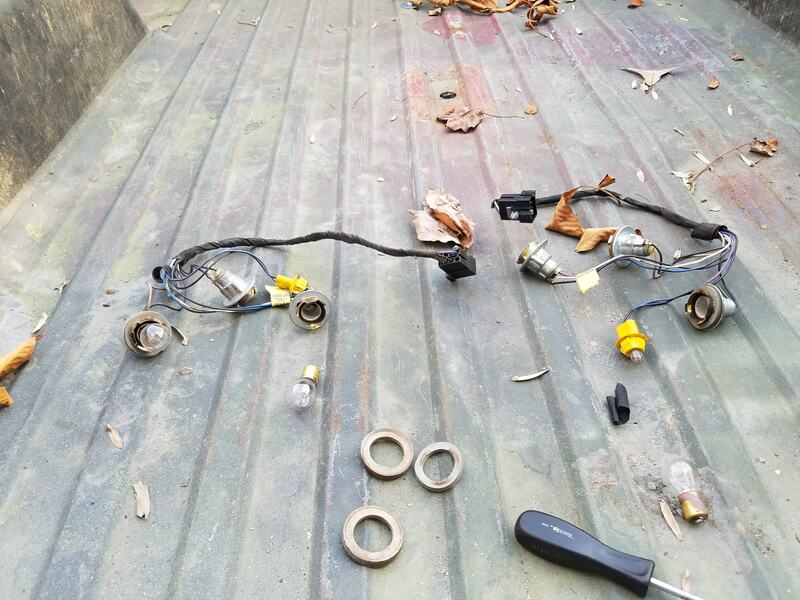 In all the wait time I had with the leaf springs, I looked into the poorly hacked wiring harness for the taillights. I sat down with a wire diagram and clipped/soldered the entire harness back to its former glory, then rewrapped it. 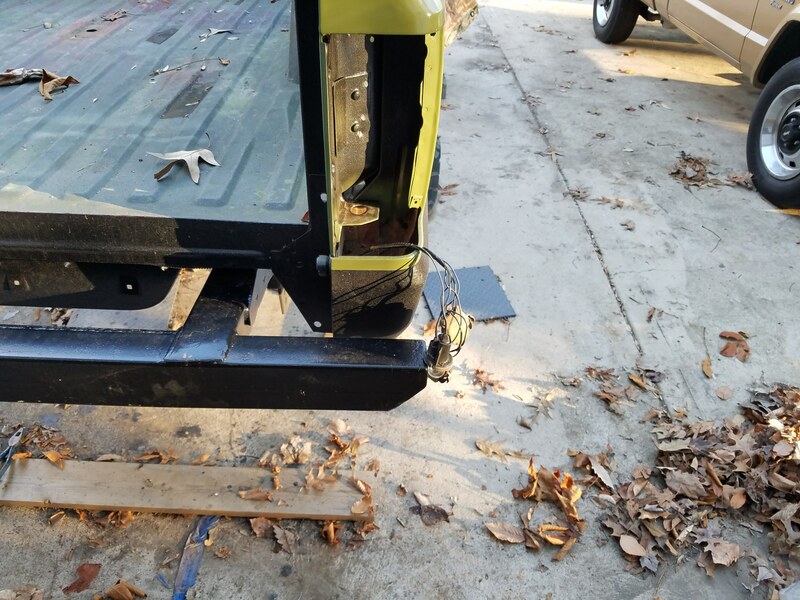 I eventually installed the rear bumper and put the plate holder back on and then popped the harness back in with some fresh new clips. With it back on the wheels, I hooked the battery back up and started it to see how everything was running. 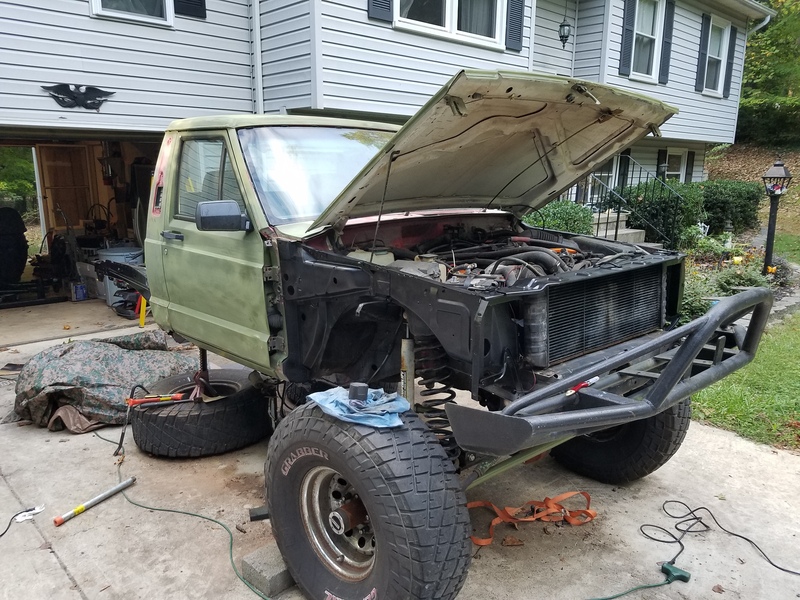 I triple checked the bolts, and put the driveshaft back on, reconnected the brake lines and wires along the frame. The list was getting shorter and shorter and most of it was detail work. 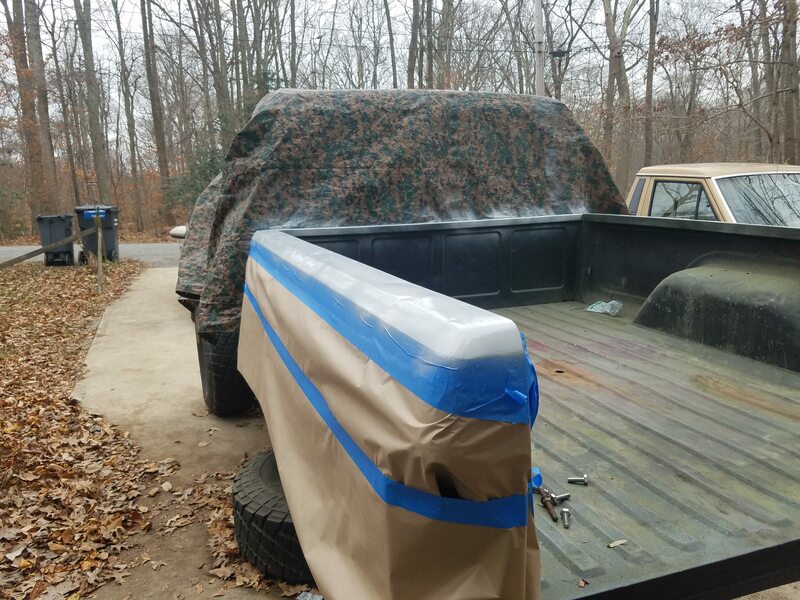 Touching up the paint, torquing bolts, general cleanup but in between all the days in the freezing cold and whatnot, I ended up getting pneumonia. 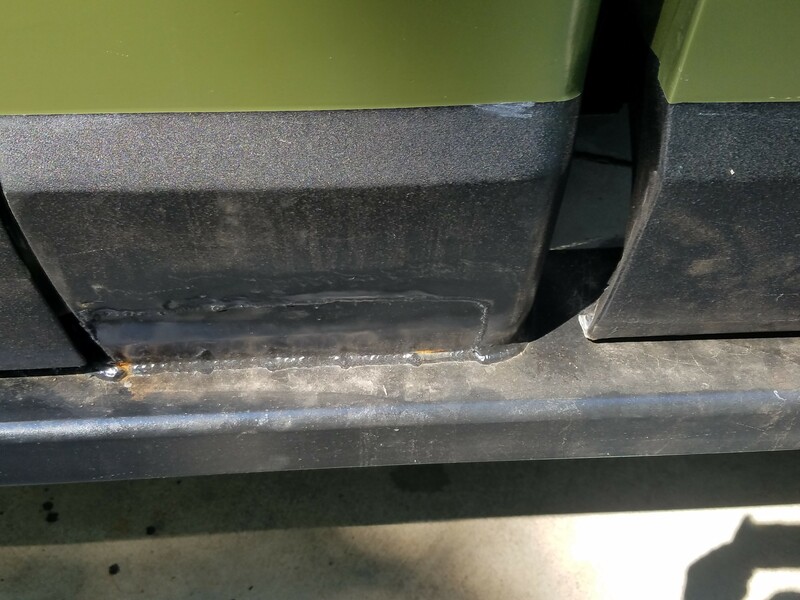 I broke out my power bleeder and bled out my rear brakes, which was fine for the drivers side, but the passengers side started hemmoraging fluid out of it. 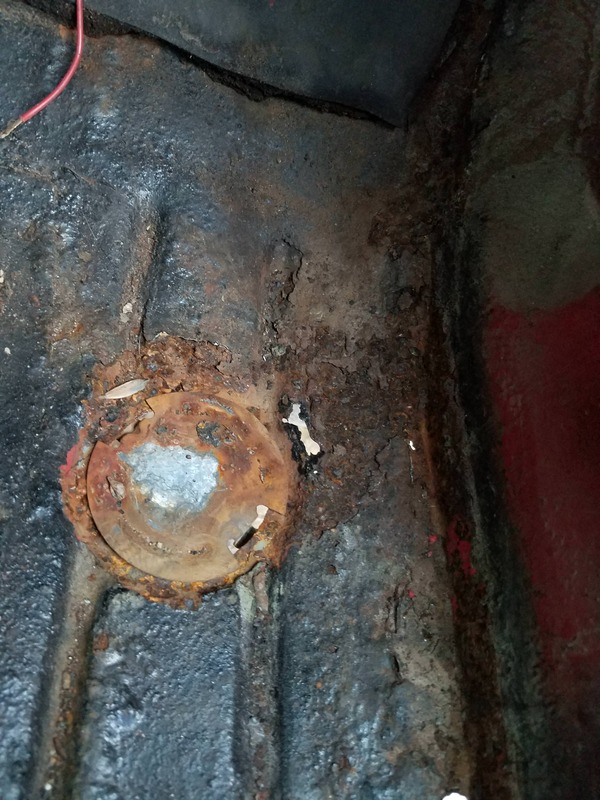 It took a little looking but it was just leaking out of the banjo bolt. For some reason, no amount of torque could stem the flow. 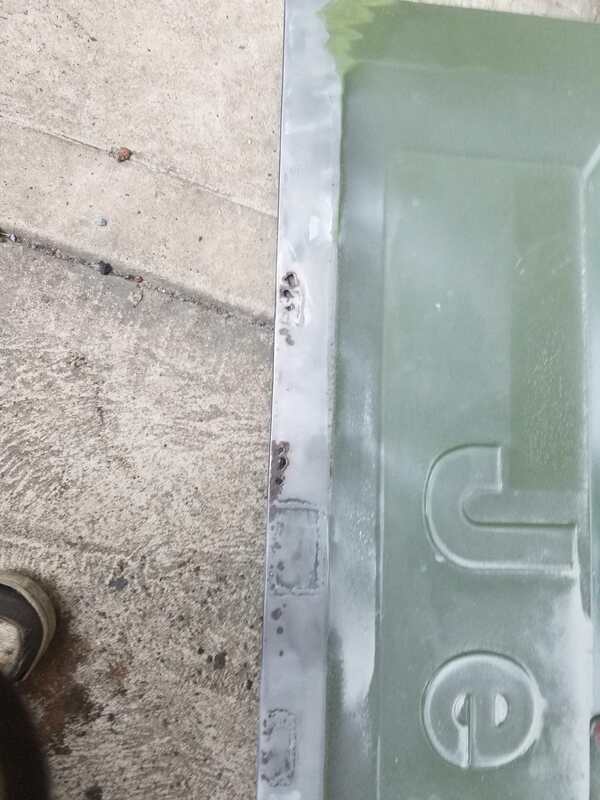 After trial and error, and trying not to lose all of my fluid, I was taking it off and found metal file to start evening the edges, hoping it would stop the leak. Eventually(an hour later), I got it to stop and seal up. Adjusted the proportioning valve and all was well(I hoped). The next order of business was figuring out the lights. 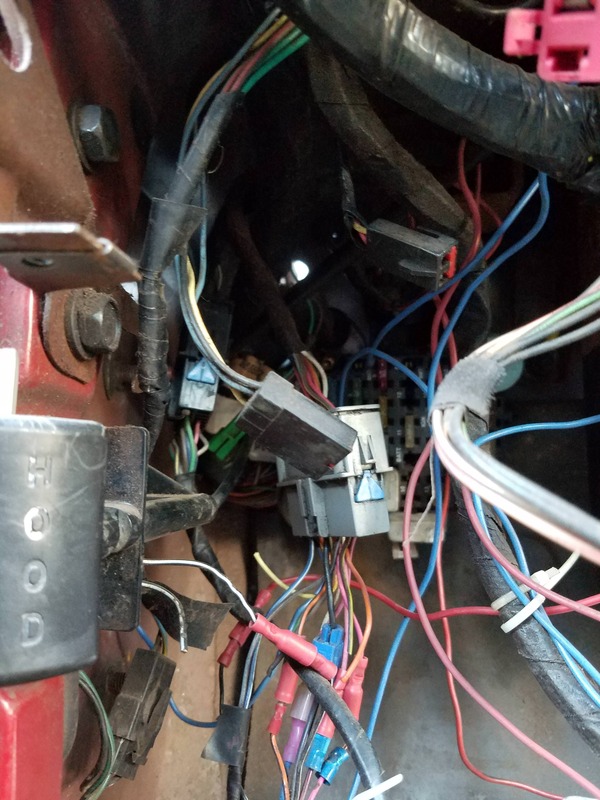 The problem is that there's two parts of harness, one early model renix to the lights, and one late model chrysler from the column, leaving me with a 4 wire setup from the column and a 3 wire setup to the lights. I spent an unreasonable amount of time trying to find wires that worked or not in the rats nest of a harness splice. 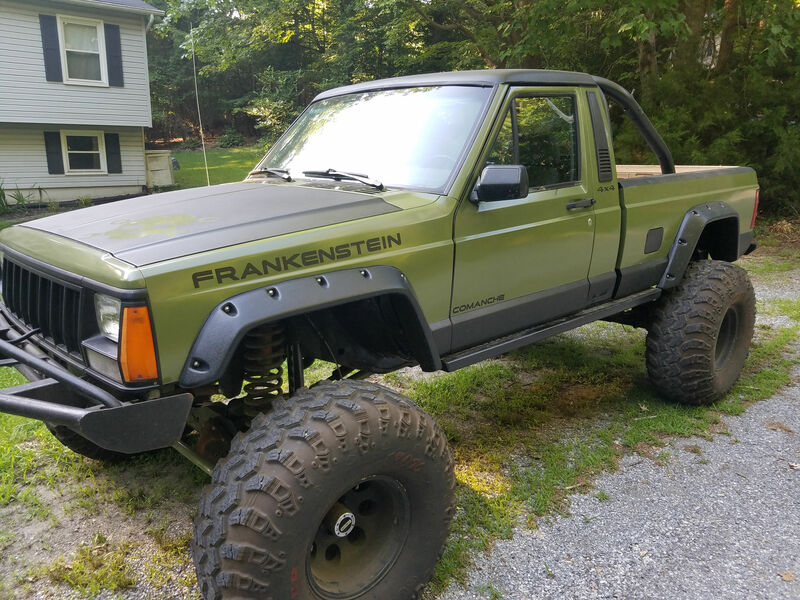 Eventually, after mulling around online trying to find answers, I found a topic from Pirate4x4 talking about the roughly the same thing I was lamenting over. 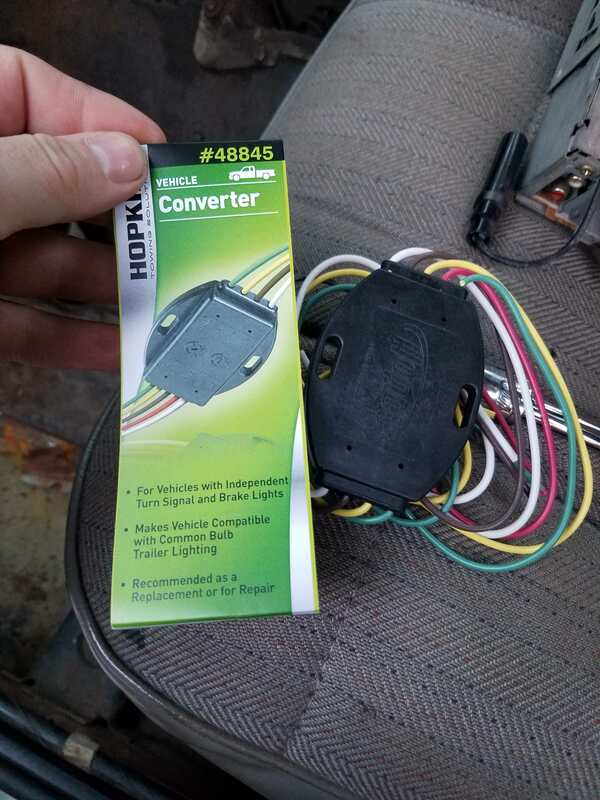 The suggestion was to take a trailer wire converter for 4 to 3 and wire it into it so I could have the multifunction bulbs(turn/brake). I had to go a long was away to find it but did eventually. I wired it up and.... I kind of worked. 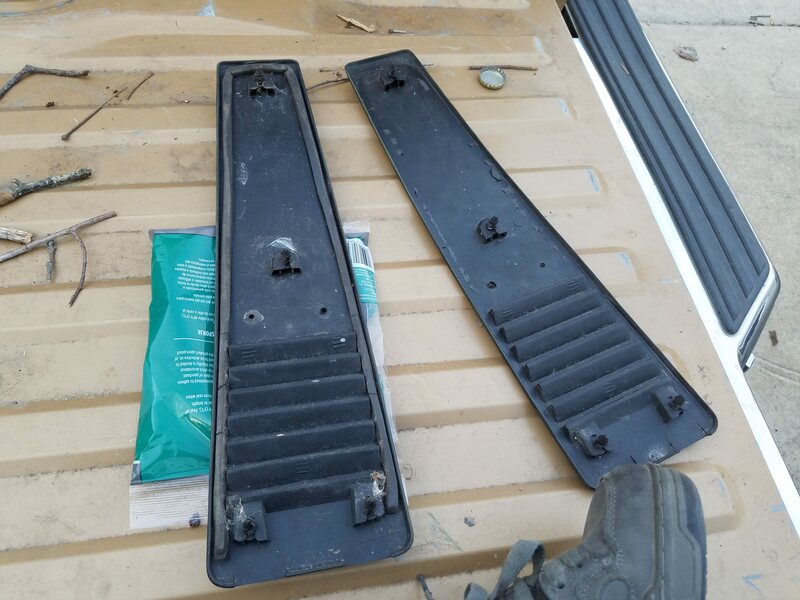 Something is lost in transition with the box that makes it so that I have to incorrectly attach 2 of them together just to get turn and brake, but I don't get any running lights. I didn't really find a solution but it was workable for the daytime. I also took some time to try to solve my door issue. When it's on, theres a gap at the top where you can see outside (fully closed). I read that they can get bent out of shape, so I went to town trying to bend it back, and it seemed to work. Until I looked closer and noticed it was simply using my top hinge as a fulcrum and the bottom hinge was pulling away from the body... So I hammered that back in and simply left it as it, a little gap won't hurt too bad. So after a long while, I finally got the chance to test drive it. Being excited to try it, I overlooked some warning signs I really shouldn't have. For starters, it was idling at around 2000 rpms. 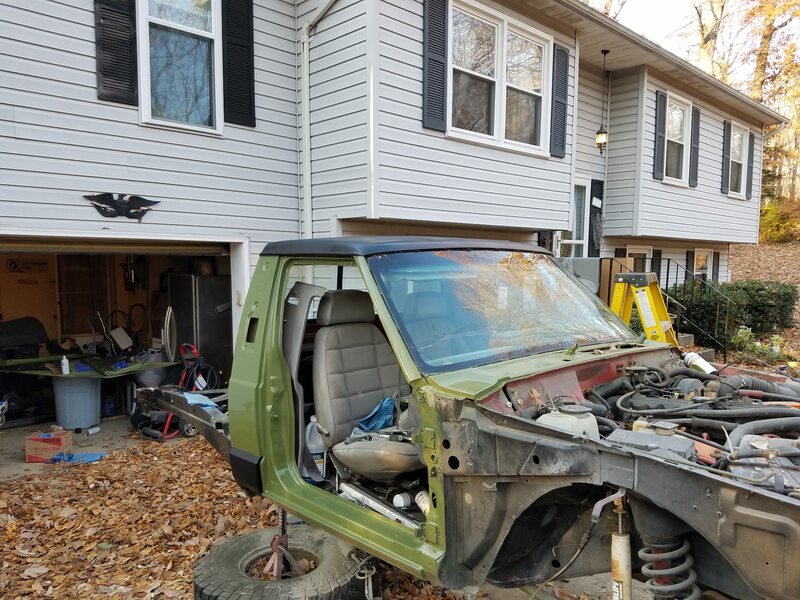 I thought, I'll only drive it around the block, no big deal just to check for other problems. It was VERY difficult to get into gear with it idling so high and when I started driving, my brakes were very spongey and poor. I proceeded with the test drive(should have stopped) and ended up at a stop sign and it wouldn't let me put it into a gear. I tried for a few minutes(to the dismay of those behind me) but no dice. I gave it one more back an forth toss to get it in and..... 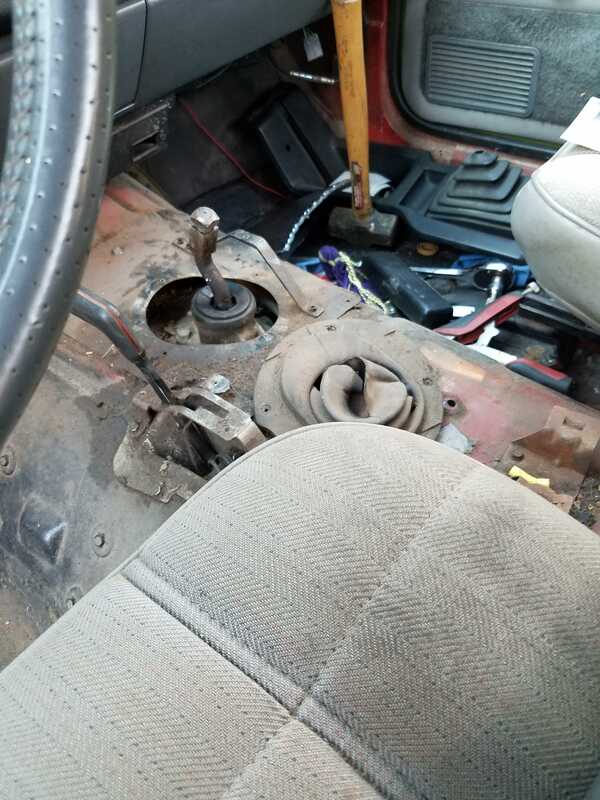 The shift knob snapped off, springing the shifter back into second, and stalling it out. I sat in disbelief for a second and then went to start it again. Even without the knob, I could get it into gear somehow. Except that it wouldn't start. It wouldn't even turn over. 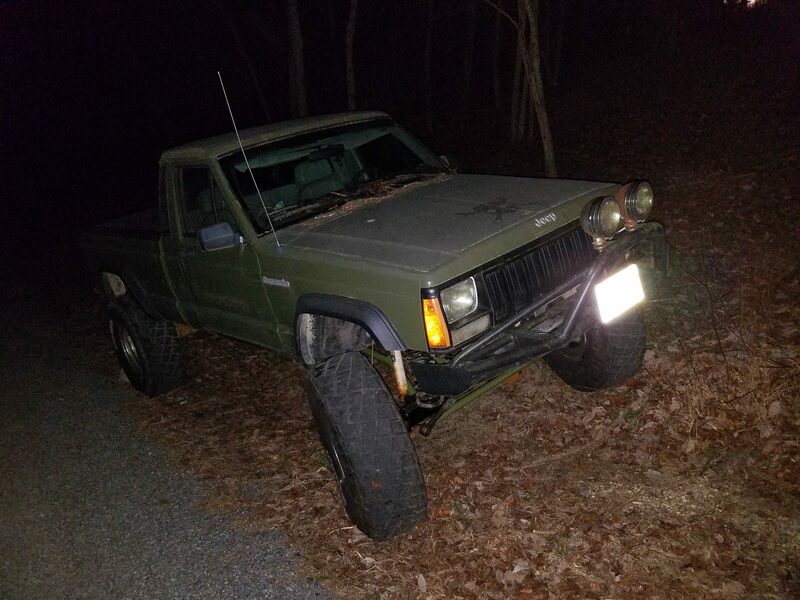 So some people helped me push it back further on the back road and I started diagnosis. First of all, the jolt from the stall managed to, somehow, knock my negative battery terminal loose. After fixing that, it started but still left me with the issue of shifting. Needless to say, I managed to get it back home. 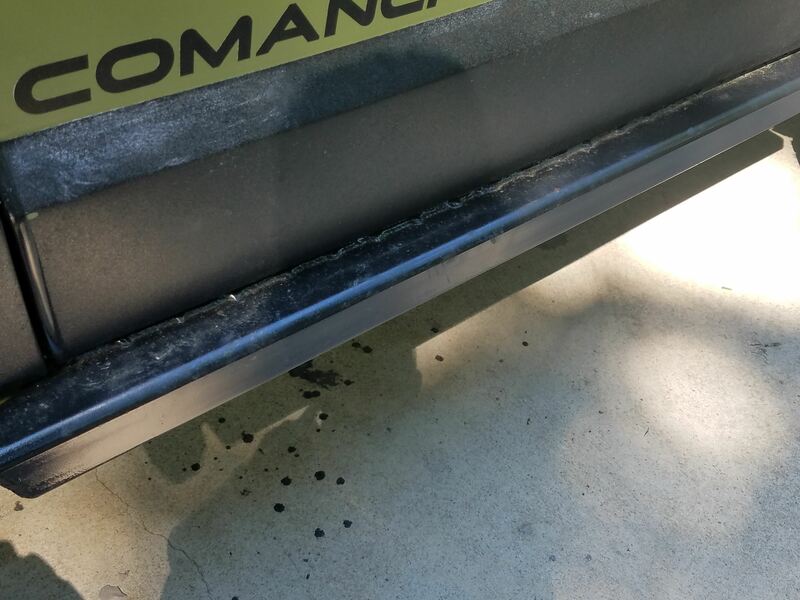 I discovered after really thinking on the rpm issue that it was probably a vacuum issue based around the brakes. And, lo and behold, the brake booster hose managed to pull off of the intake manifold. Problem solved. 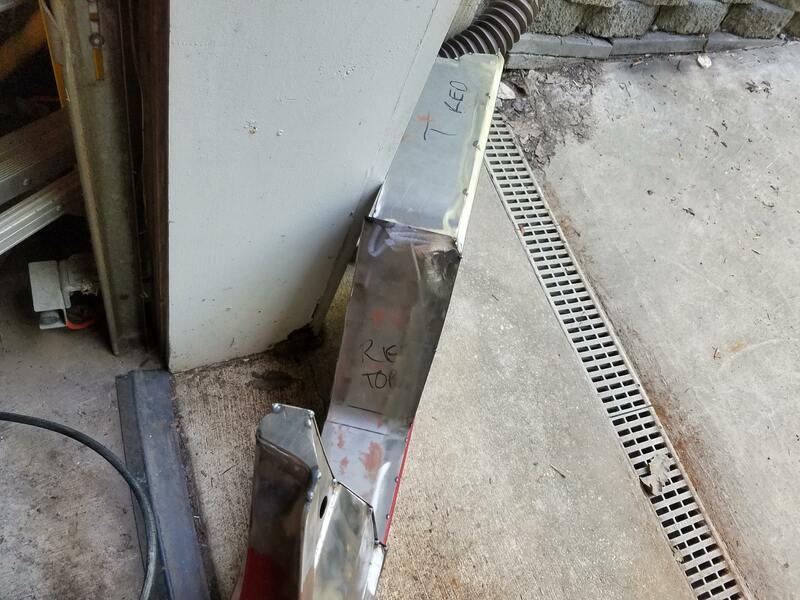 When taking the upper half of the shift column off, however, the crowbar I was using finally popped it off and sent the other end into my head. I brushed it off. Not my smartest move, but it was just a bump. Until I went inside later and realized that it actually gave me a little gash. Could've gone to get stitches, but it was small enough that I just made a butterfly bandage and let it heal itself up. 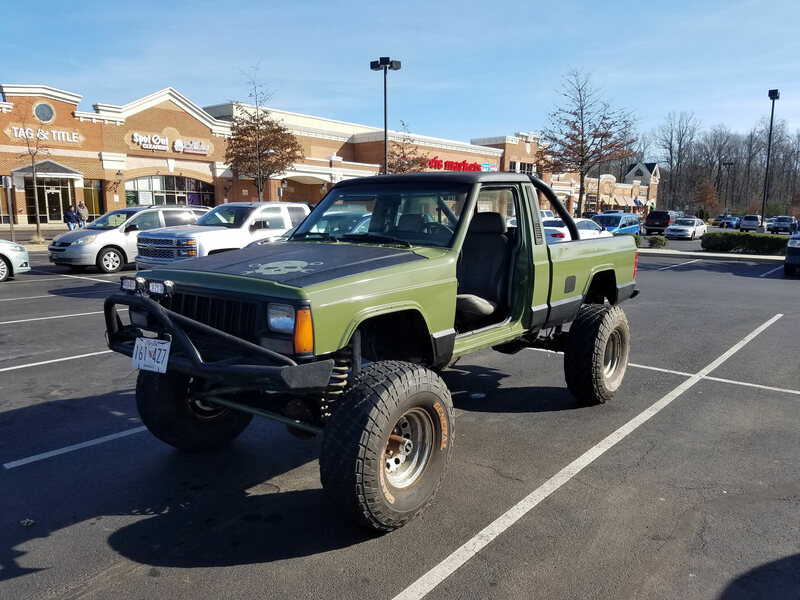 Today was the day for its first real drive after I replaced the shift column and patched it all back together. In the time doing wiring, I did get rid of some of the terrible wire connectors and properly soldered and shrink tubed them(at least the ones I knew actually went to something). And now, the trail of pictures. The bed in the garage. Some of the damage. Not too concerned with it. The wiring harness after I finished putting it all together again. The bed with the first coat of paint. 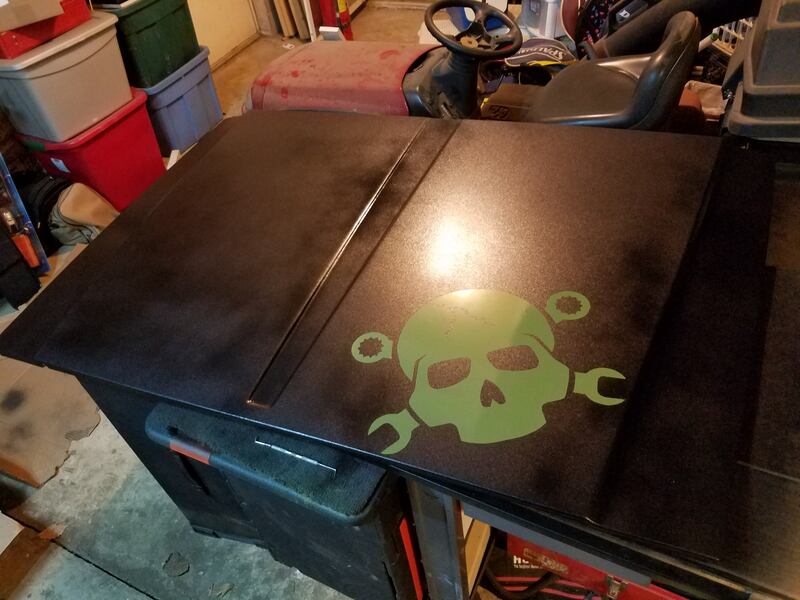 I did some paint on the bottom and in the channels to give it a little more life, but it wasn't incredibly important. 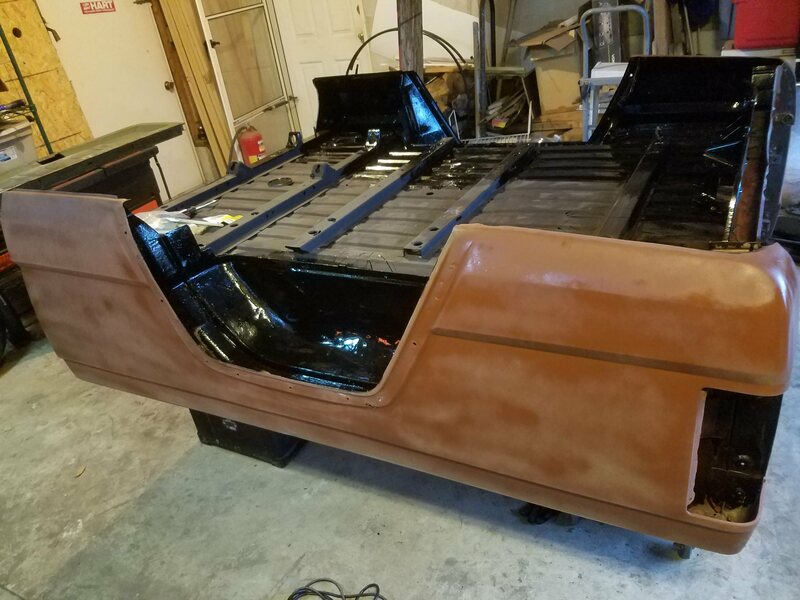 The finish is far worse on it than on the body, partly because it's a temporary bed, and partly because it was too dark to really get a decisive look at the finish. The cuts in the wheel wells. Again not perfect, don't need it to be. 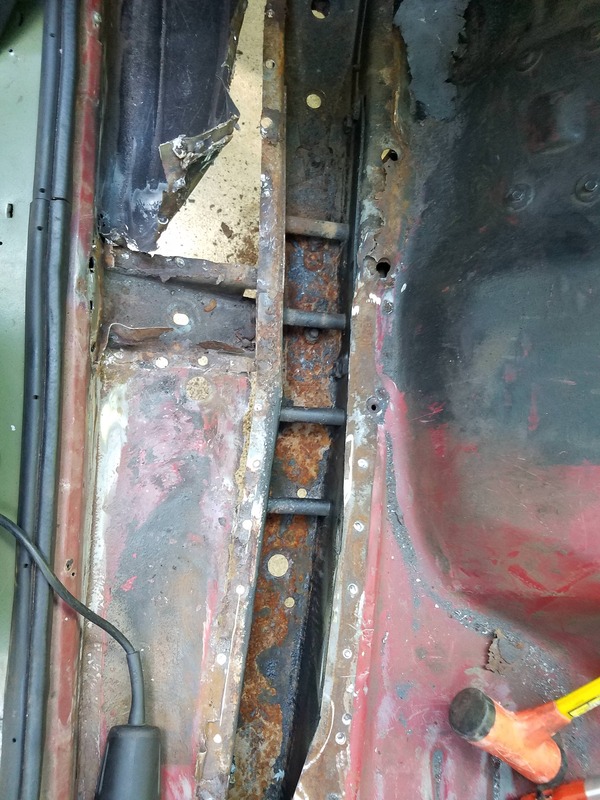 "what's left of my bolts"
I pulled my old rollbar out and sanded it all down smooth so I could refinish it. 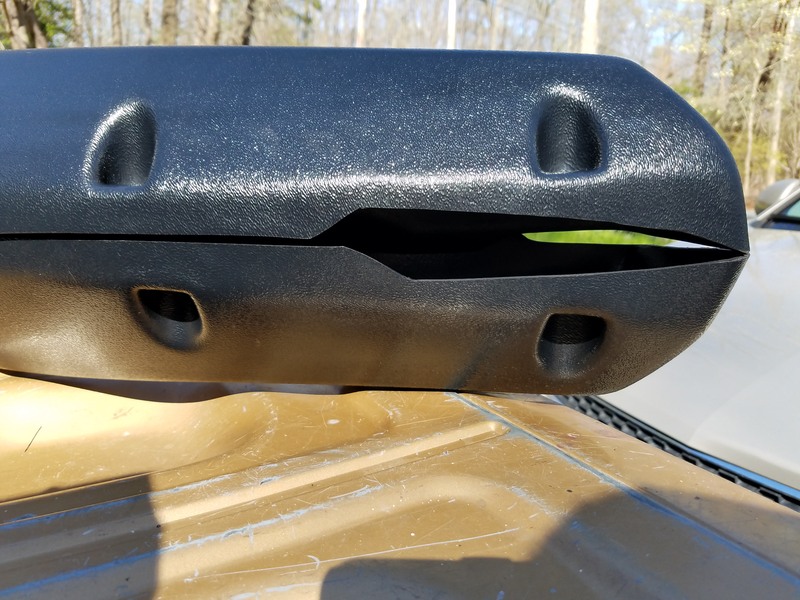 The new bump stops on there. 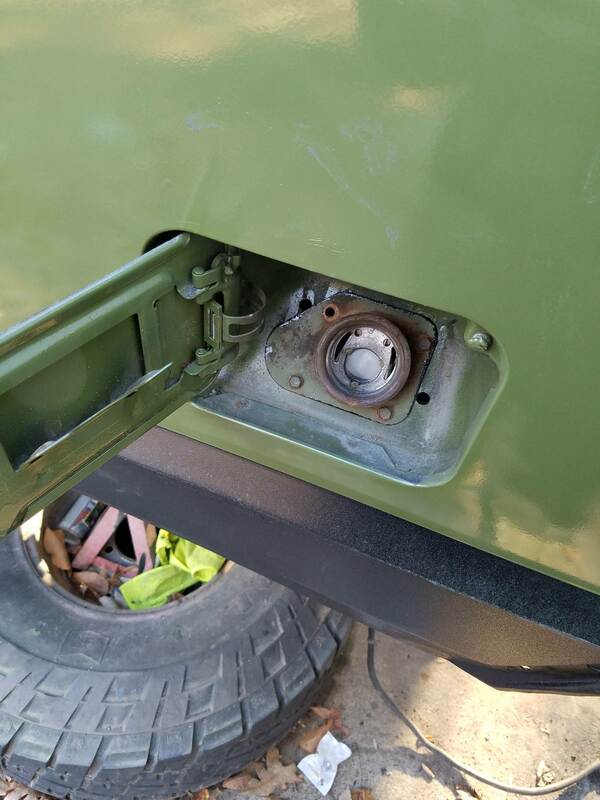 They took a little modification since the bolt holes weren't quite in the right spot. I also installed my new offroad lights and got them all wired in. 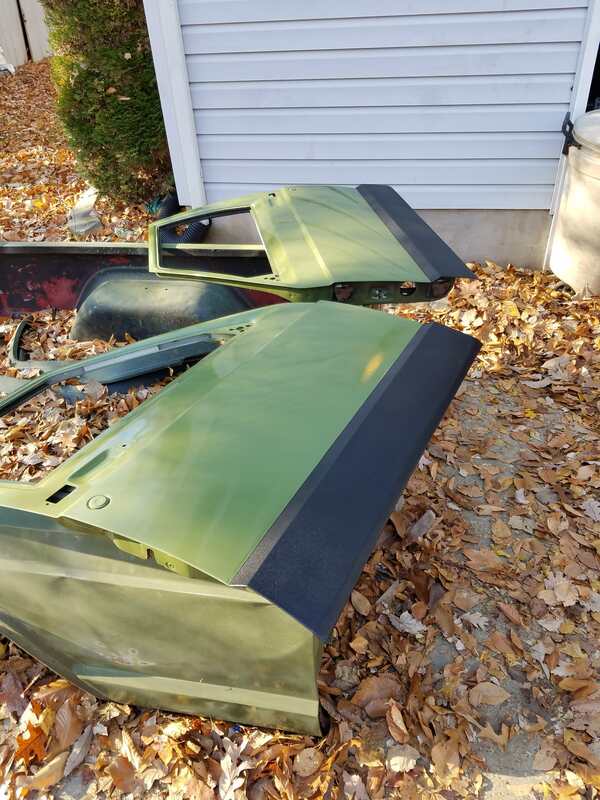 Also a pic of the painted hood underside. 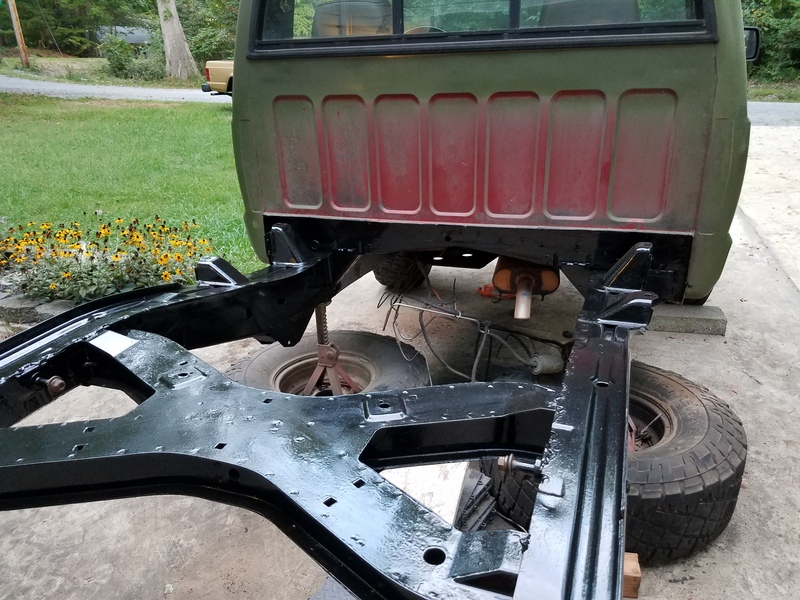 The rollbar primed in base metal primer and then bedlined. My weird way of getting it to stay... Not the best, but it worked. The pump with all the new equipment sanded and mounted. 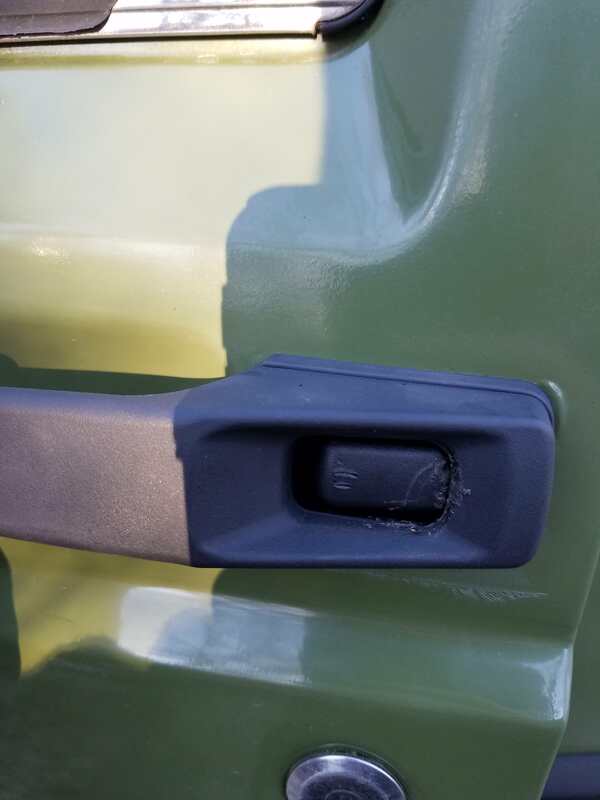 Had a problem with my brand new door handle where the button kept sliding to the side and getting stuck there, causing me to have to pry at it and ruin its finish. 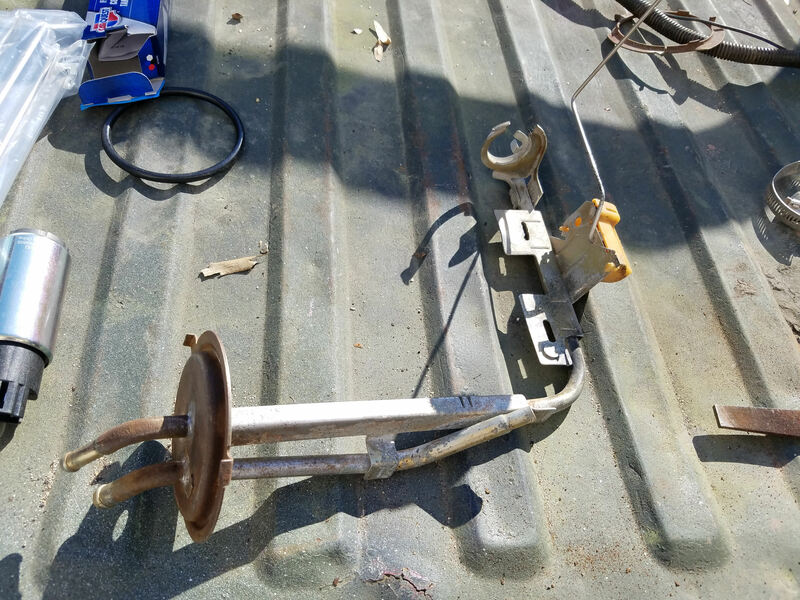 I eventually took it apart and looked at the spring, which was very weak and warped, so I replaced it with the button and spring from one of my other door handles. This sweet relay box that doesn't actually have anything to do with my wiring. I'm too scared that something may still be running through it to remove it though. The piece I got that didn't seem to work all the way. Definitely more to come later on, too! Again, it's been a while since I've posted but progress is moving along very quickly. I'll keep it short on the overwhelming details and give a basic idea of what's been happening. 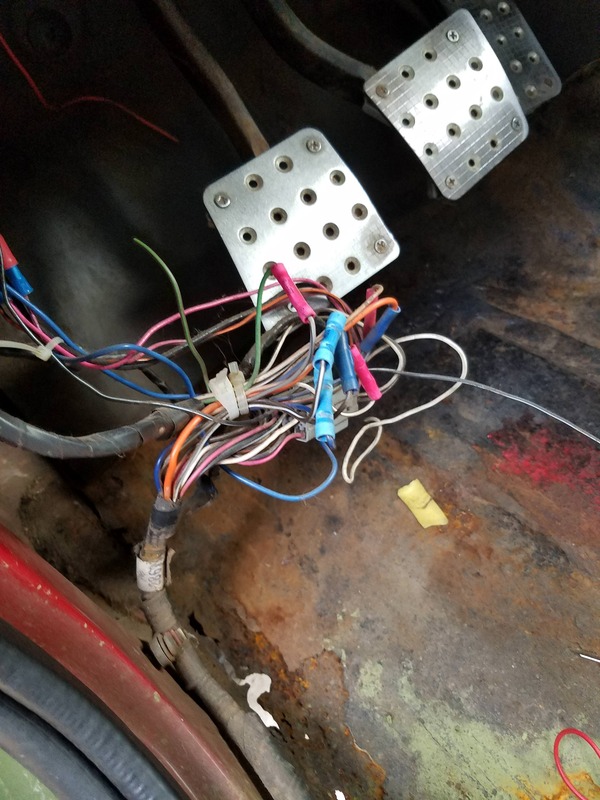 First of all, I figured out my tail light wiring issue. 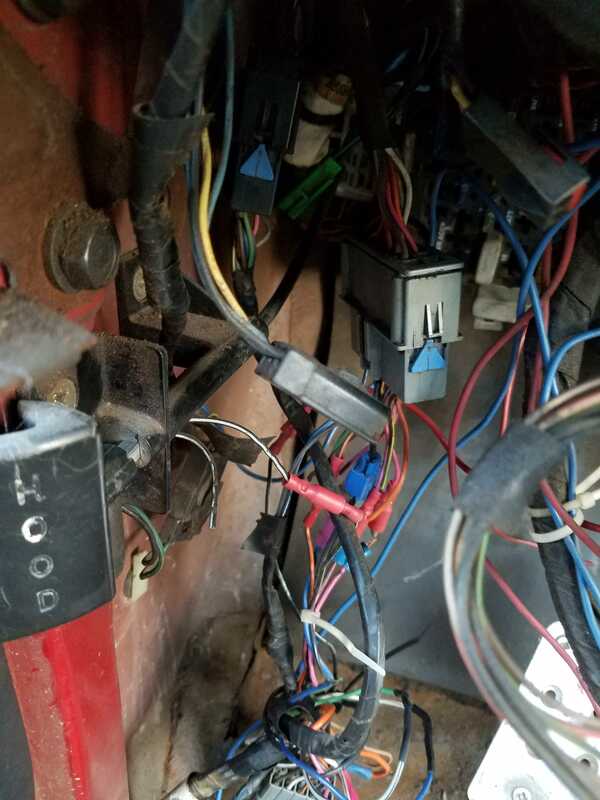 No amount of trailer harness boxes ever fixed it, so I decided it was as good a time as any to just open up the entire harness under the drivers side dash and work out all the electrical from there. While poking around, I kept coming back to the fact that the brake lights should be dealt with by the turn signal switch assembly. 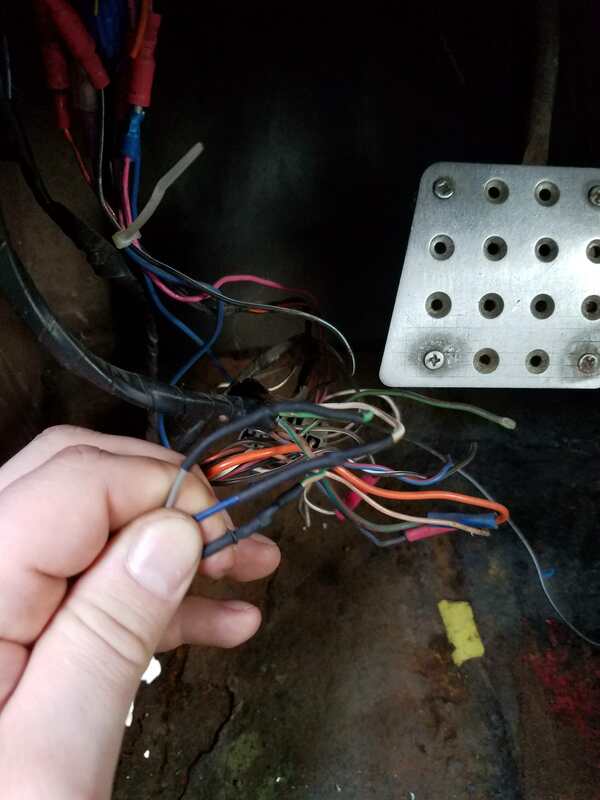 While taking all those connectors off, I finally found a guide picture that told me what color wires coming out of it belonged to what signals(It took a while to find one as the wiring manuals were always different or wrong). 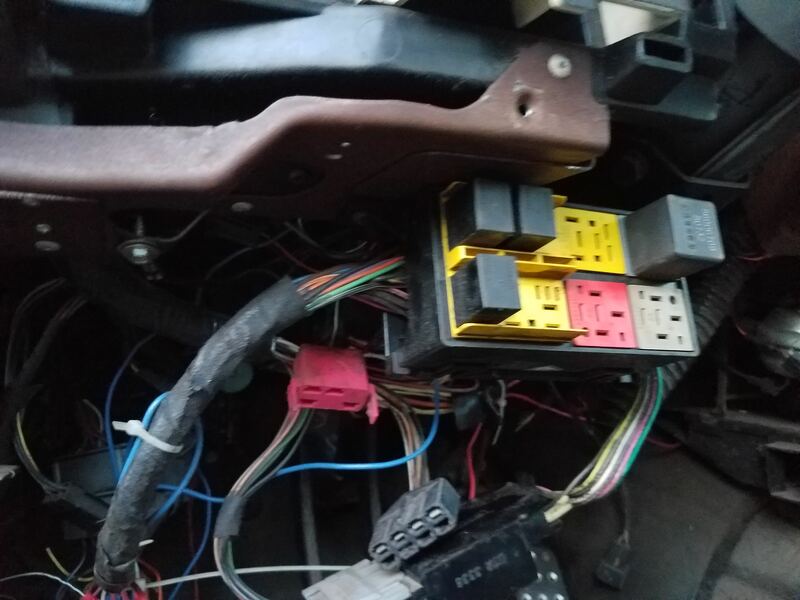 Turns out, I had no input for the brake lights for the switch to use, so I pulled one of the unused wires out(ignition chime, I believe, since I don't have that) and use the metal tab on the end to make my brake light wire fit in. Plugged it all up and everything works. Finally, I soldered and heat wrapped up all the wires and put it back together. 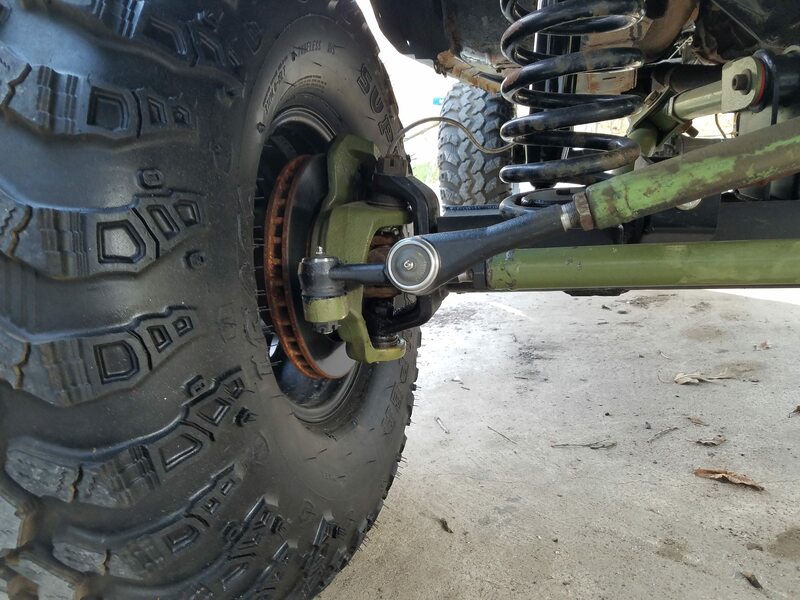 In the mean time, i also replaced my very old shocks and all of my tie rod ends on the front. 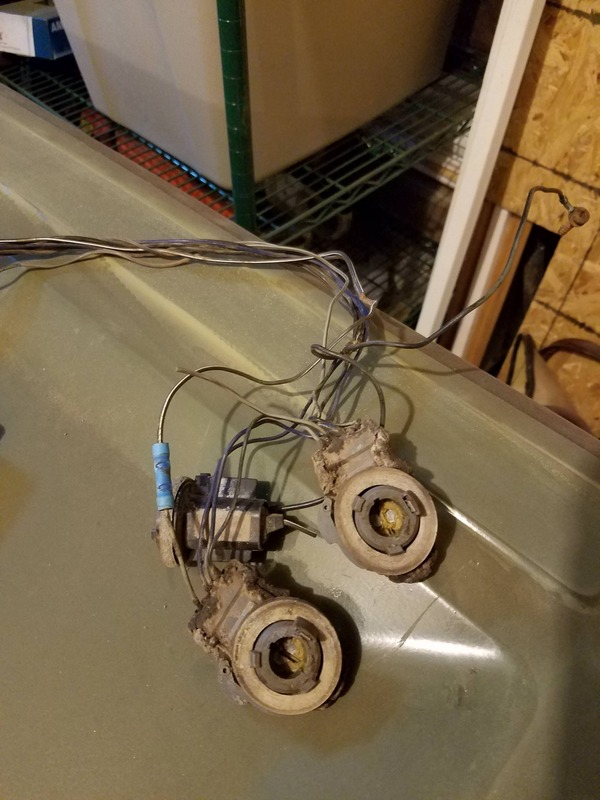 The old shocks were in pretty rough shape with most of them not having any resistance(and seeming to be filled with water). 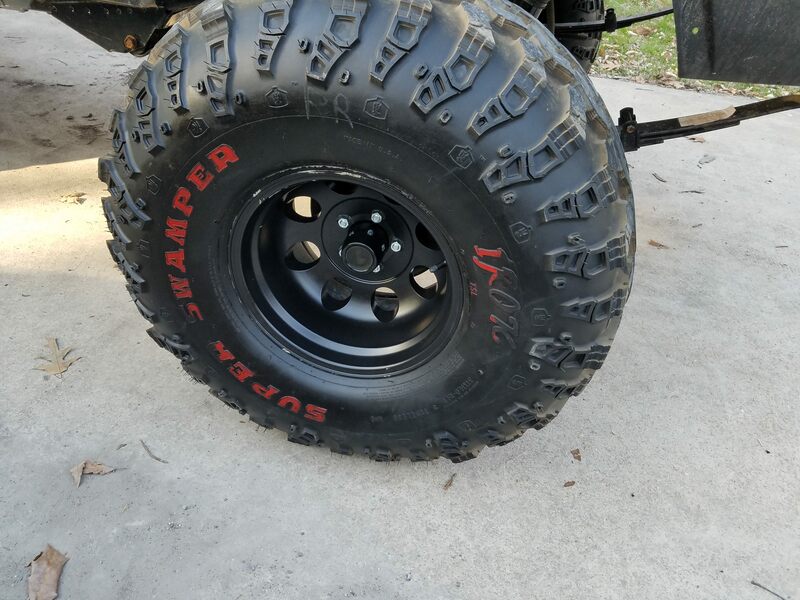 I replaced them with Skyjacker BlackMax shocks(really trying to keep with the black and green theme). The tres were JCR 1 tons and it took some real effort to break the old ones loose from the rods. But after replacing them, I greased up all the fittings I had, including the ball joints, u joints, and drive shafts. Afterwards, it ran smoother than it ever has. Turning was effortless now, and putting new ones on allowed me to correct the steering wheel offset. I also tightened up the pitman arm, which had worked it's way loose. Fortunately, no wear on the splines. 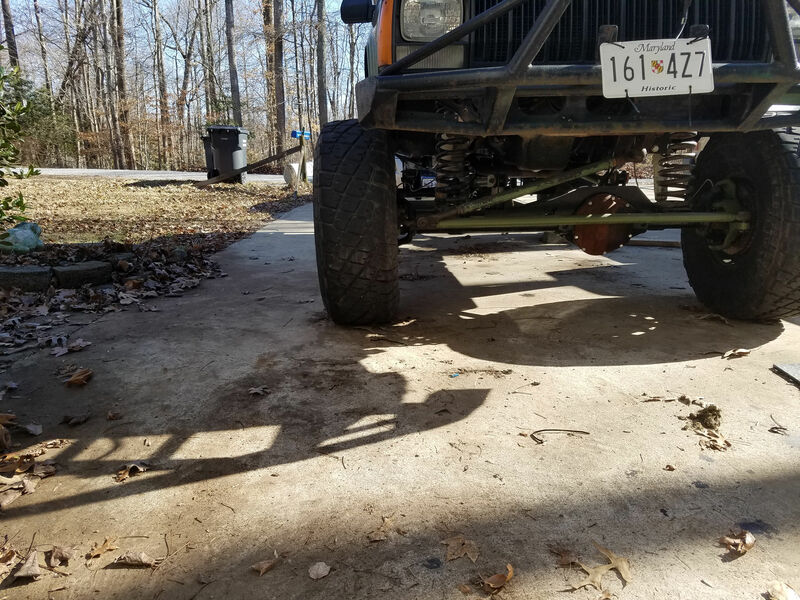 I did notice that my wheels have some camber difficult, leaning in at the bottom, but I don't have any older pictures from before the front axle work to compare it to, so I'm not sure if it's been like that or not. It's not an incredible amount, but it's noticeable. 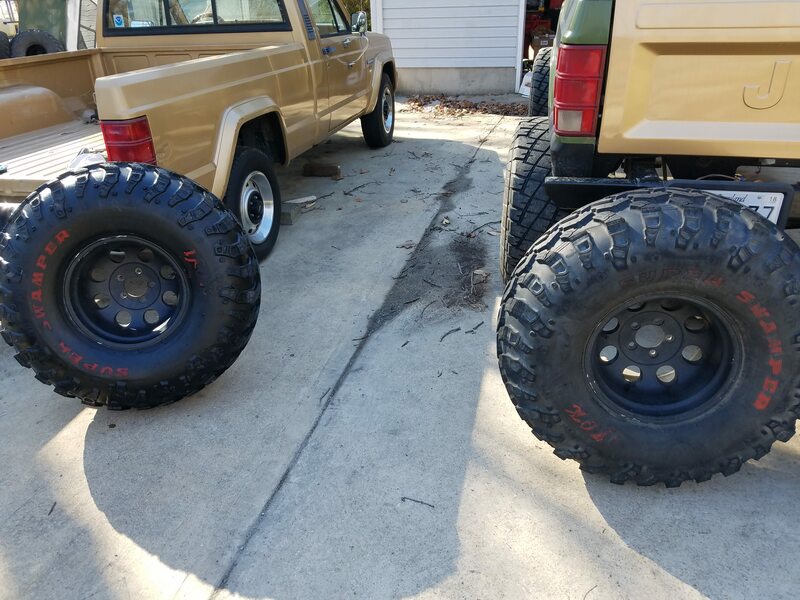 I finally received my new(to me) wheels and tires for it. 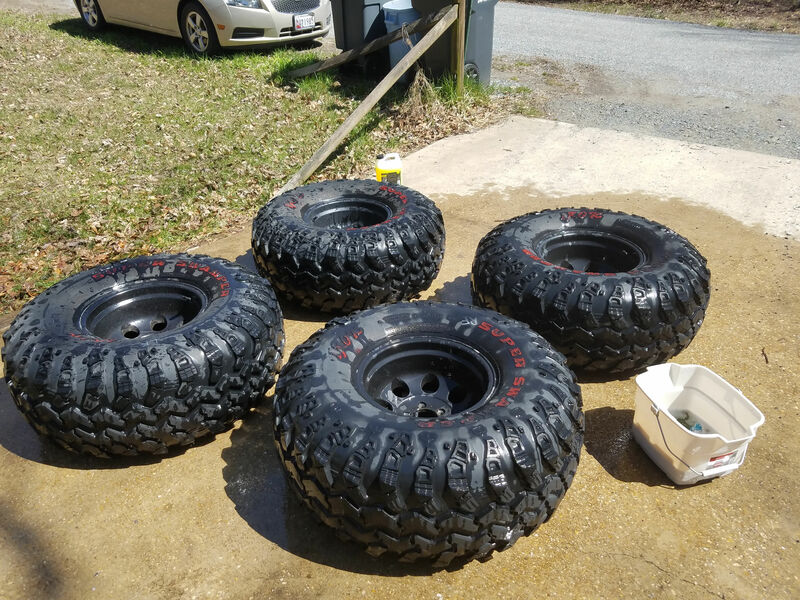 I took a while prepping the tires(cleaned and degreased then coated with a heavy duty conditioner). I also needed to install some small spacers to keep the tires from rubbing and to change the lug pattern to the wheels. The biggest difficulty was the front wheels being a hairs width too small in the center to fit the hubs through. I lightly sanded it a bit, working slowly to keep it even and now they fit snug. The only issue now is that I need to balance them better. I tried tire beads because I've had good results before with them, but this time, it's just too random. It shakes and shimmies sometimes, bounces around when excellerating, and causes all kinds of problems, but only some of the time, like the beads sometimes get it right and balance properly. 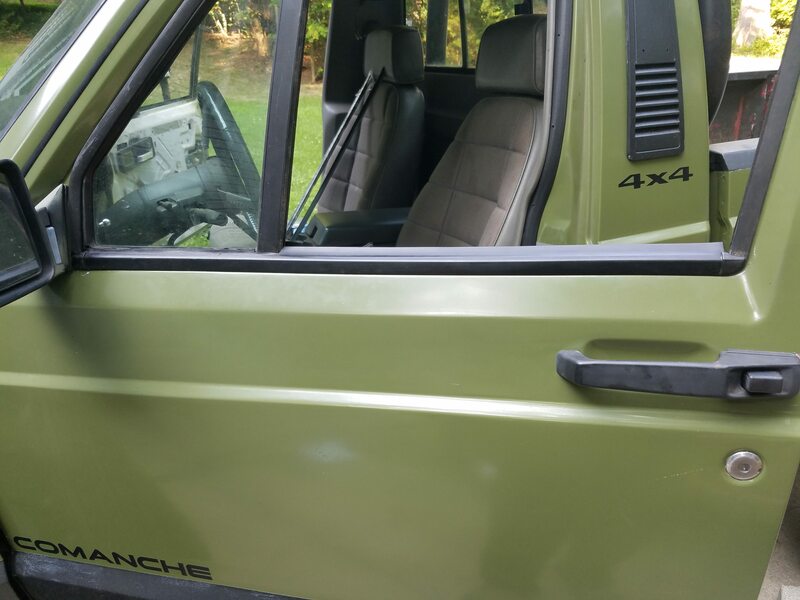 I purchased some stickers from Jeepsticker.com just for my doors since I'd rather go with heavy vinyl than emblems. They looked so good I asked him if he could possibly do some special custom stickers for me. He's currently working on it. 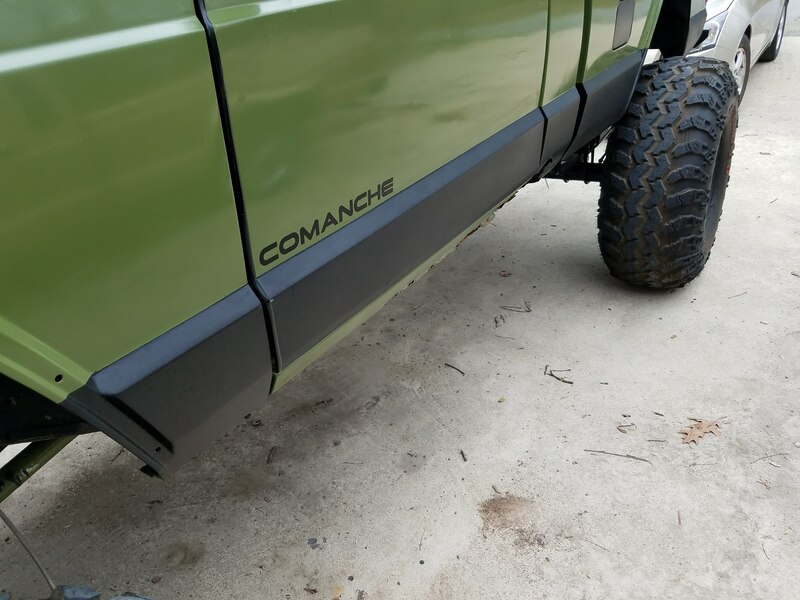 I also got my hands on some Napier fender flares and installed those as well. Getting the first cut out was a nightmare and despite my constant questions, I did eventually manage to figure it out and get them all mounted. 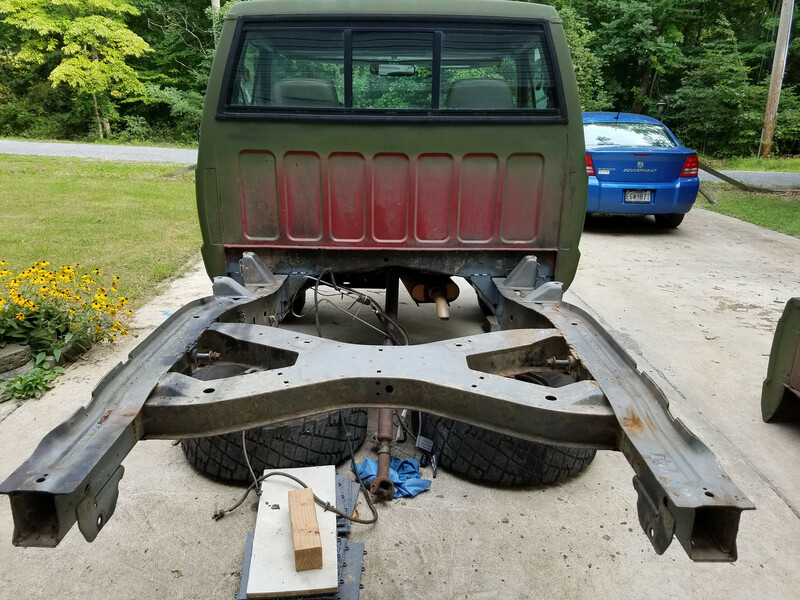 Now, the truck is in having the rusty rockers cut out and replaced with some 2x6 1/4" steel tube for rock rails. 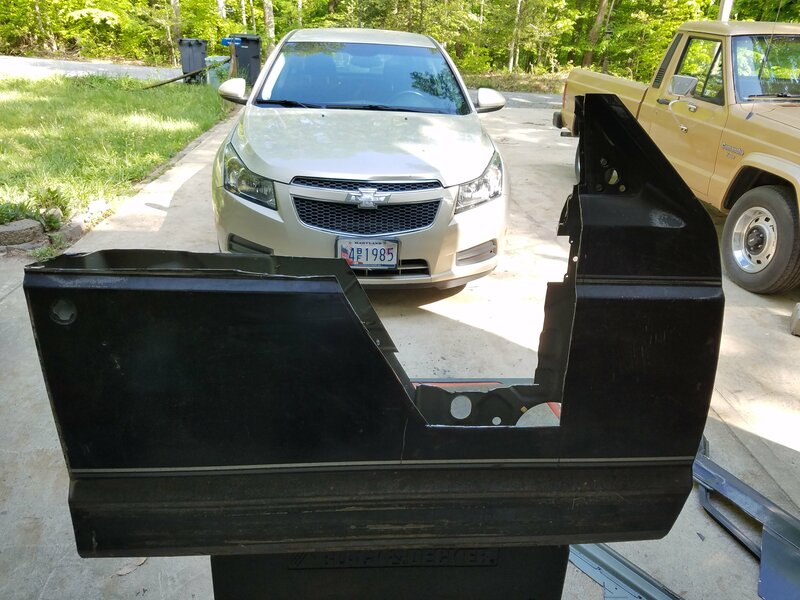 I took it back to the guys who did my frame repair, since we had talked about it previously and they do really good work. 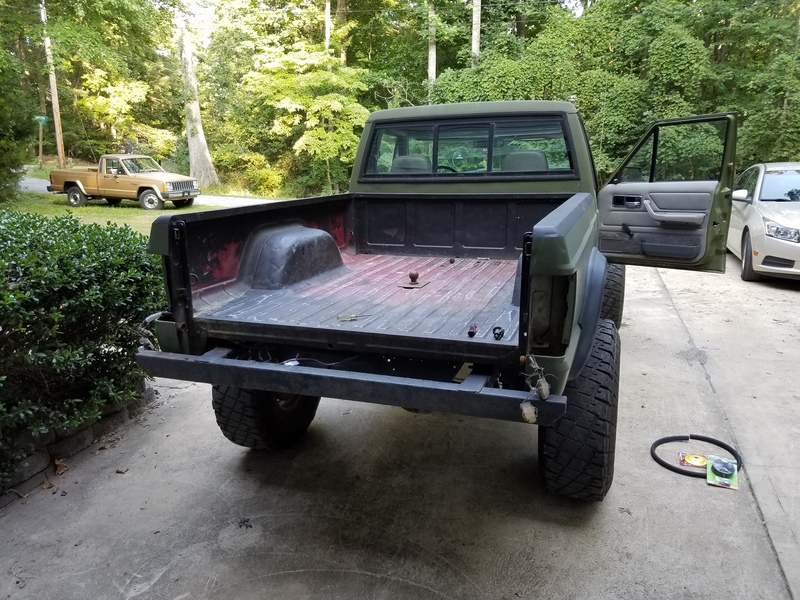 With that and a few other smaller details around the truck, it should be done in a few weeks. The bed after the cut. 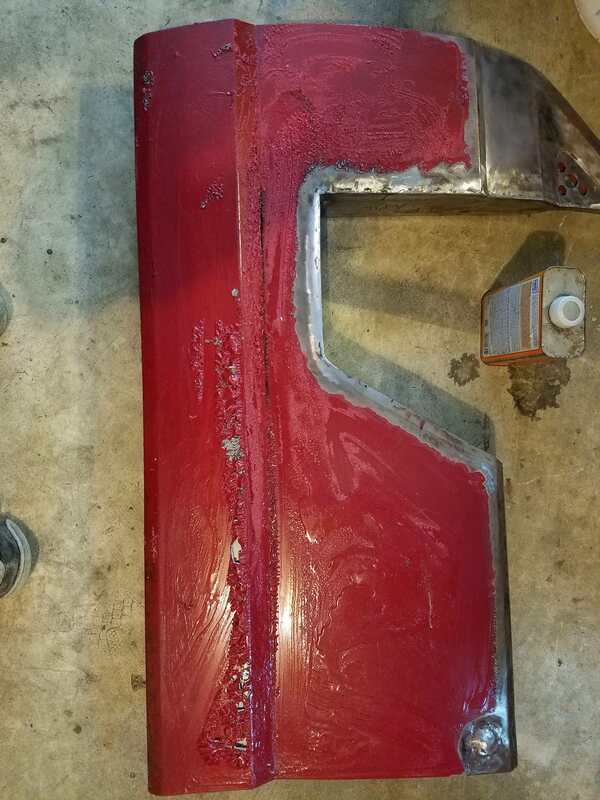 Never realized how much bondo was on that section. It really shows. 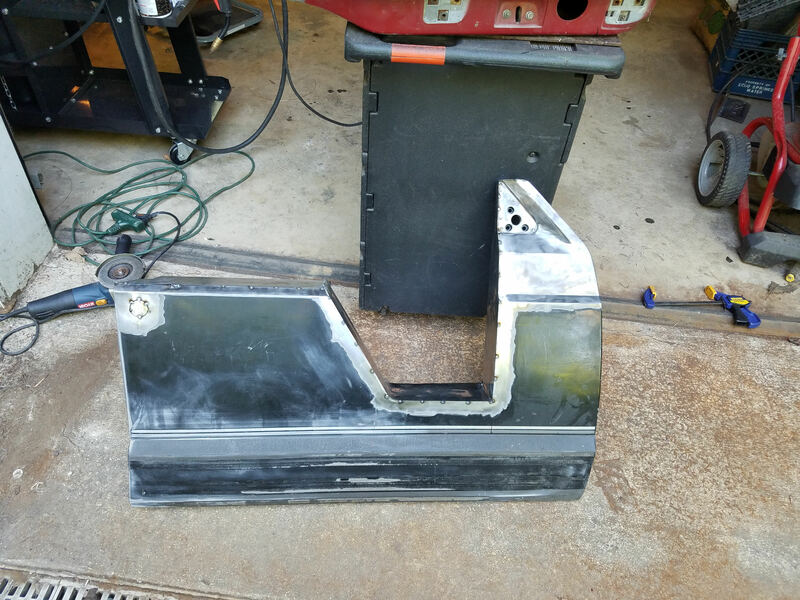 One of the fenders after being cut out. I tried to smooth it out as much as possible. A close up. 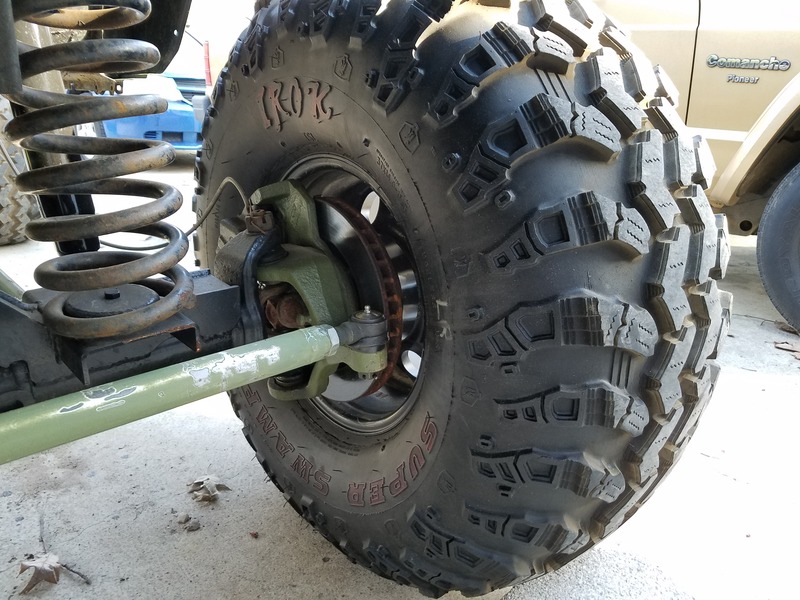 They have some rock rash as they were used before but the tires were pretty much brand new. Also go the center caps on. 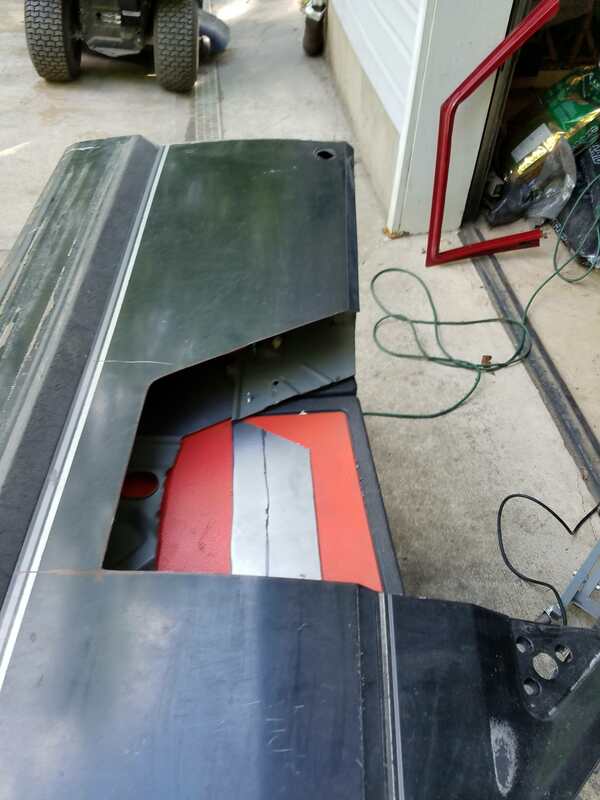 I also took the cab vents off to redo the foam seals around the edges and repaint them since they looked bad before. How they looked before, cracked and flaking paint. The bottom one was after sanding it down. New wider seals that I left around the vent section because the cab bends in there so it provides a better seal. Finished product. 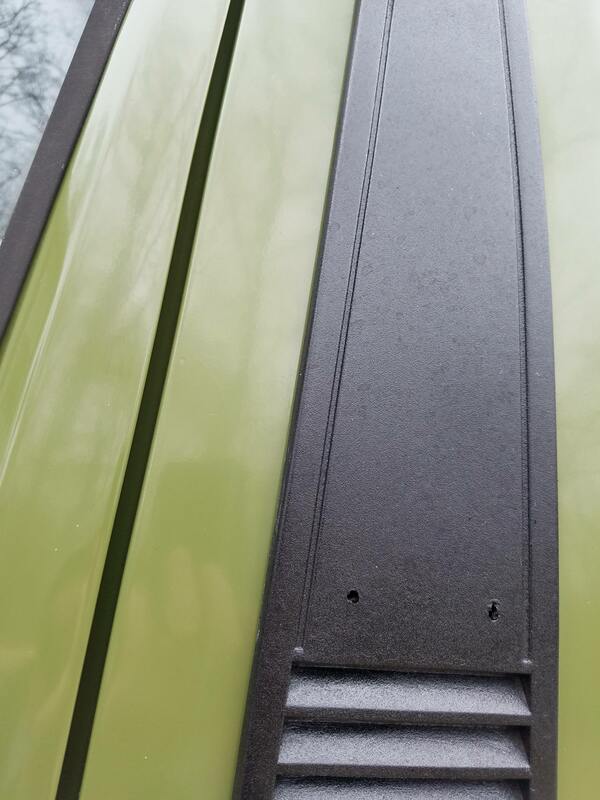 That Ace Truck bedliner is about the most versatile, easy to use spray on I've ever seen. Such a good product. The flares I received had what seemed to be a bad cut on one that made it not quite line up, but in the end, it wasn't a big deal. Me checking the torque numbers on the spacers to make sure. 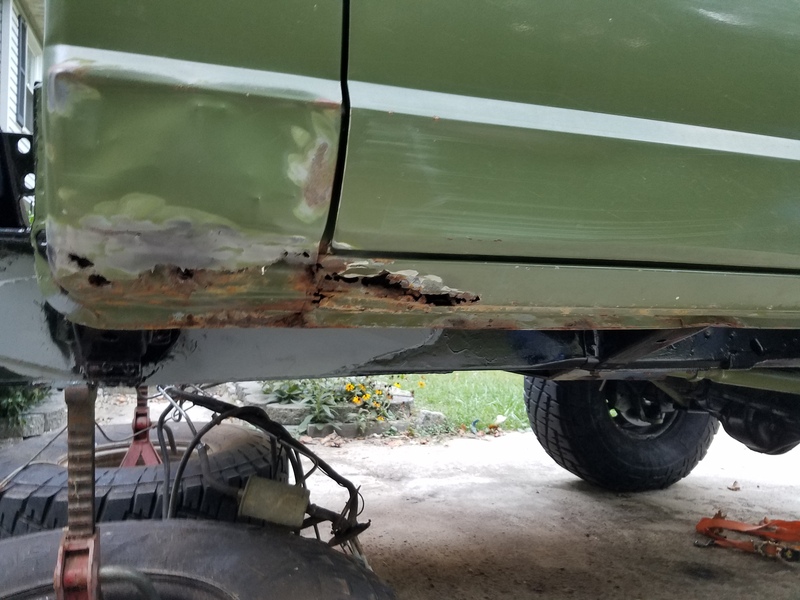 The truck has been in for a bit now getting some of the final rust patches taken care of. 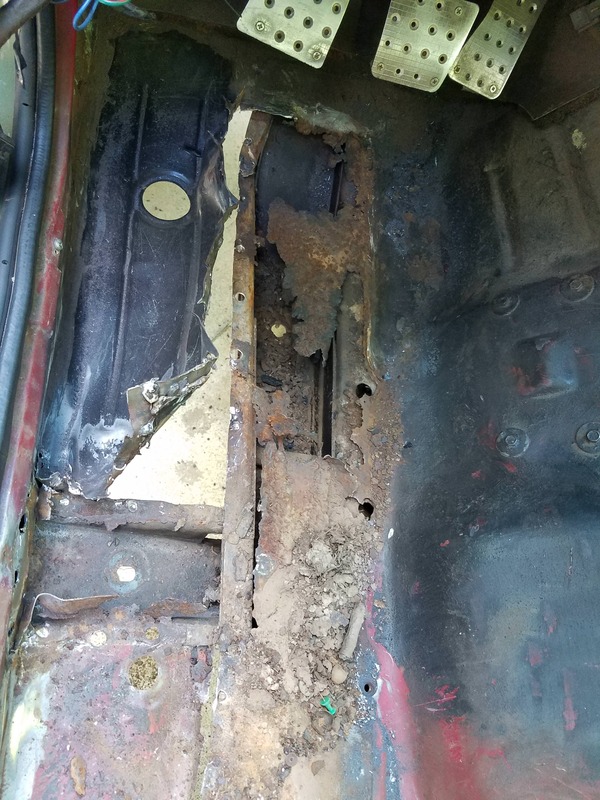 Floor boards, Rocker/Rock rails, and my old ruined door striker are all replaced(I only just began doing welding, so I wasnt confident in heavier metals). Ended up being more expensive then previously estimated. That coupled with the fact that I have some incurred hospital bills for tearing a large muscle in my shoulder have kept me from retrieving it for the time being. 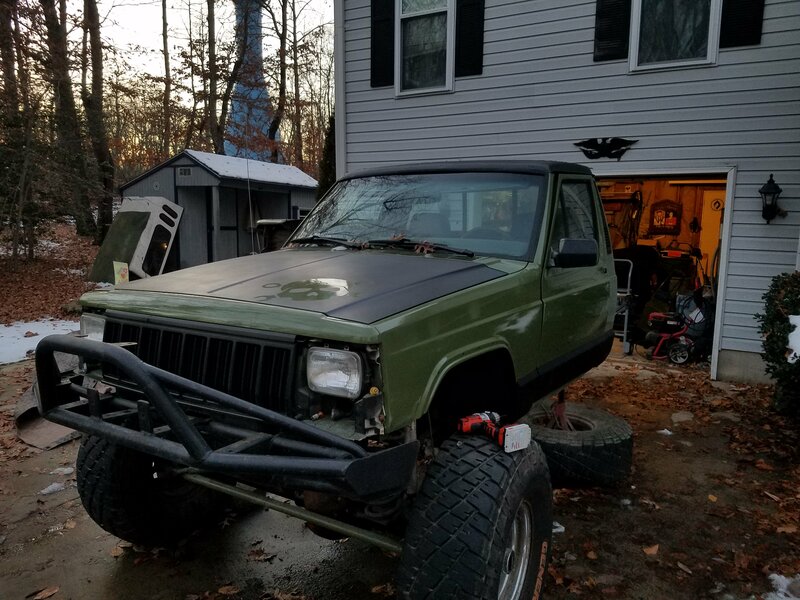 Soon, I'll have it back, and then, of course, more work. 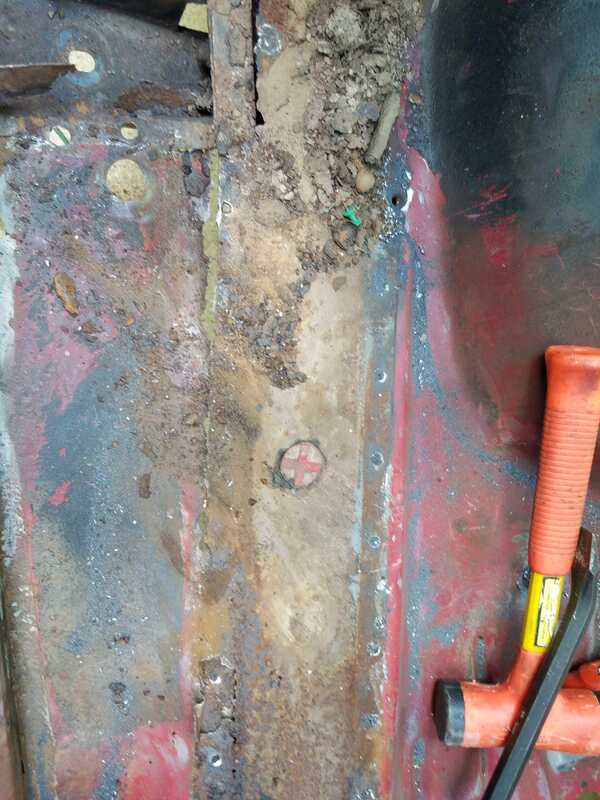 With the floorboards finished, I'm going to be bedlining the entire lower interior as well as the new rock rails. What I've been working on instead is a set of trail doors. 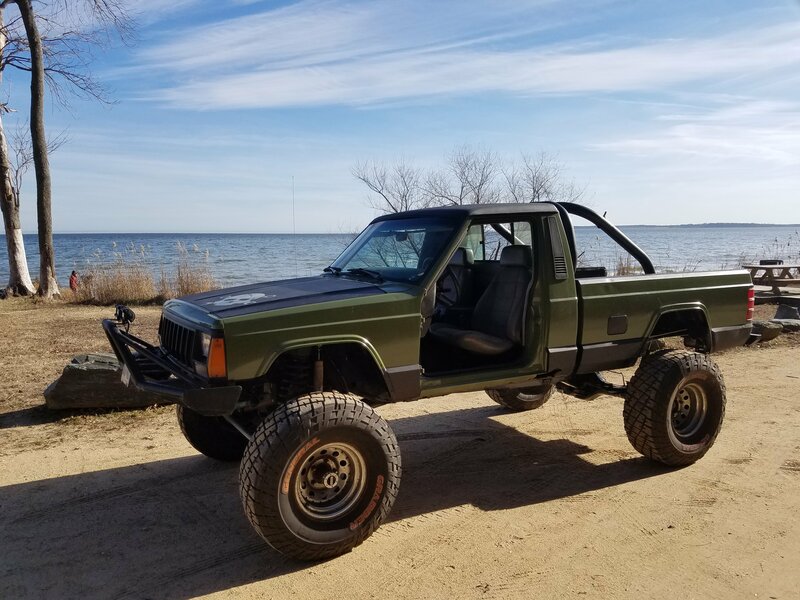 I've always been picky about having a "stock" look, something that compliments the truck itself. 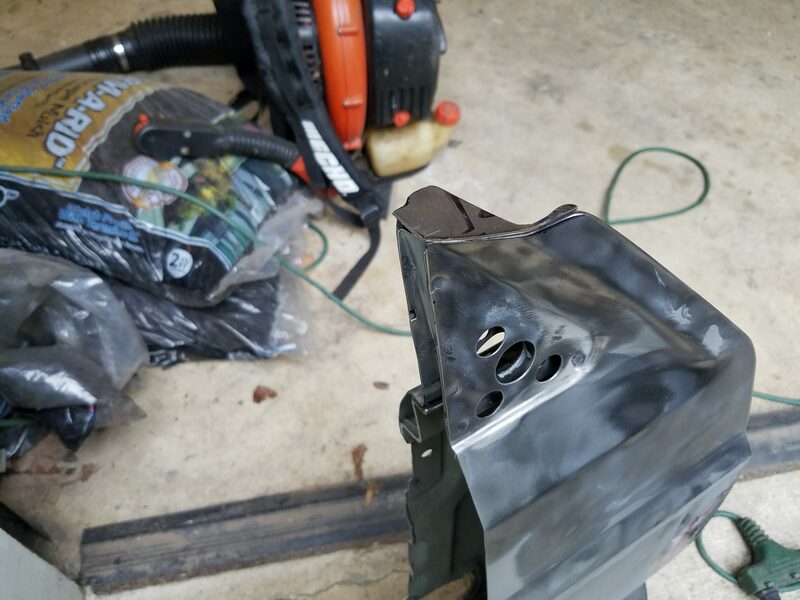 I already had a mig welder, so I figured it's about time I learned the last obstacle in my way. I purchased all the extra supplies I needed and practiced for a couple days with the flux core and then one day with the gas. After that, I broke my extra set of doors down, carefully measuring for what I wanted out of it. 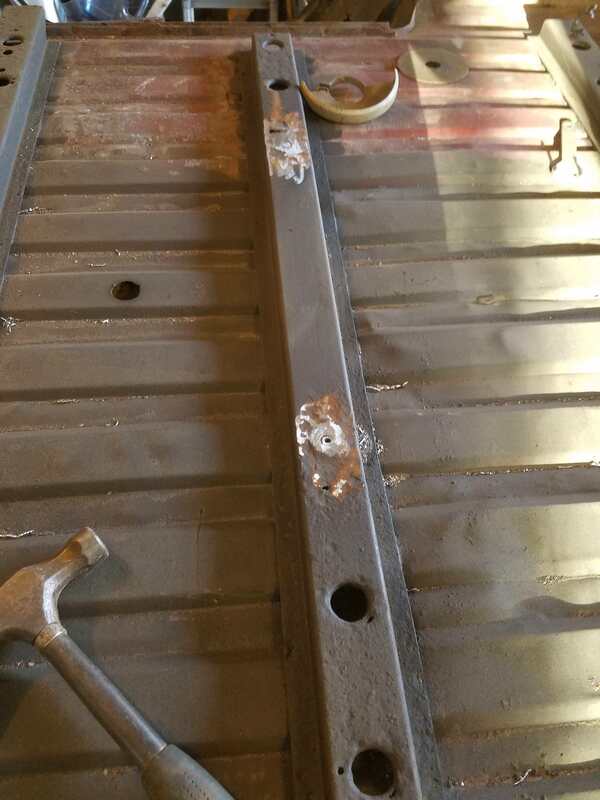 After that, I used my angle grinder to create some top panels out of 18(or maybe 16) gauge steel to fit what I cut out. 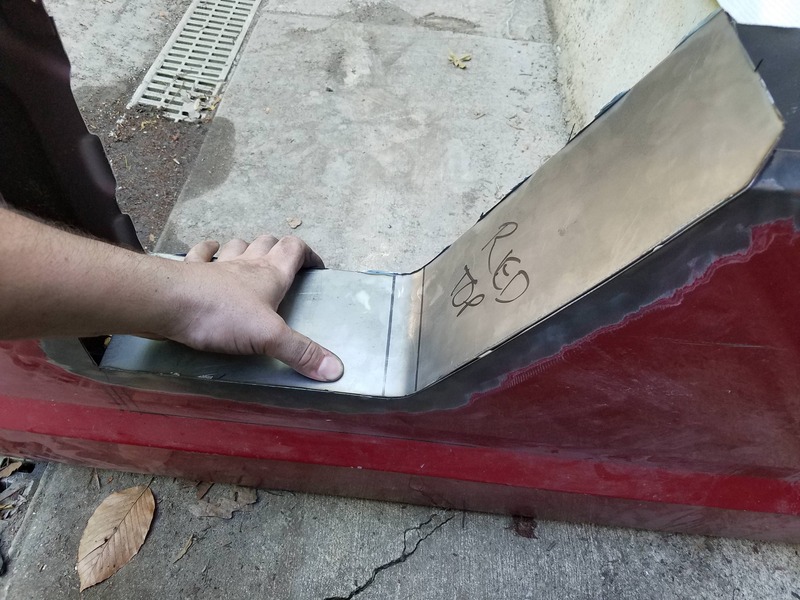 Then, I began the welding. 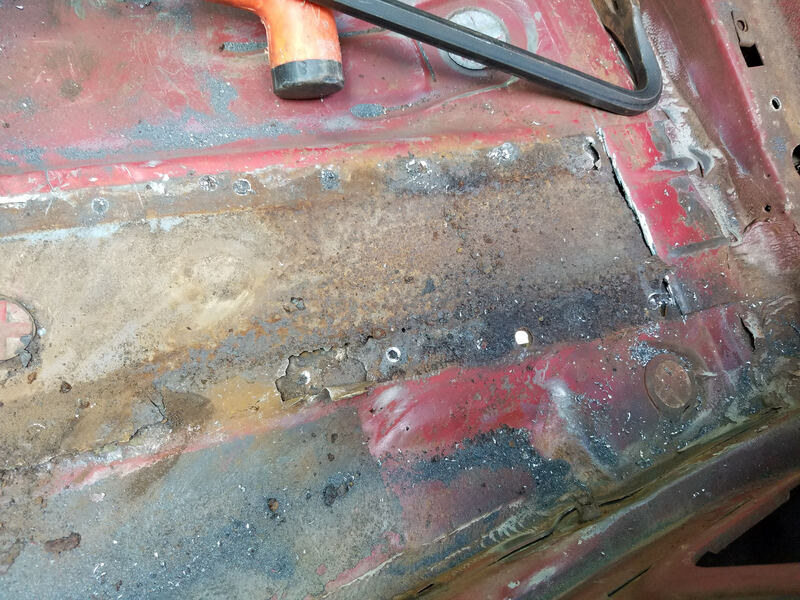 I tacked all the pieces on and then went to doing the spot weld beads across the surface. 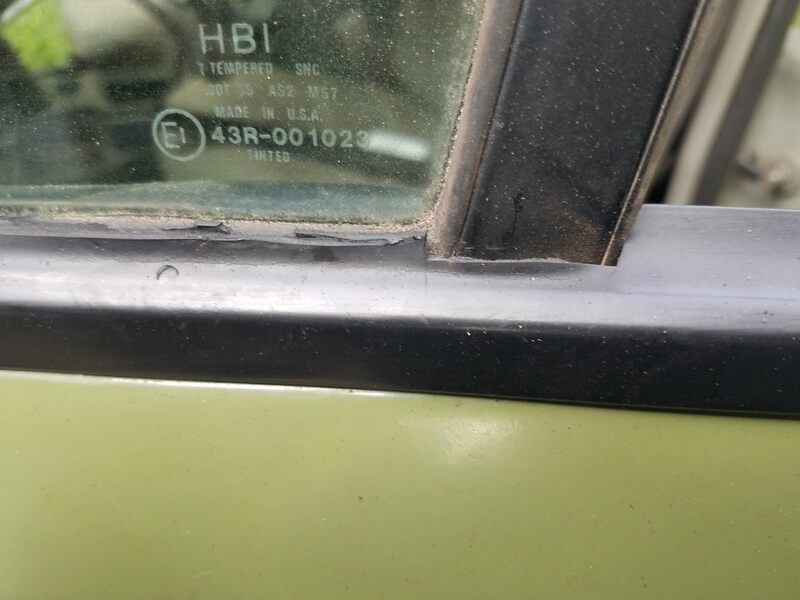 The welds were hard to predict on the doors. I prepped them as best as I could, but in the end, it was all just feeling it out. 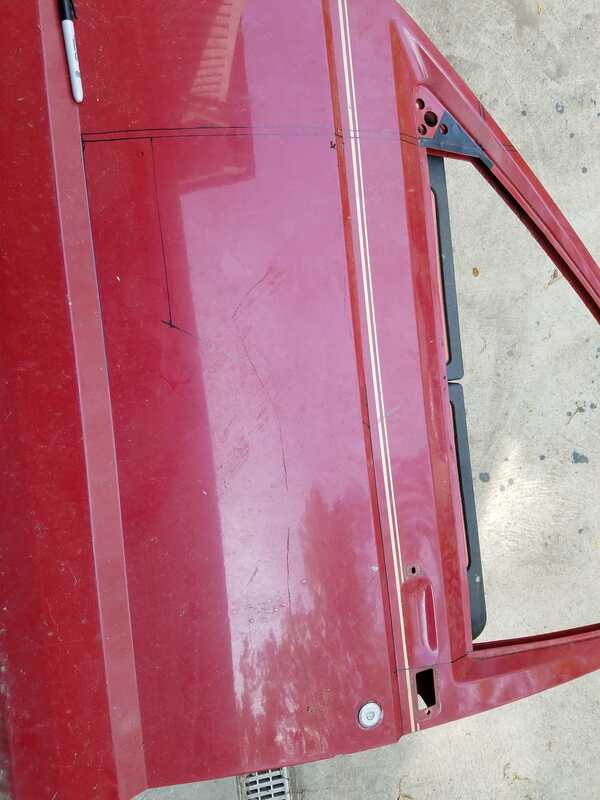 Occasionally, it would punch through the panel, but was easily filled later. 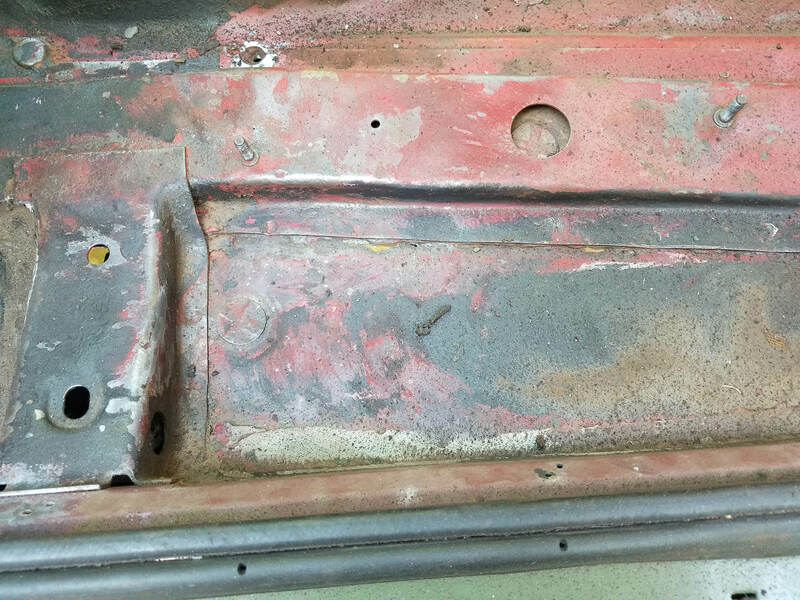 I then stripped everything else off the exposed panel of the door and started the body smoothing. 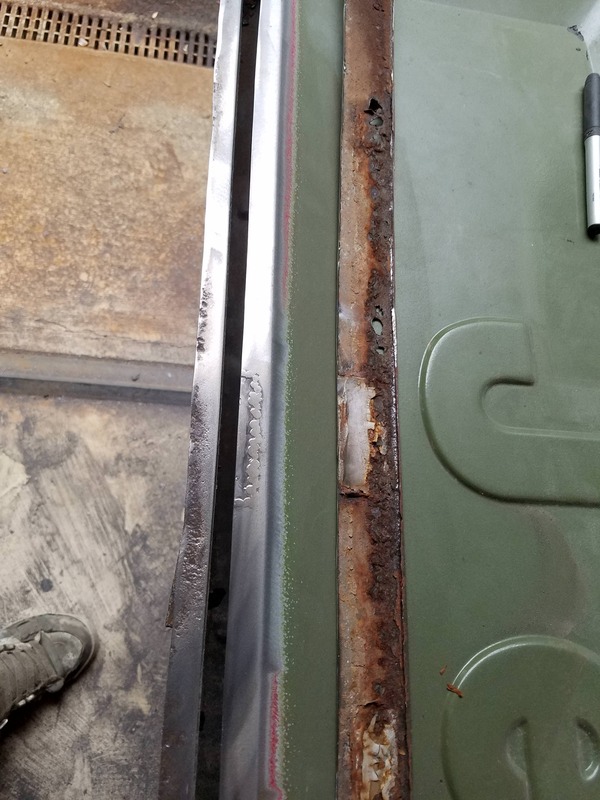 No matter how slow I went, there was still a couple warped sections. After about 3 or 4 thin coats of fill, I started the priming process. 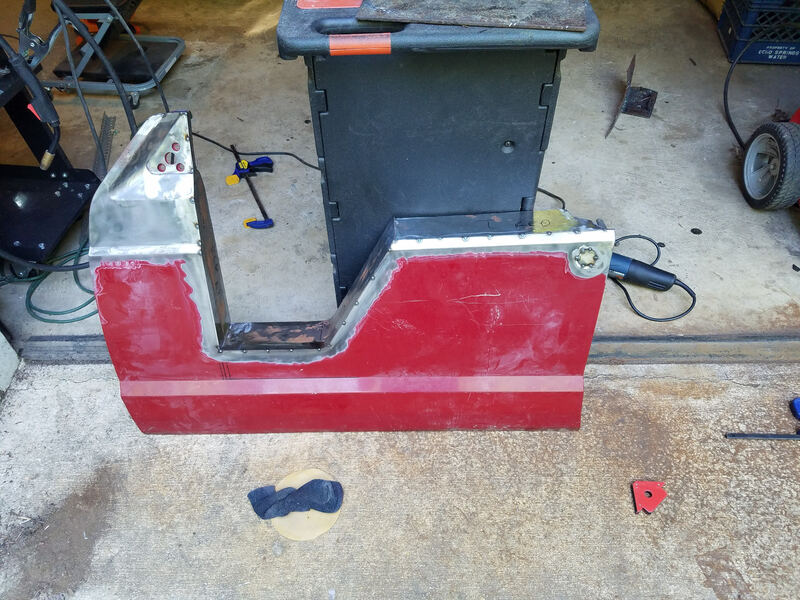 Since I figured out welding, I took the opportunity to start breaking down my tailgate and getting it all cleaned up as well for repair. 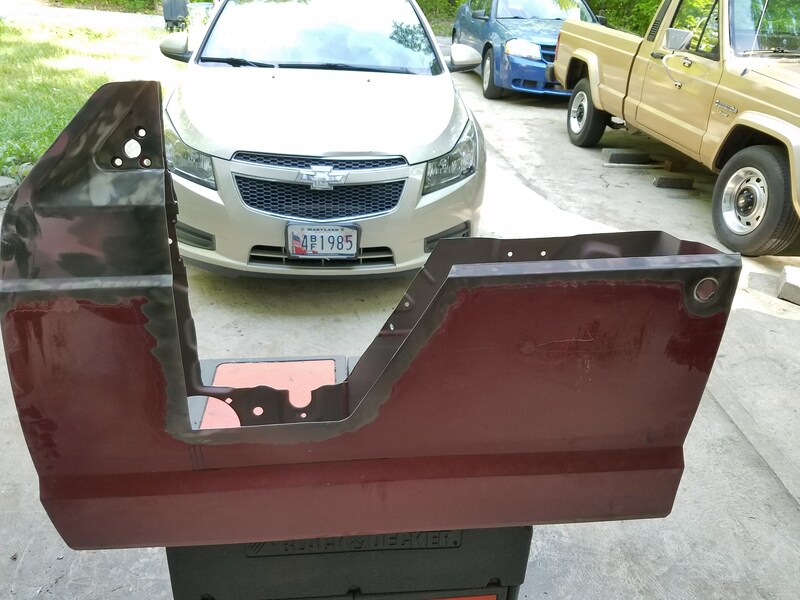 The lower section was all ruined by rust, so I cut what I could out and planned for the next step. The door with all the measurement markup. First Cuts. I left a lot of extra so I could perfect the lines with a flap disc on the grinder. Better to have too much than too little. The other door all cut out but not ground to perfection yet. All ground down to the lines I wanted. Added in some curves where I thought they would look good. Some of the pieces being produced and test fitted. Some of them didn't quite line up like I wanted on the back side, so it required adjustment. 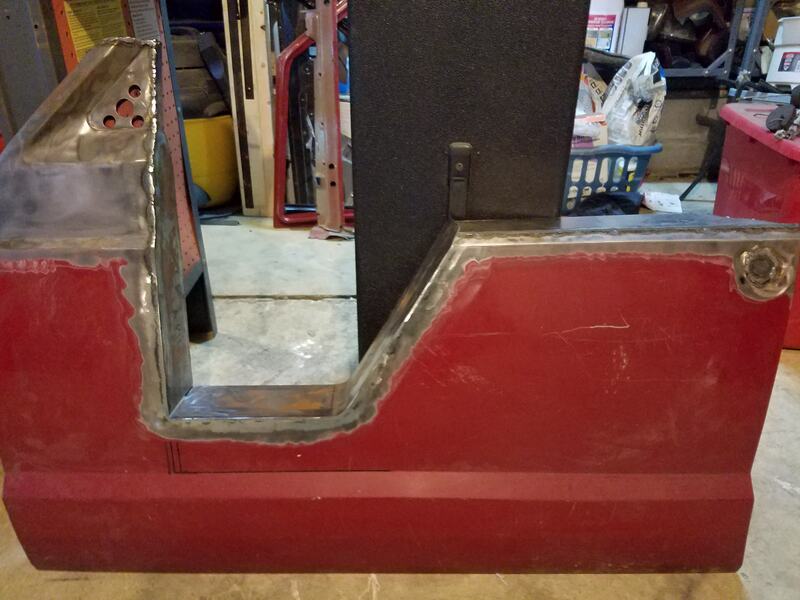 The goal was to have the pieces fold over the back and give a solid edge to adhere to for when the door panels go in them. 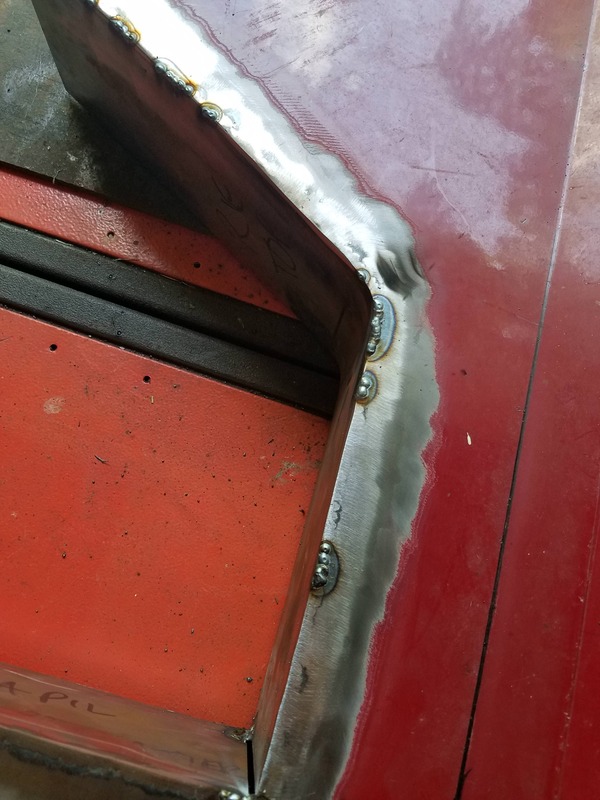 I used relief cuts since I didn't have a press brake to make my 90s. Tacked in but not perfect. Went back later and thinned the edge of that one. All pieces tacked in. I also filled in the lock hole, since that won't be necessary(and I'm a sucker for looks). The fit I was going for since the panels worked into ridges in the back. All the way welded with some minor reworks where I didn't like it or it didn't penetrate enough. 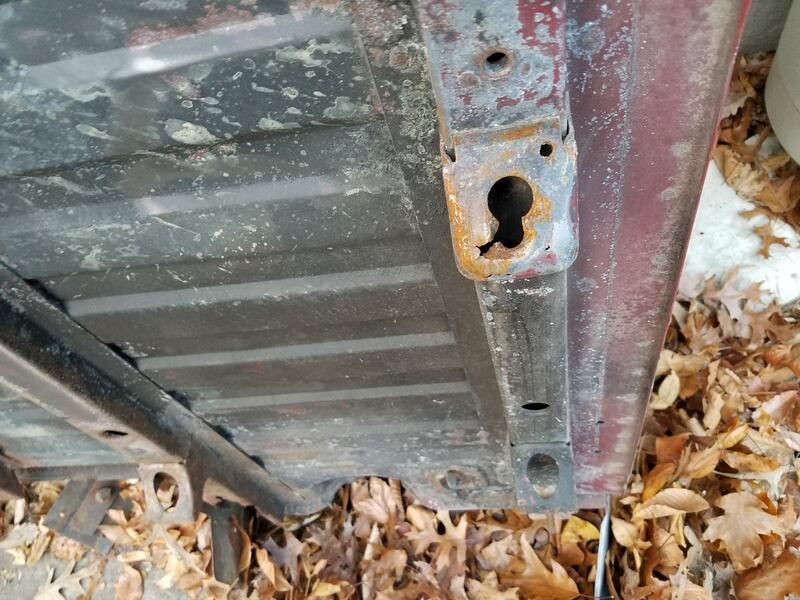 Some rust I noticed at the bottom of the grey door. 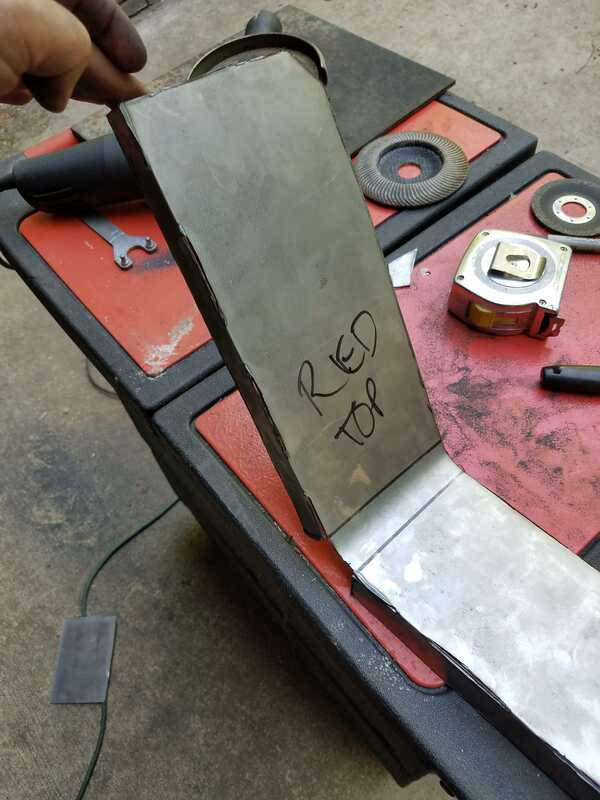 I pulled back the fold from the bottom and got in there good with a grinding disc to get it out. If I'm spending this much time creating them, I don't want them to rust. 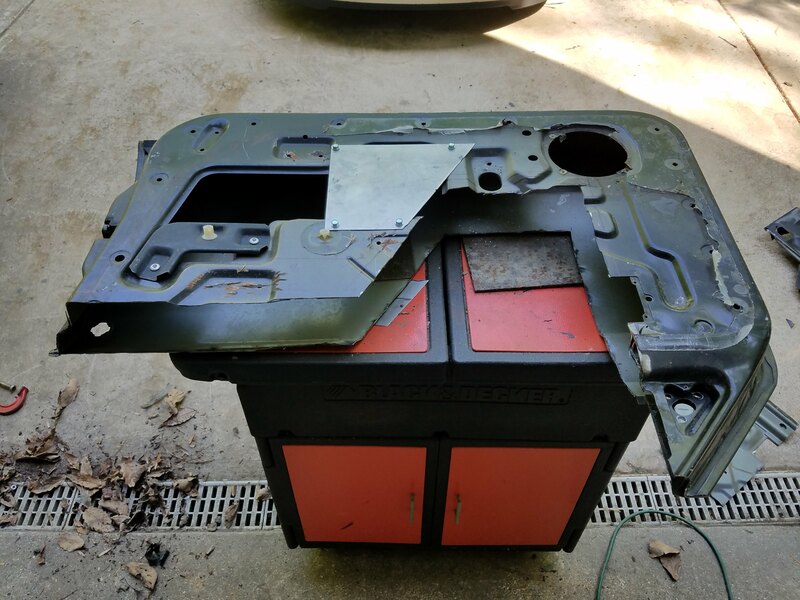 Afterwards, I hit it with rust reformer inside and out. And primed. I still have to strip the back of the doors too. 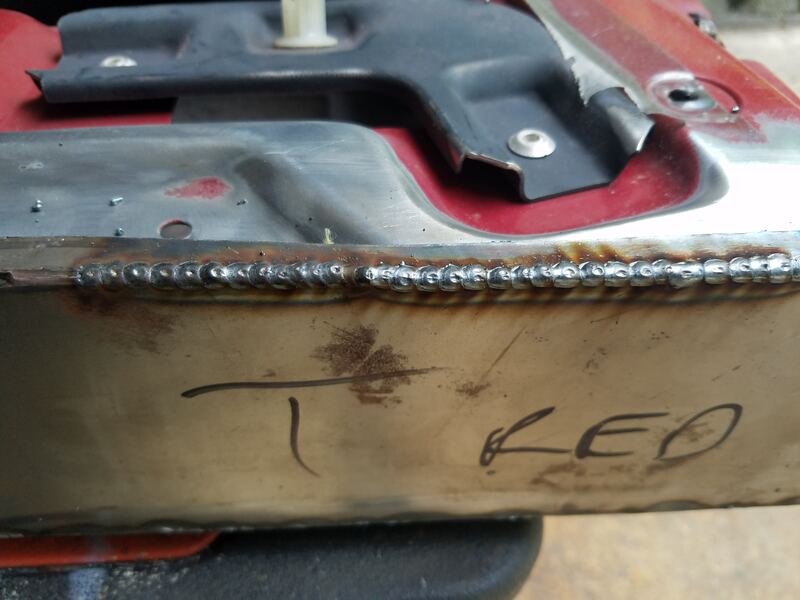 Pretty proud of the welds on the corner of this. 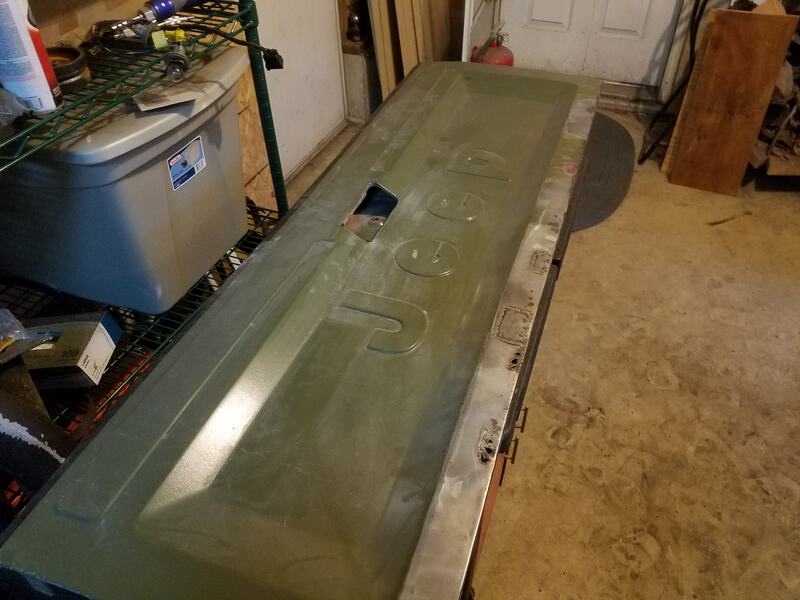 For the doors, the plan is to use half door handles attached at the 45 slope piece I put on there. I have the handles, I just have yet to fit them. I also have a bunch of new decals for the truck too when I get it back. Shouldn't be to long before the doors are finished. Thanks, I'm trying. Never too late to get another one though. So I've been working on a few things recently. 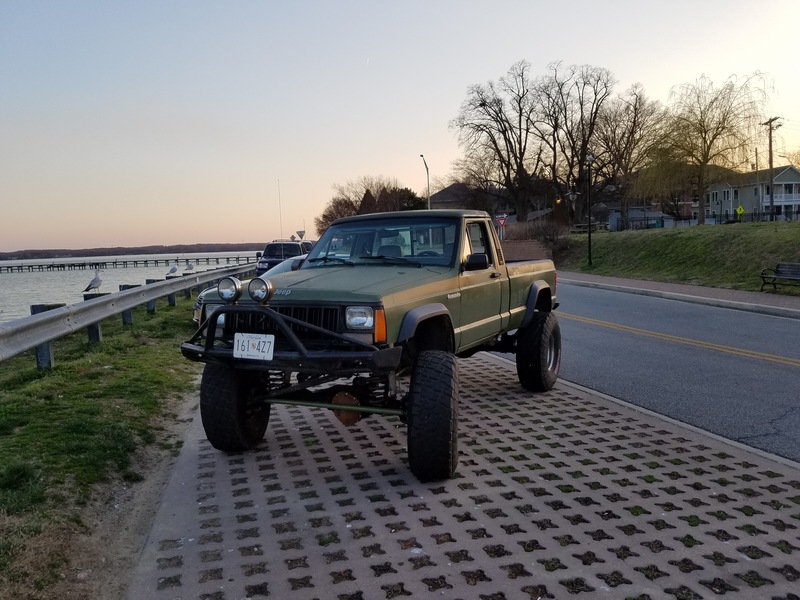 I finally got the truck back so I was able to drive it for a week or so before moving onto my next step. 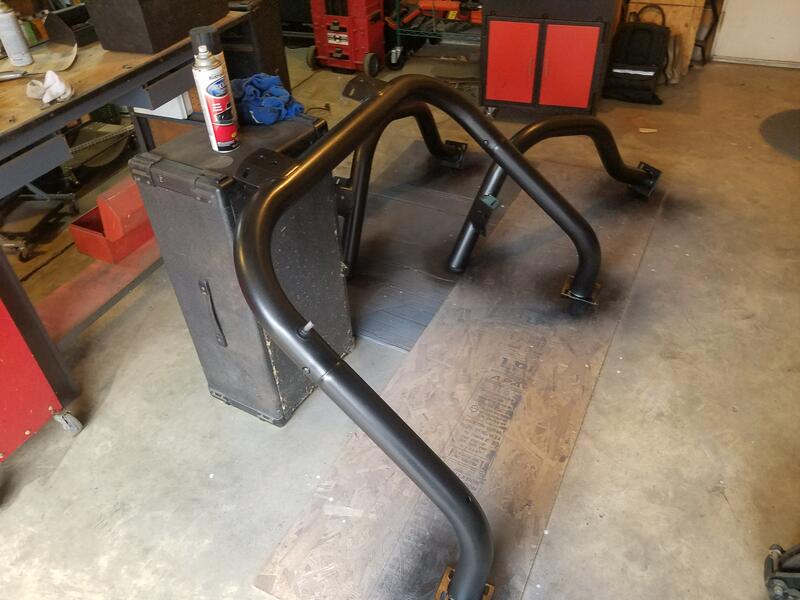 The guys that worked on it welded on some solid 2x8 steel tube for rock rails in the place of my rockers, which were rusted out anyways. 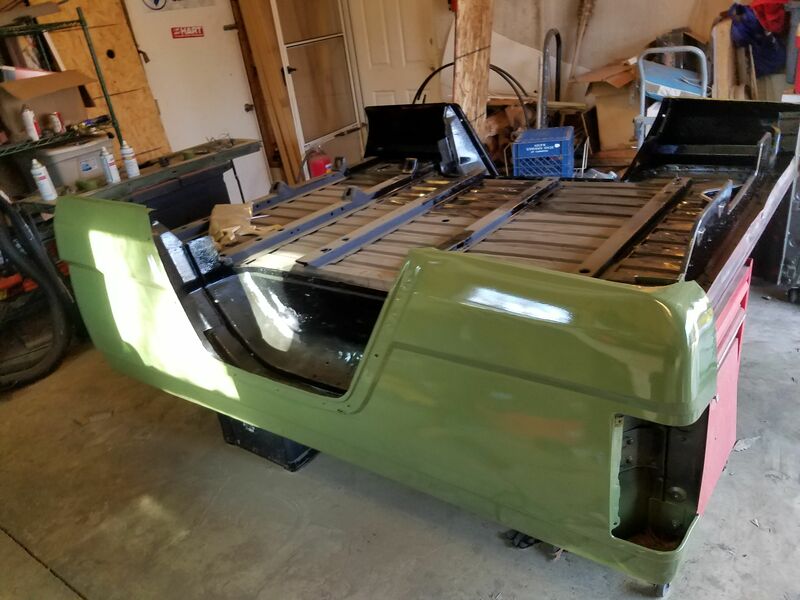 Rather than tube to frame, for the most part, they just beefed up the torque boxes to handle the load and plated the entire front end. 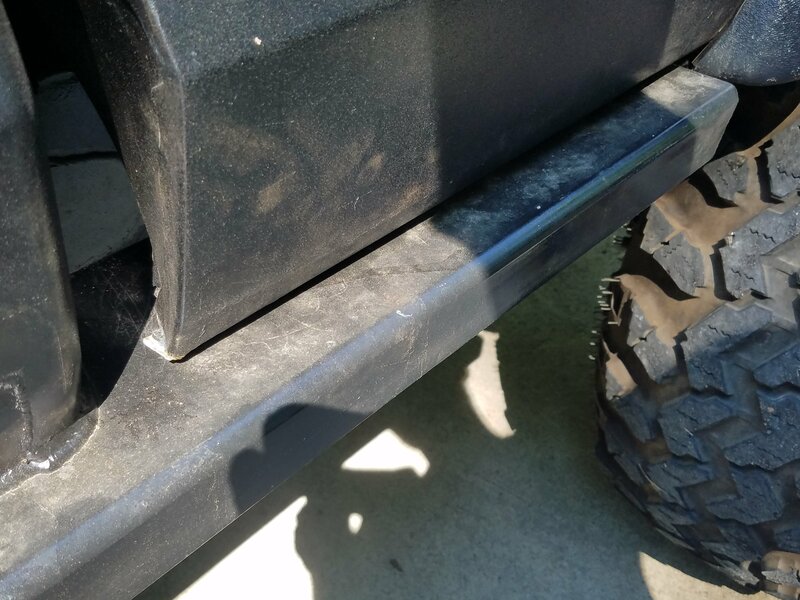 They ended up taking the slack that would contact the rock rails from the bed and fender, and folded it over instead of completely cutting it off, which made it sturdier and better looking. 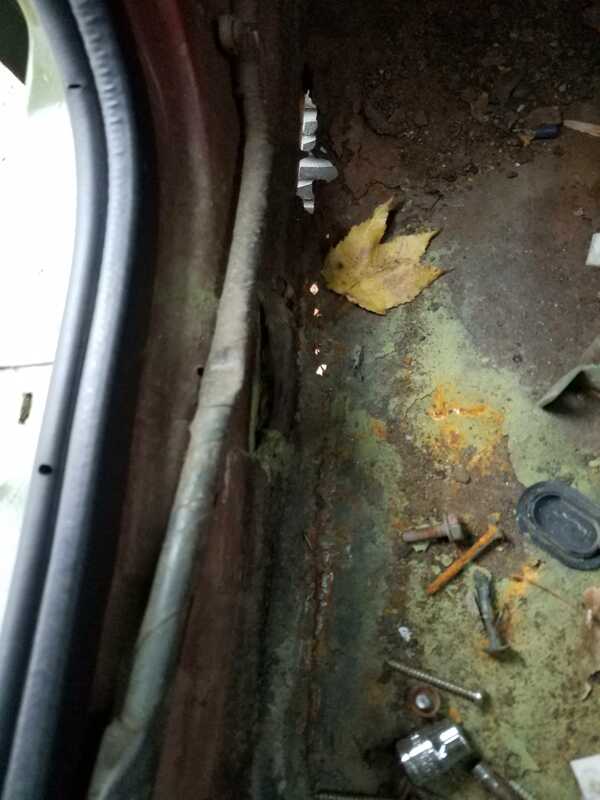 They also welded in a new door striker on the drivers side to replace the old poorly attached unit and patched a section of the floors that was rusty too. 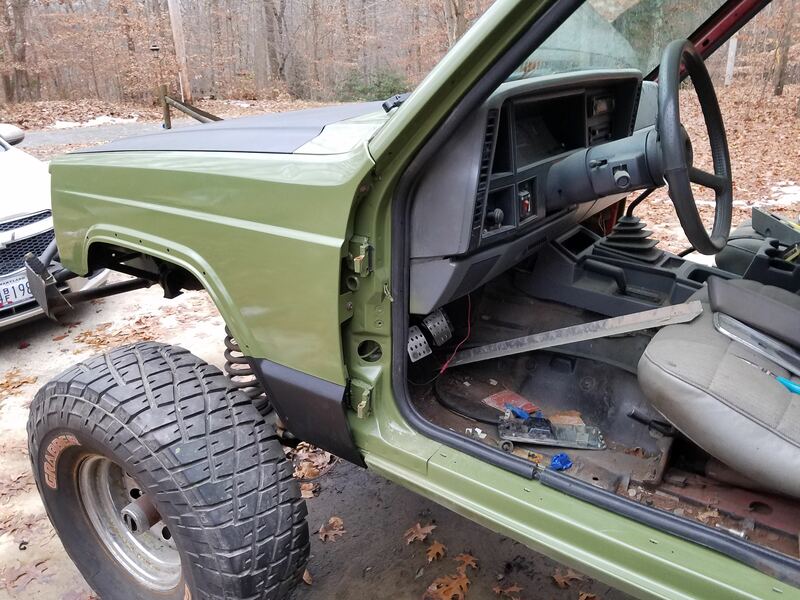 My plan after that was to take the interior out an put down some sound mat and bedline over it for a durable interior again. This is all well and good, but I could see certain small bits of the floor around the rail cap that had small holes and were rusty. So I ended up having to pull up some of the section they had just done to remove the rail cap altogether and see what I was working with. Spoilers: I was working with nothing. 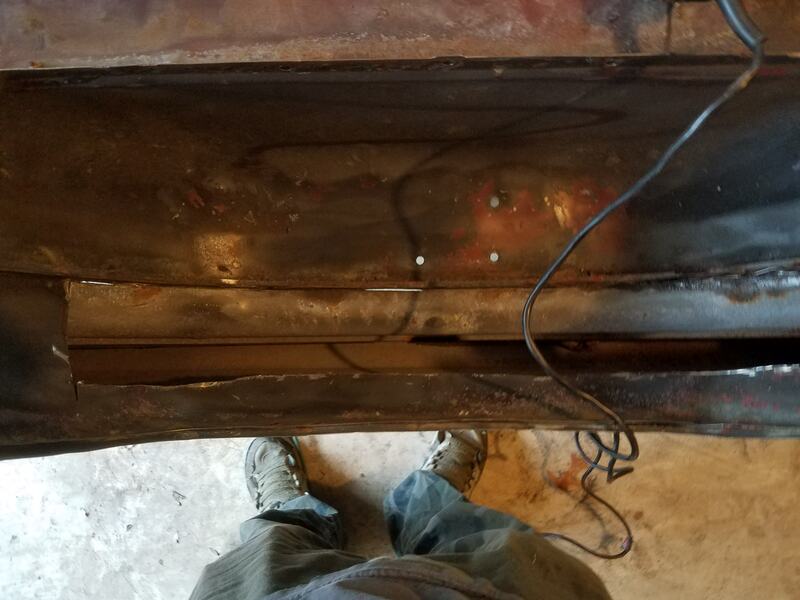 The floor in between the rail cap and the frame was just about non existent, which means I have a lot of floor welding to do. 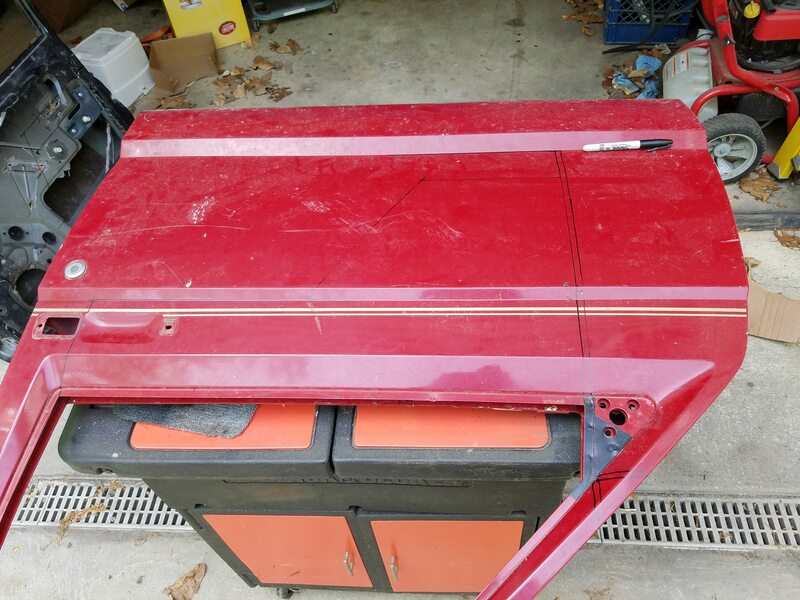 The only positive to this is that it gives me a look inside the rails, which aren't too bad but could use some cleaning and proper treatment. 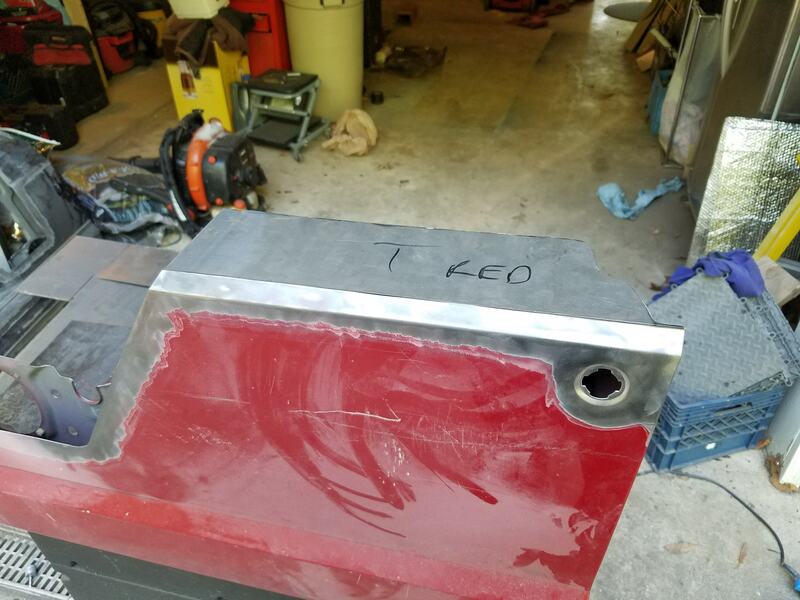 During this repair, because there are bolts coming into the frame, I figured I should drop my TnT skid plate and repaint that while also getting a look at the bolts and repairing whatever needed it. This would be simple if the bolts still existed. 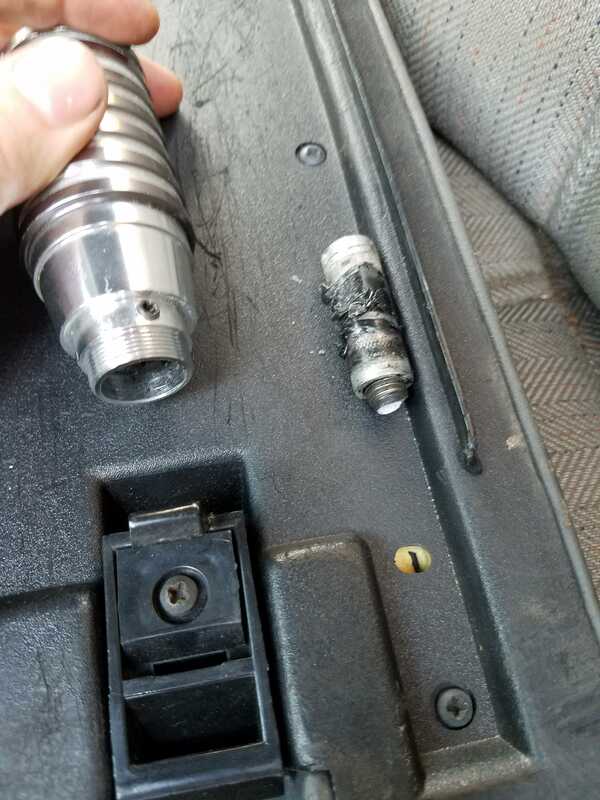 I didn't even get to use the ratchet before the bolt was suspiciously loose. 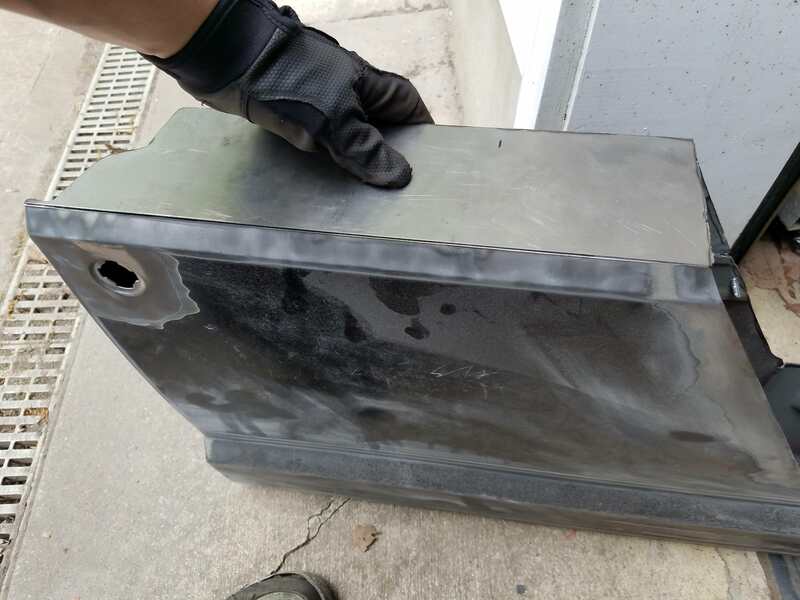 They were too rusted to save and sheered themselves off at the bottom. 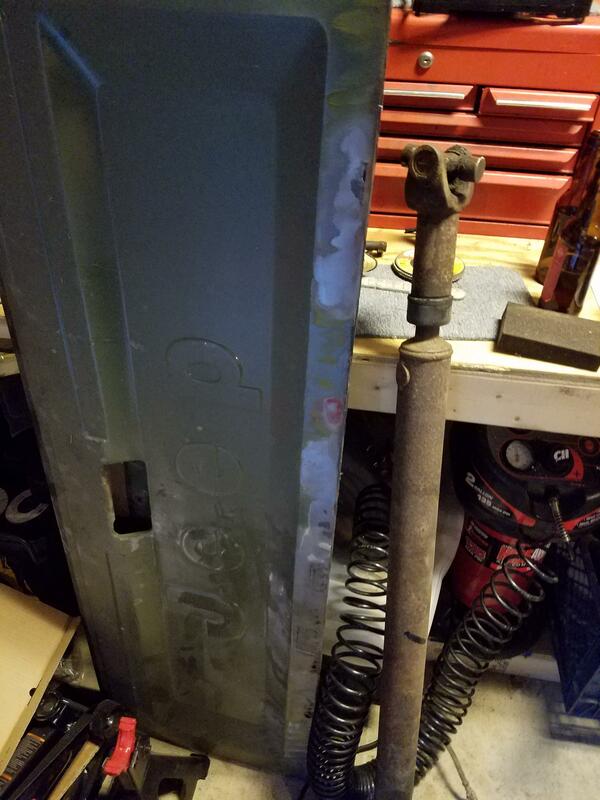 So now I have to drill them out, although I'm tempted to take my dremel tool and just cut the rusty tops out of the rail and weld in new ones, since it's all accessible. 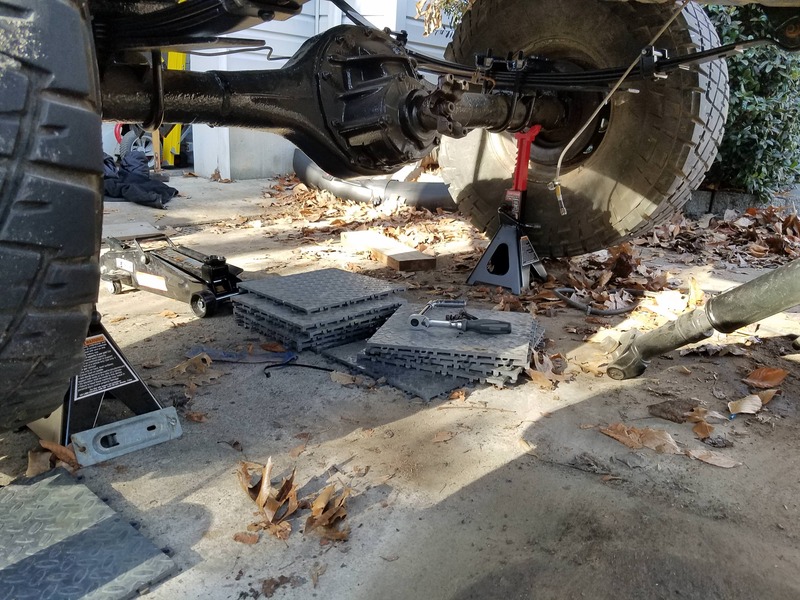 having the floor cut open also allows me to get the the nuts behind the skid plate too, so this is as good a time as any. 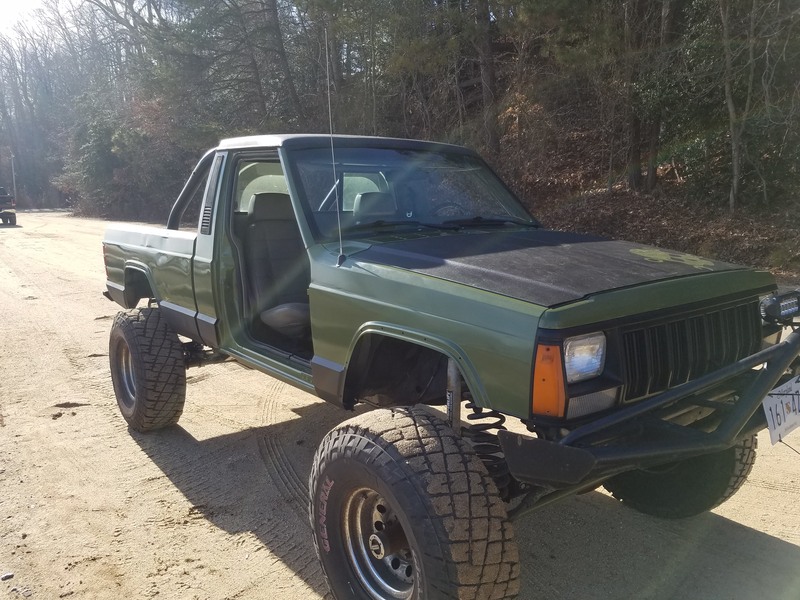 I'm also tossing around the idea of taking the transmission off and replacing my clutch since everything else will be gone. 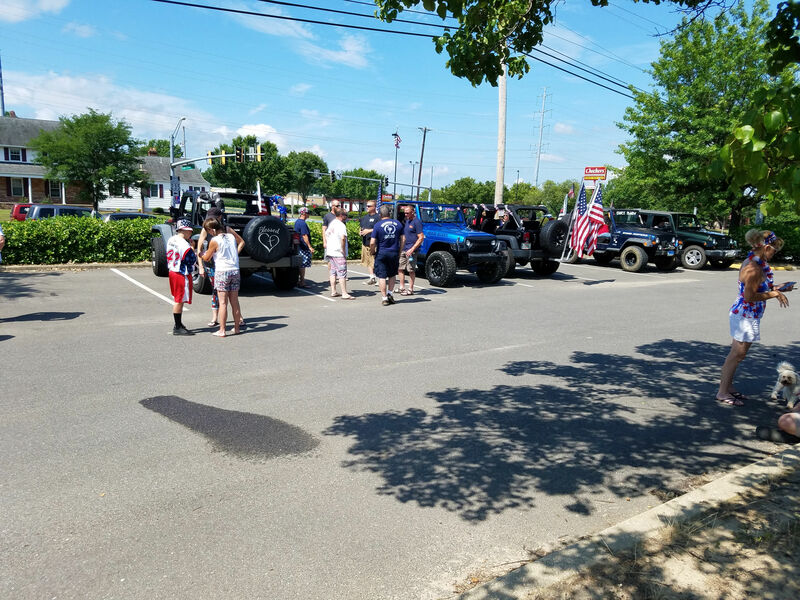 In the time I had it running around I took it to a Fourth of July parade and ran it in that, which was fun except for the fact that it's a manual at very slow stop and go speeds and there's no AC, so I was burning to death. Still fun though. 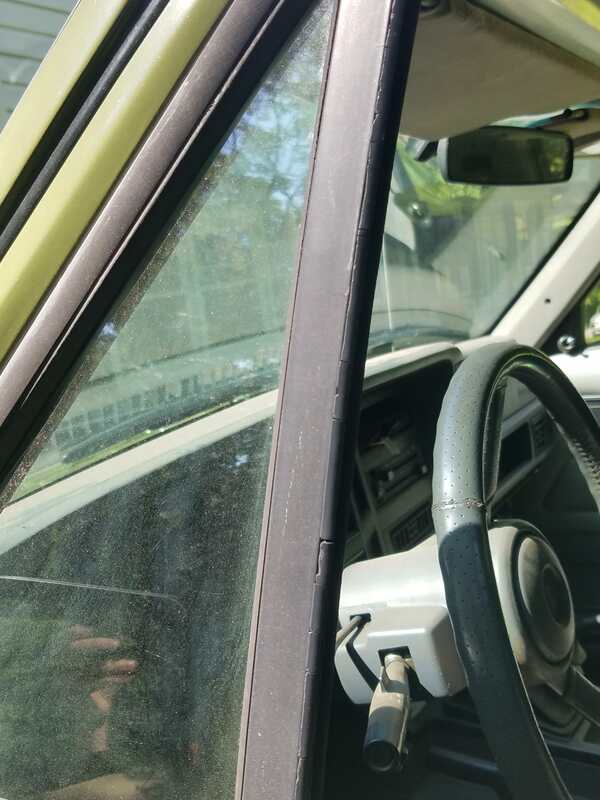 I also replaced my exterior window sweeps with late model cherokee ones, which required a bit of modification but give a much better and more durable overall appearance. Was thinking about making a write up for it on here if it hasn't already been done. And the last thing I did was added my stickers to it. I didn't really want to put badges back on it, so I went with stickers instead that compliment the overall black and green theme. At the show. Too hot for doors. While I was at it, since I was taking the corner windows out, I replaced the cracked up seal there with ones from an extra set of corner windows I had lying around. A patch they had to do on both sides because the cab corners were pretty rough. I still need to do the body work over them. You can also see how they folded the edge of the bed for the rails. 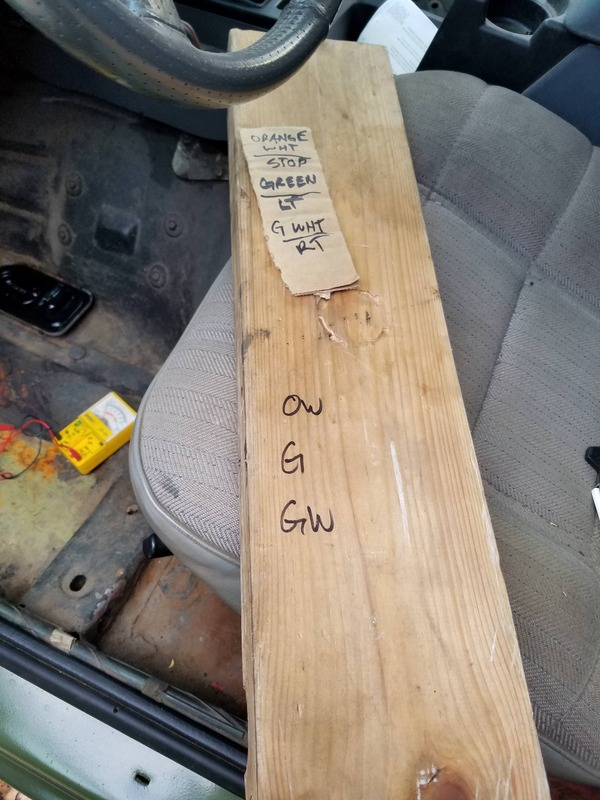 Floorboard hell. 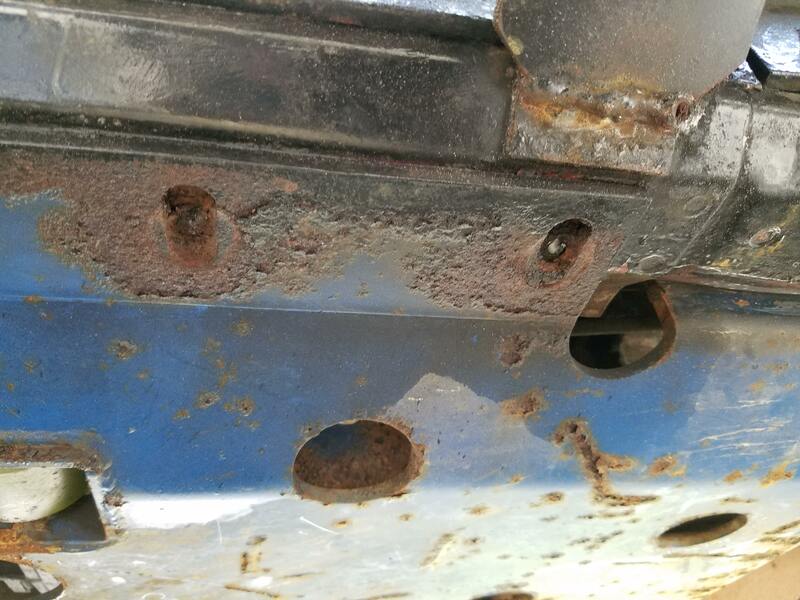 Little holes along the rail and a complete hole beneath the torque box. After I pulled the torque box top off. I use those words lightly, since it was mostly prying. 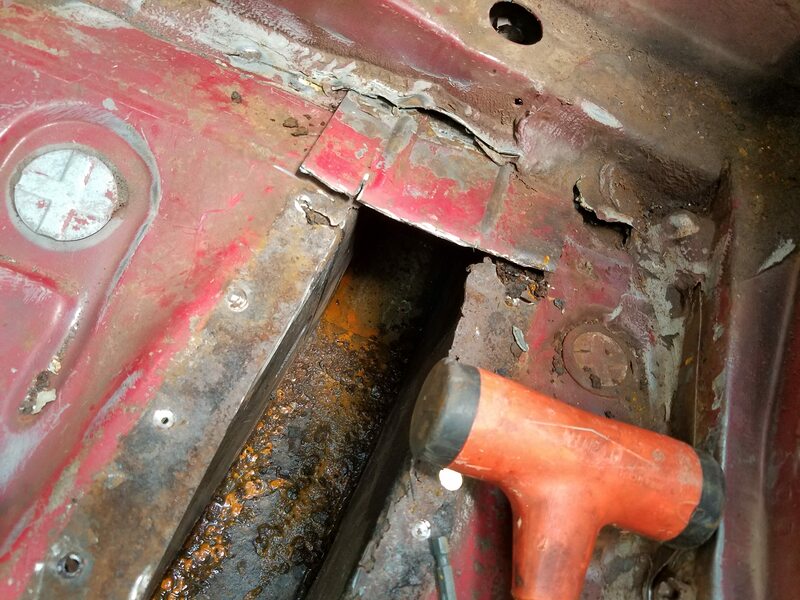 The PO had, instead of fixing the problem, just ground the edges of the frame rail and the torque box down and welded them all together. After getting the rail cap off. 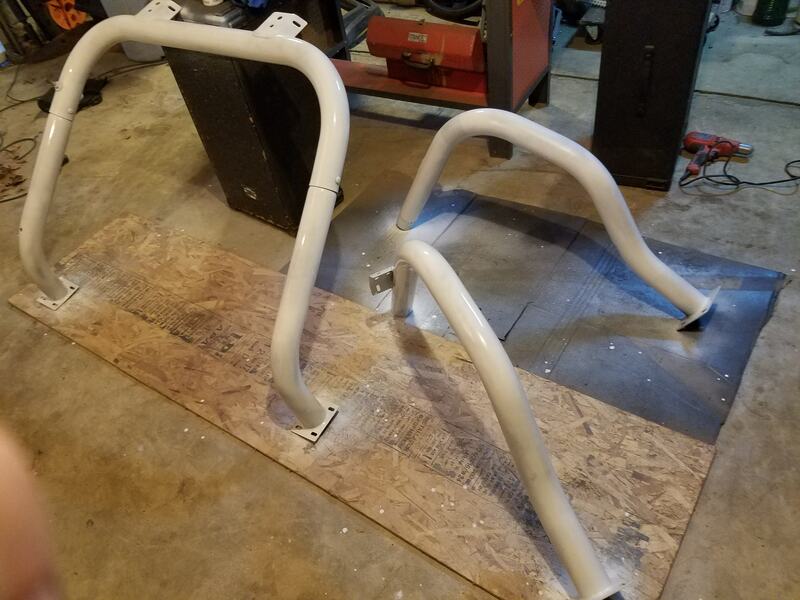 The rails so far. Not too bad but not exactly good either. Water is still getting into the frame rails from somewhere, but I'm not sure where. The messed up end of the rail cap. 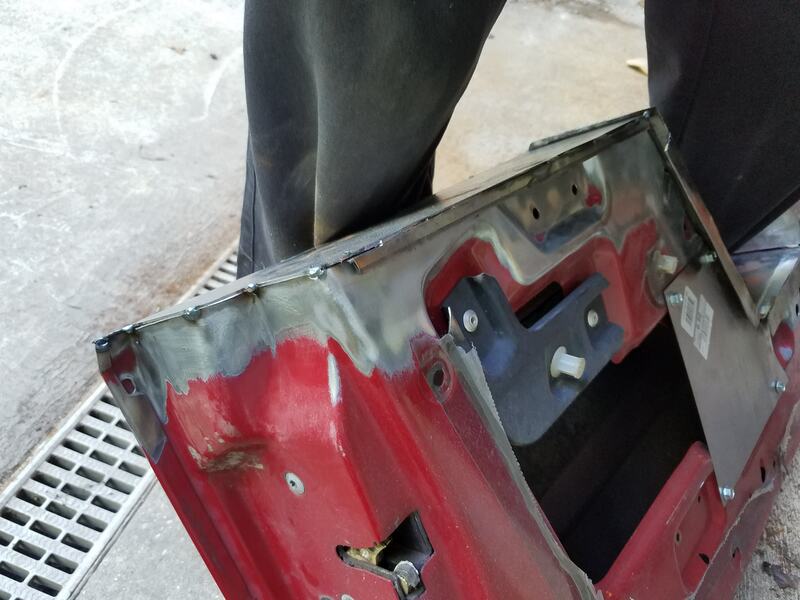 I think I can fix it with a few welds and maybe some gussets. 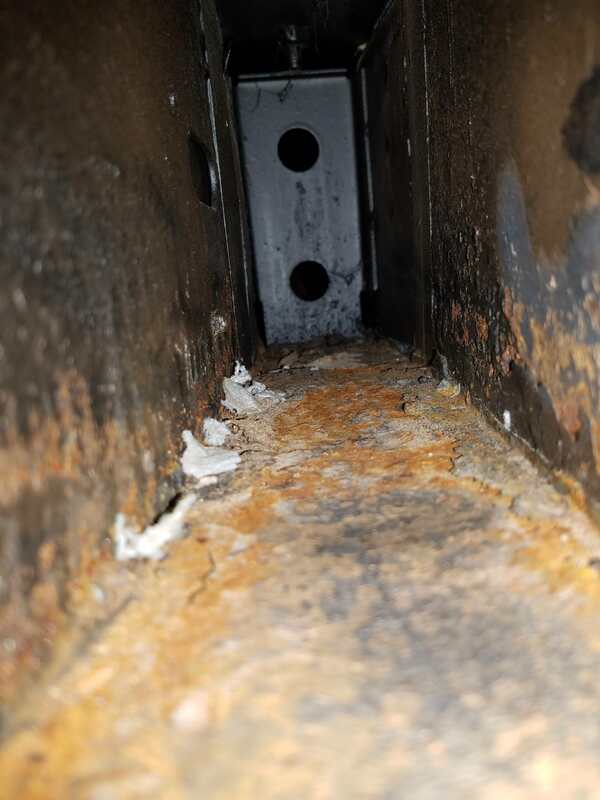 The prior welds where someone tried to fix the floors before, but clearly couldn't weld at all.... Just a load of metal all on top, nothing actually binding the pieces. 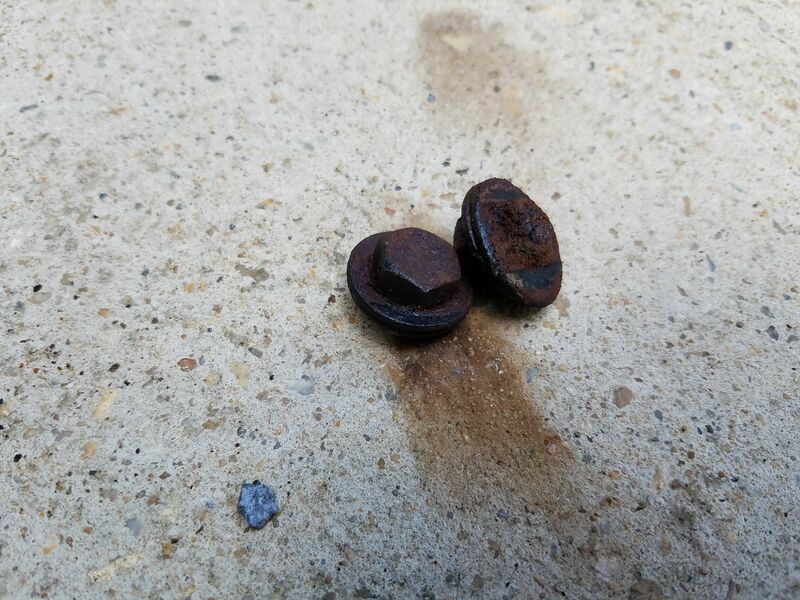 Skid plate bolts, or whats left of them. Anyways, still a lot to do, so I'll try to update every now and then. 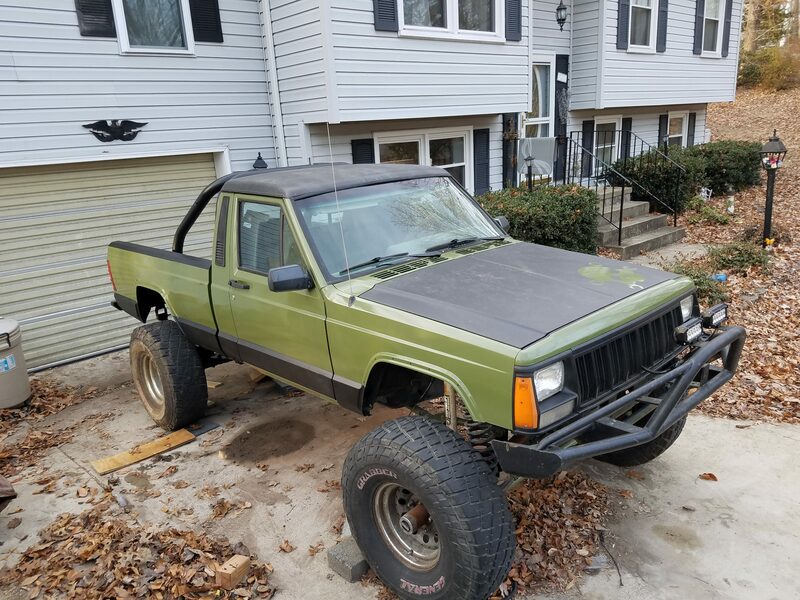 Its had its ups and downs. 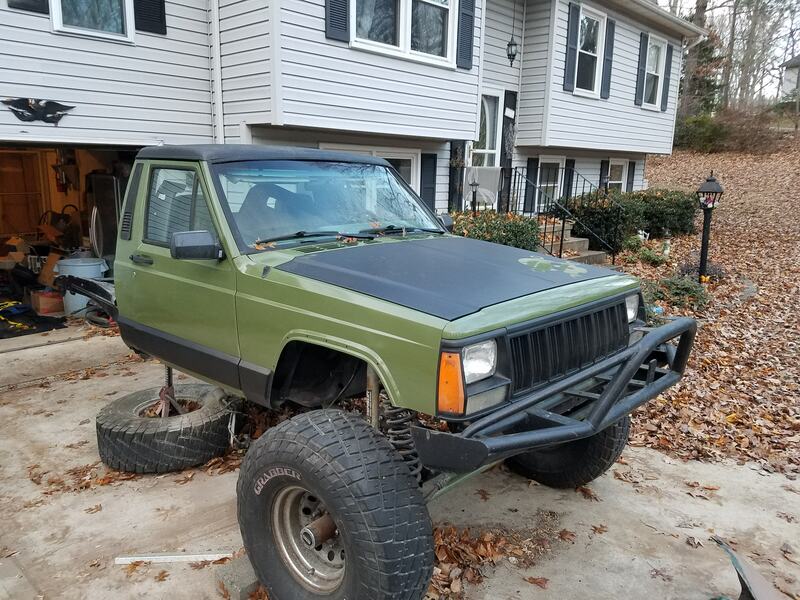 I'm glad I didn't sell it back when I was broke. Never would have imagined it at this point. I was planning on grinding out the lot of it and get it down to base again, and then hitting it with some POR 15. I'll be doing pretty much the entire frame in it, so why not the inside of this section too. 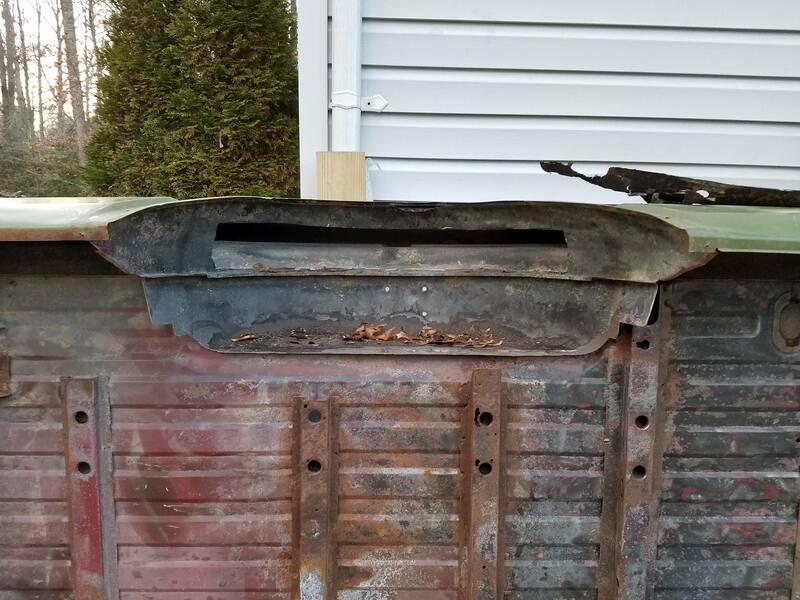 I'll look up that rust bullet and see how it stacks up. 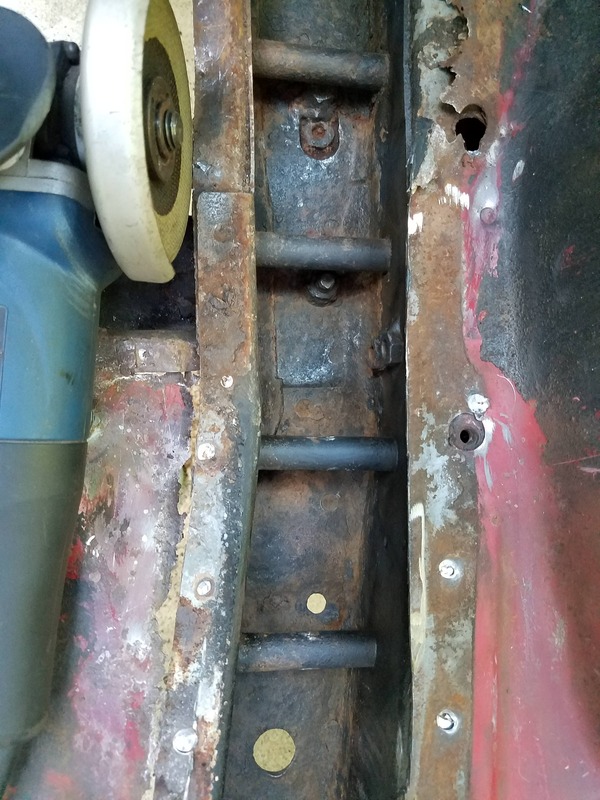 Right now, I'm waiting on the floor pans to get in, but I figure, while I have holes in the floor, it gives my easy access to the backside of the skid plate bolts, so it comes full circle.